One Day on and around Hill 582 brought us plenty trains and 240 photos (thanks to the "digital era"). 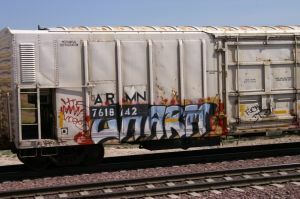 all photos by WM are not marked. 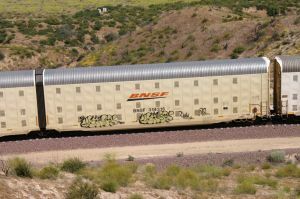 Guest photographer: Don E. Toles (DET) USA. 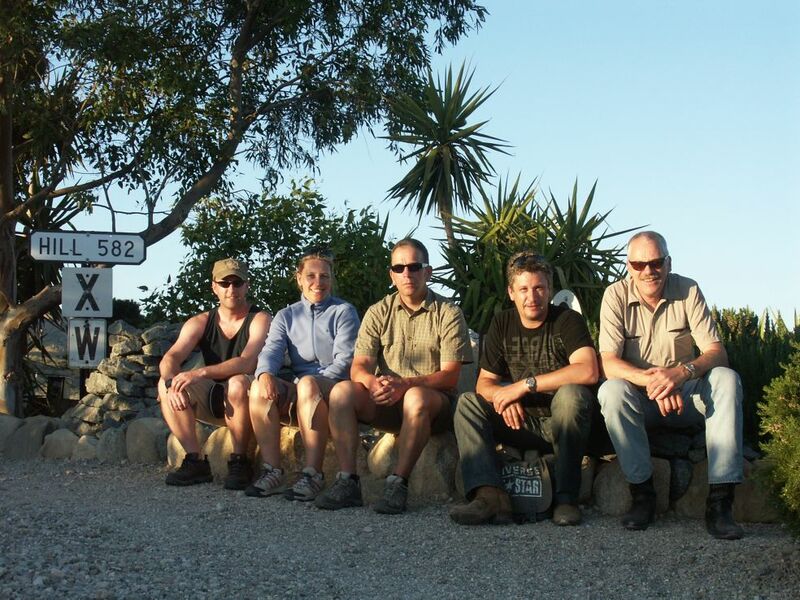 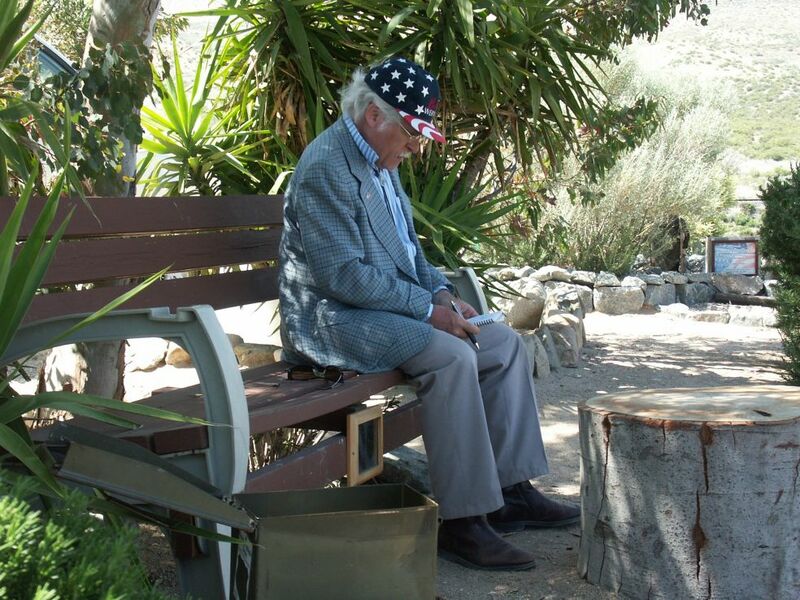 Tuesday, June 1, 2010 - the day when we met our 5 Swiss friends (photo 1141) on the Hill. 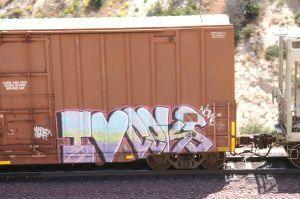 We spent several hours (approx. 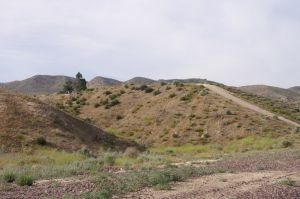 7 hours) on and around Hill 582. 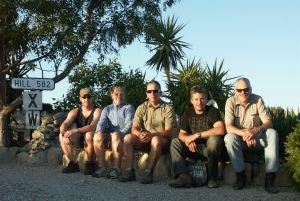 No question, we had a great time together and made lots of photos from diff. locations around the Hill. 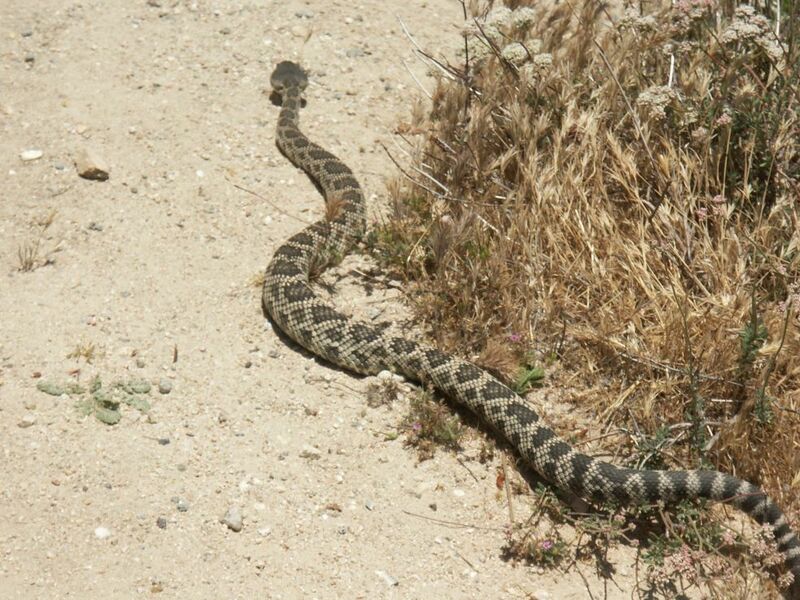 Today, we had another visitor on the Hill. 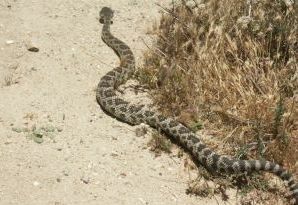 "Robbie - the Rattler" is, of course, a real rattlesnake. 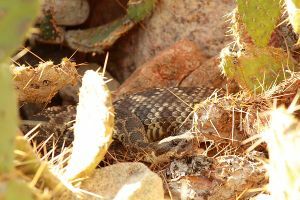 Eugen saw it coming up to the Hill and afterwards "Robbie" went in between the rocks and the cactus (South side) to take a rest and enjoy the sun (Stefan took photo 8370). 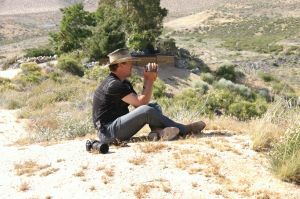 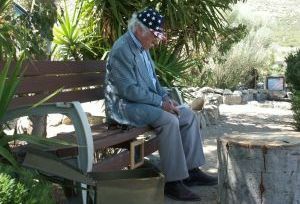 So, whenever visitting Hill 582, be prepared and watch your step. And on top, when these snakes are coming, we do not hear them. 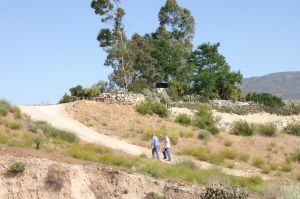 Don provided the photo of the new warning sign on the Hill. 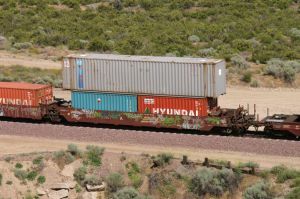 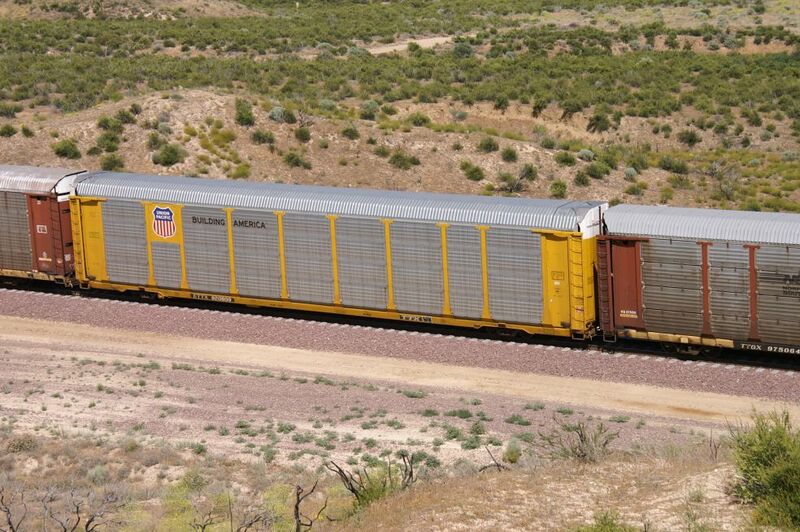 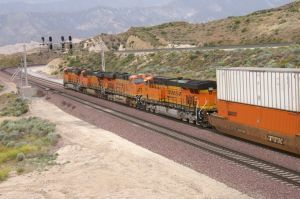 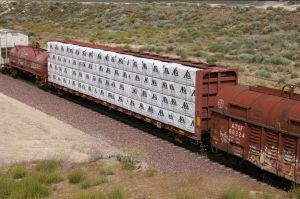 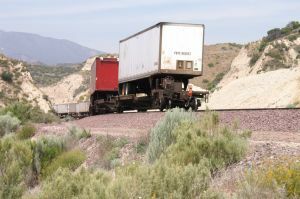 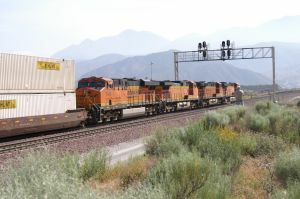 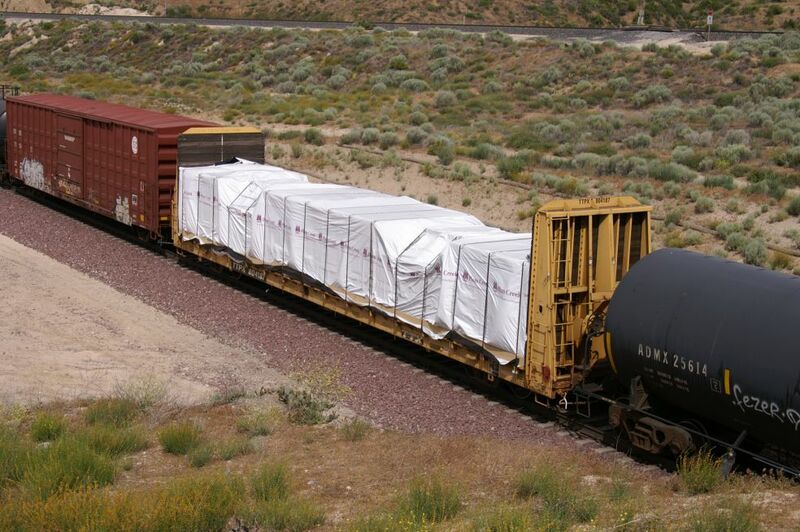 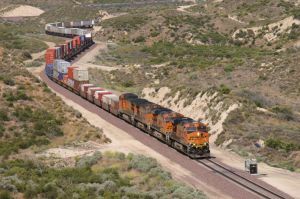 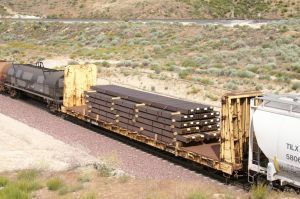 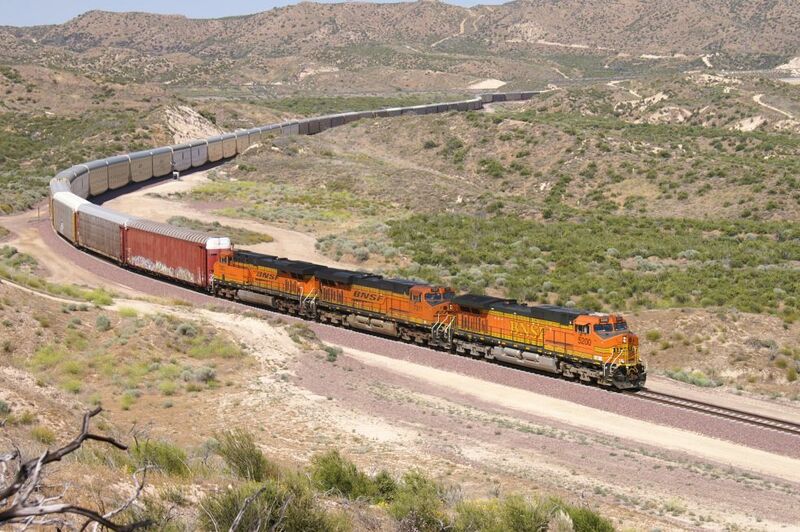 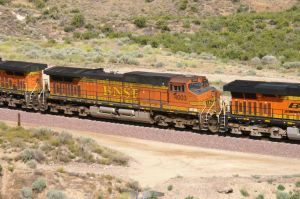 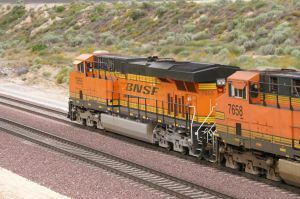 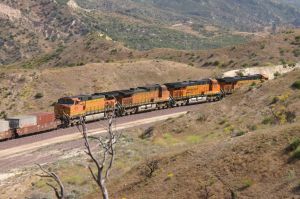 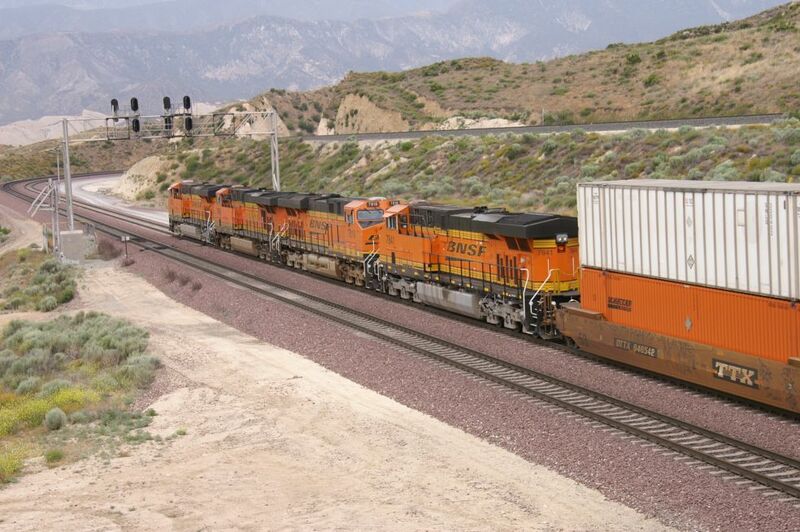 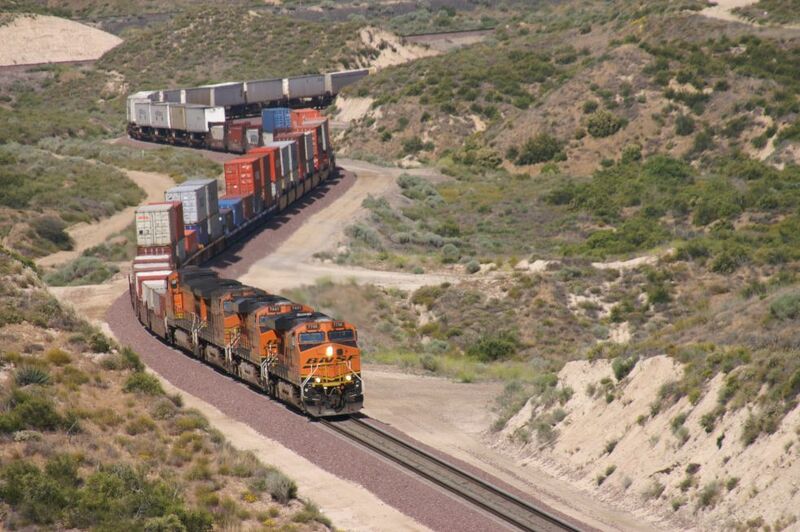 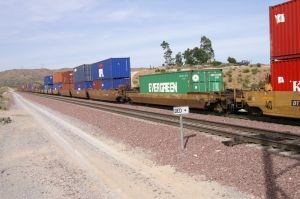 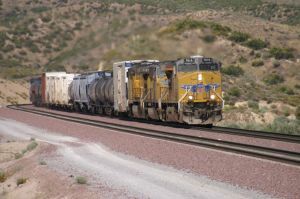 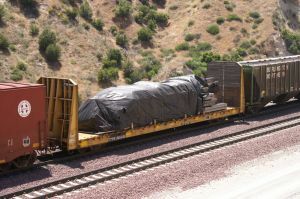 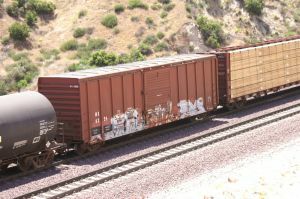 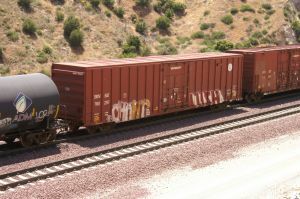 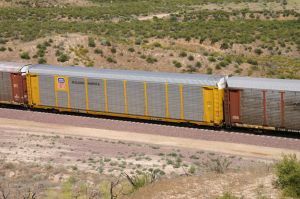 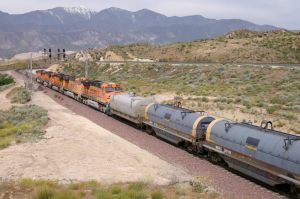 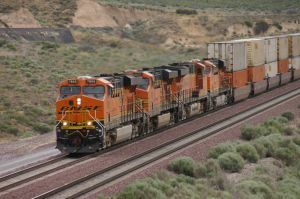 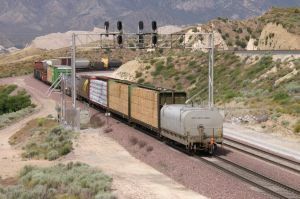 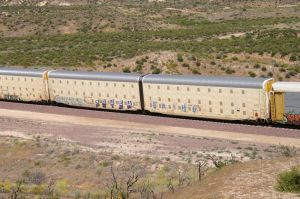 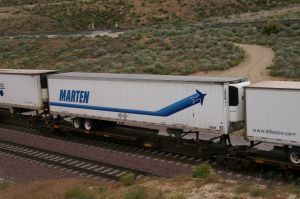 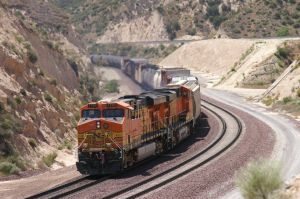 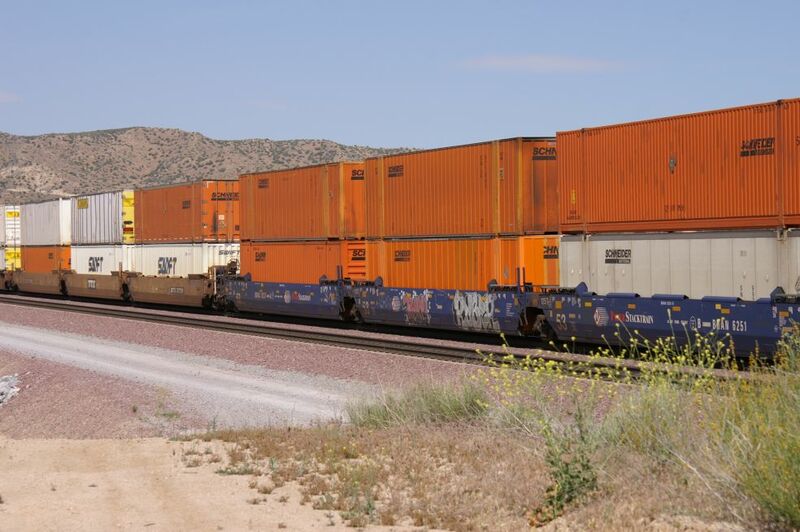 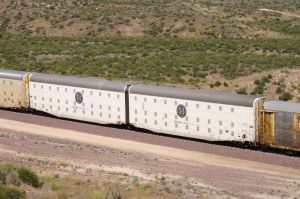 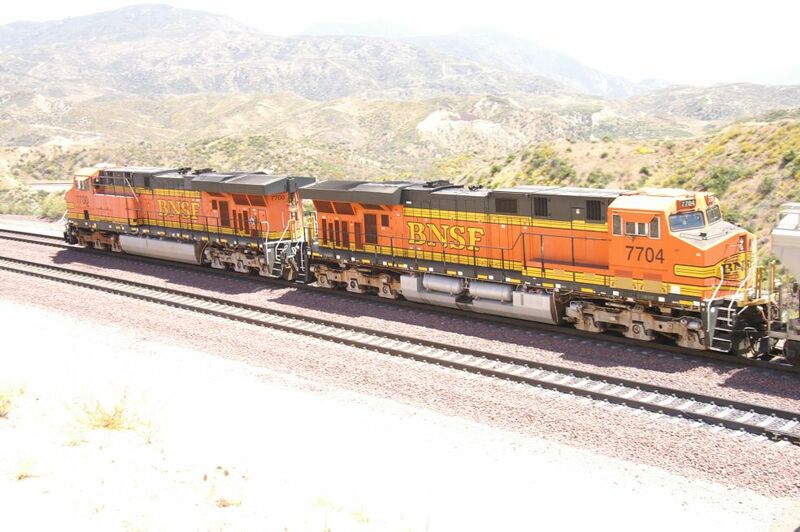 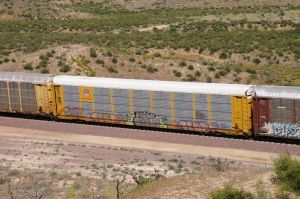 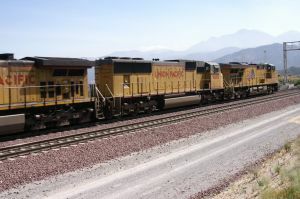 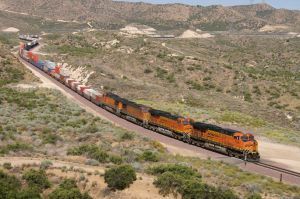 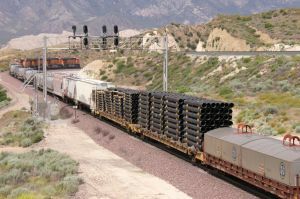 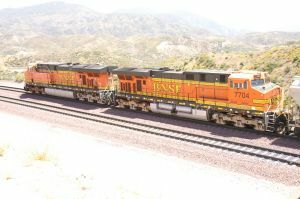 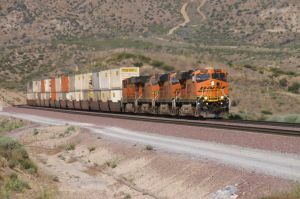 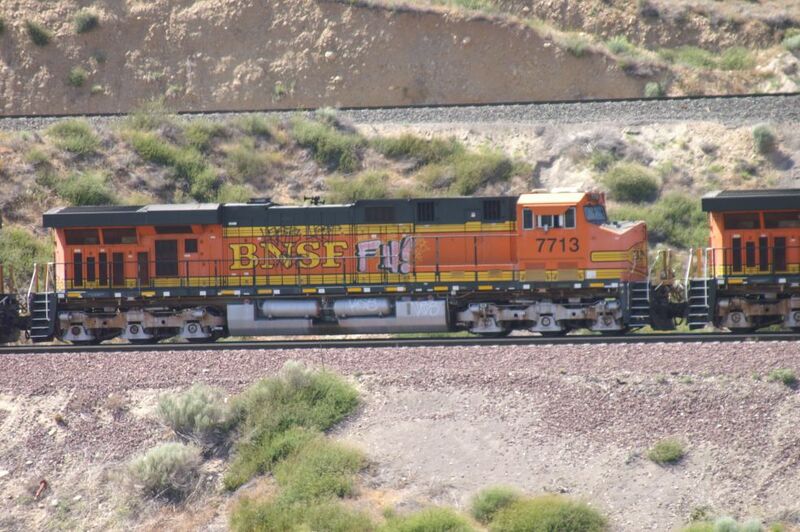 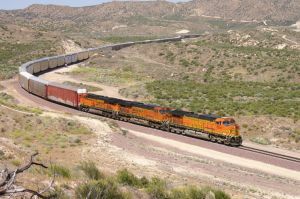 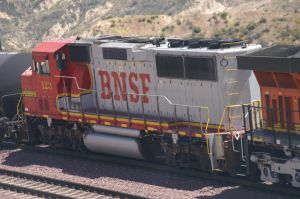 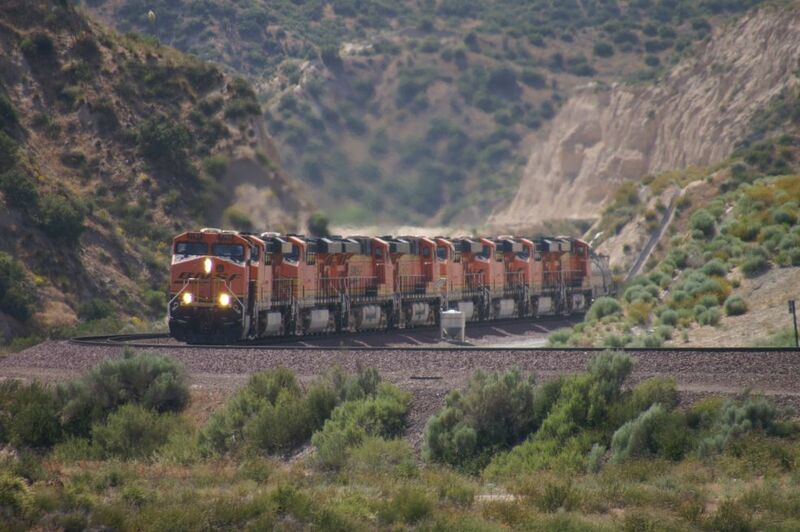 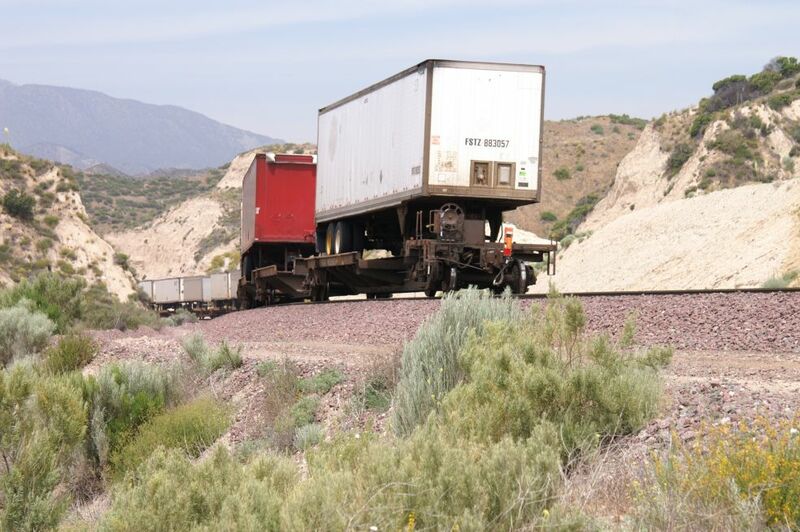 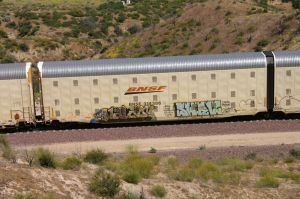 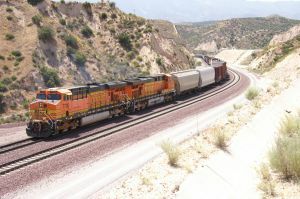 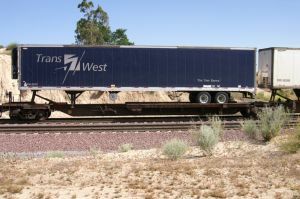 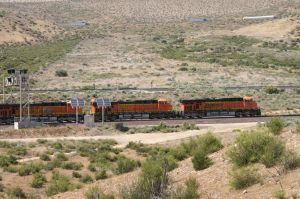 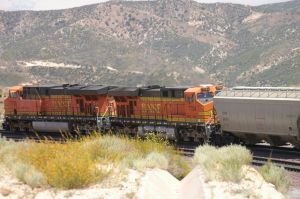 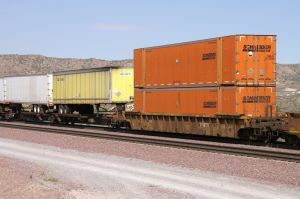 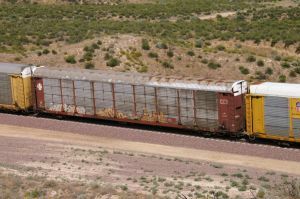 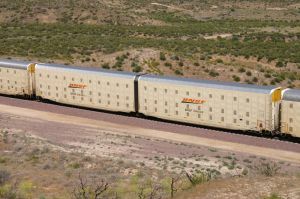 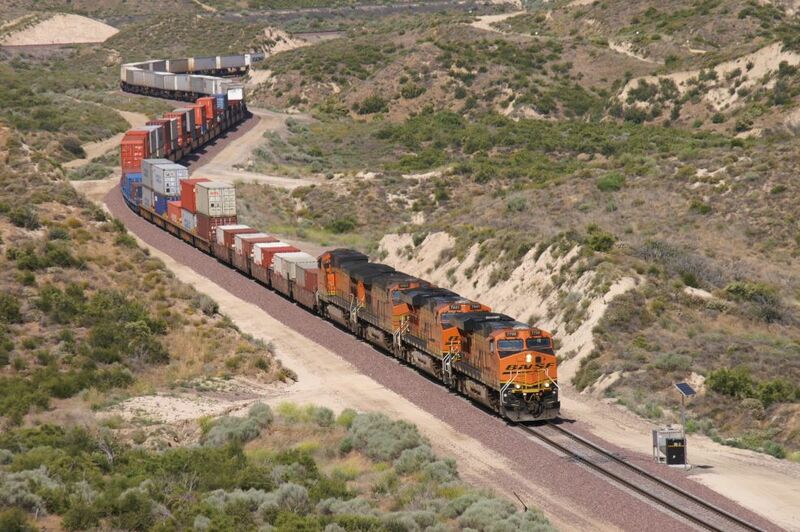 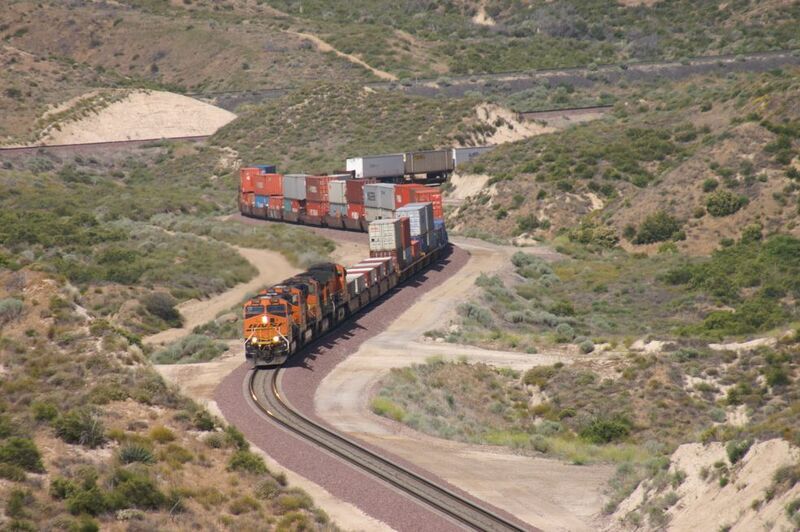 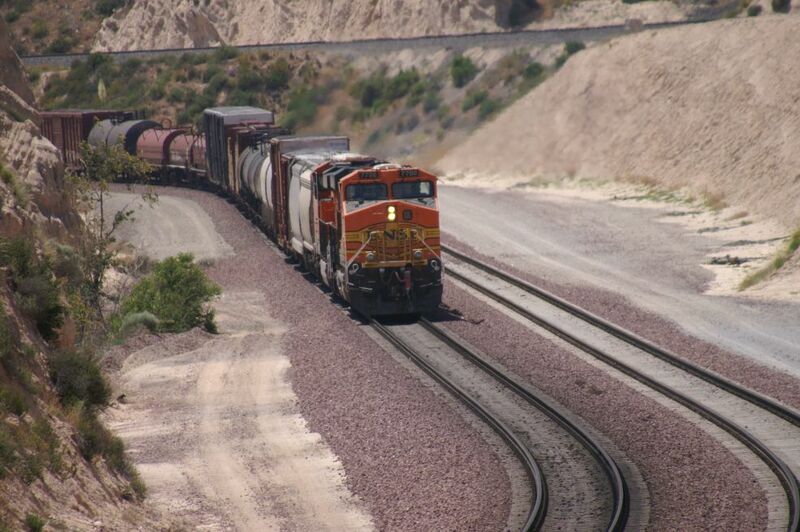 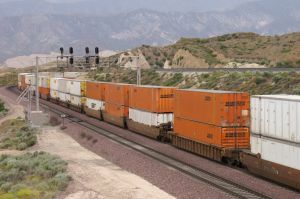 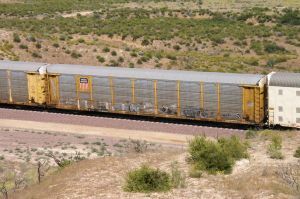 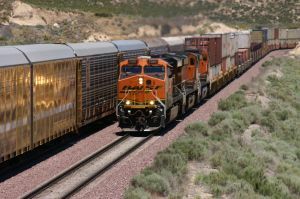 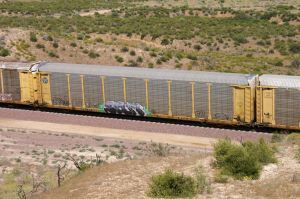 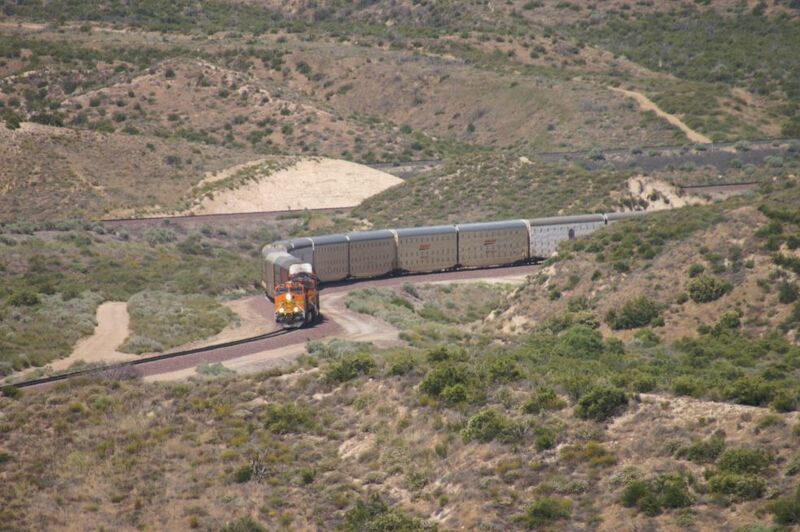 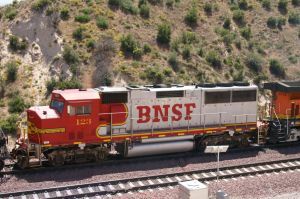 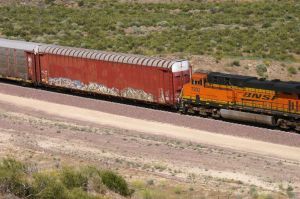 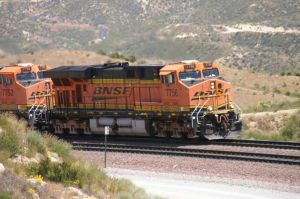 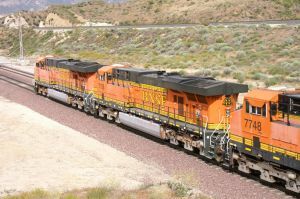 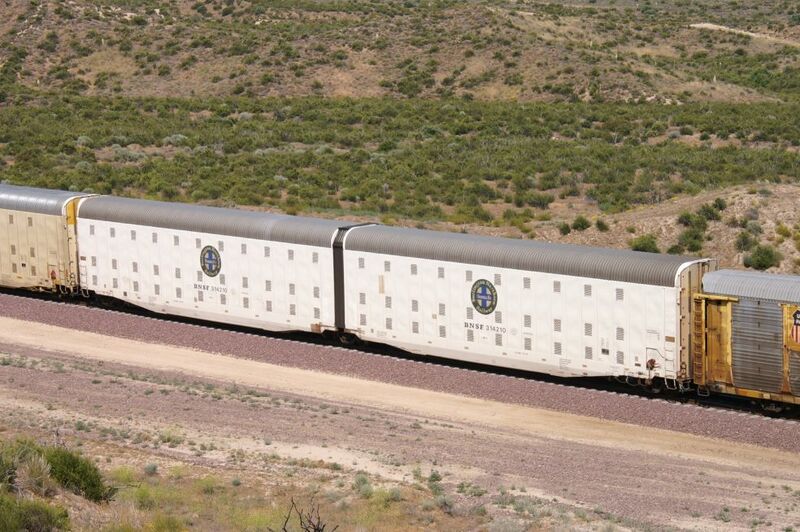 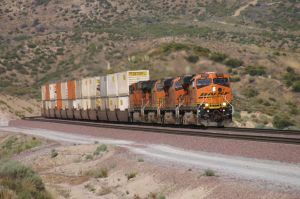 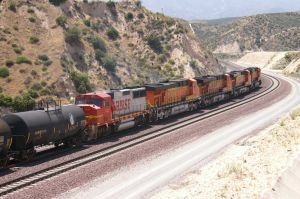 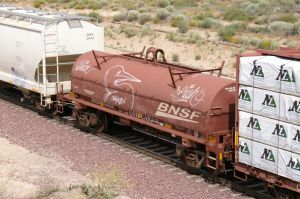 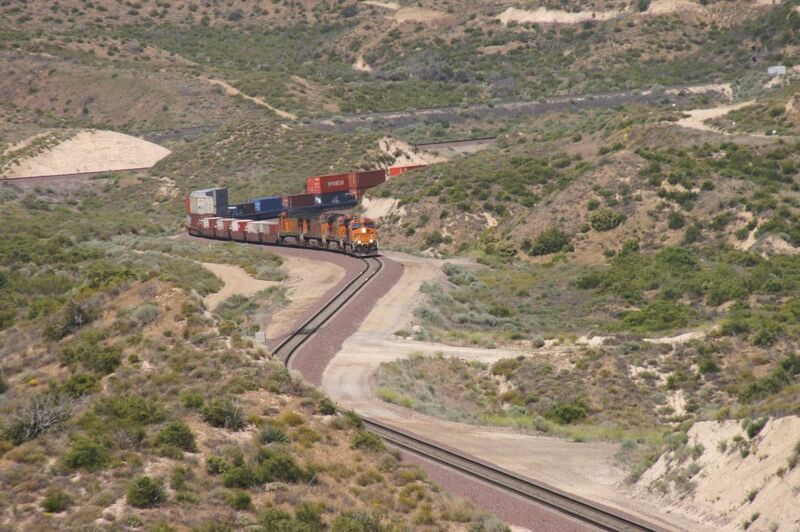 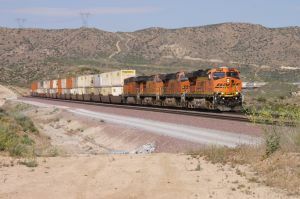 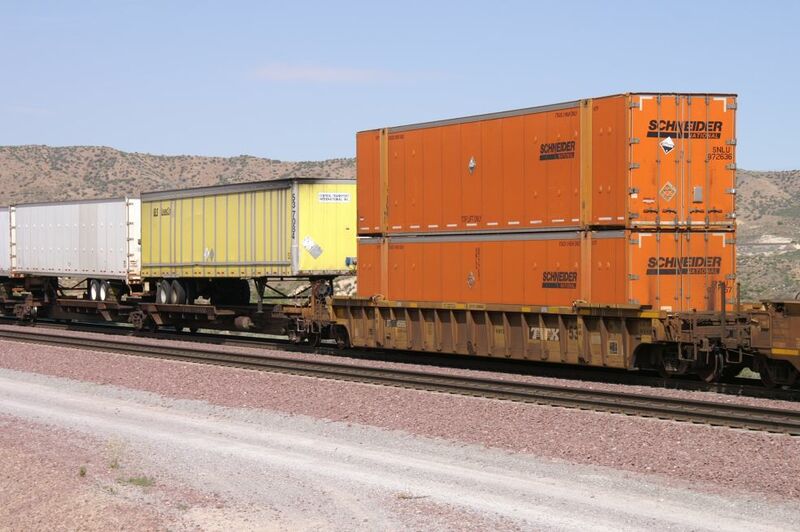 Just before the Swiss group arrived on the Hill, we got a WB BNSF mixed freight on MT-2. Much more fun to have diff. 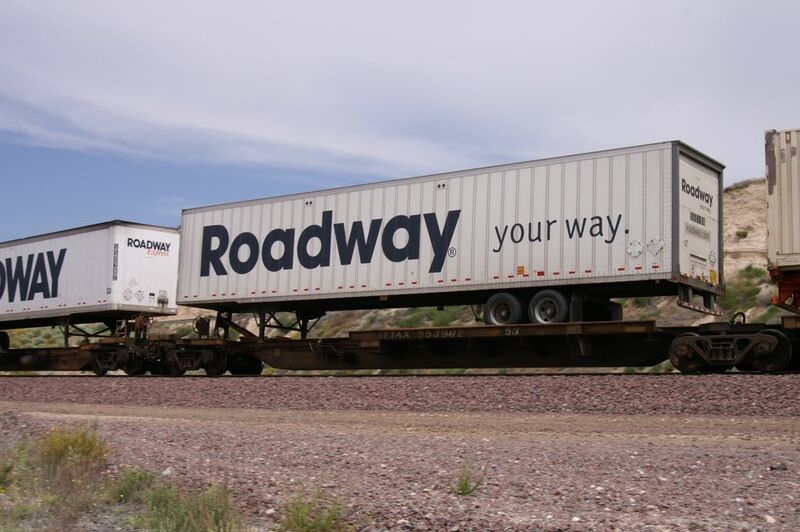 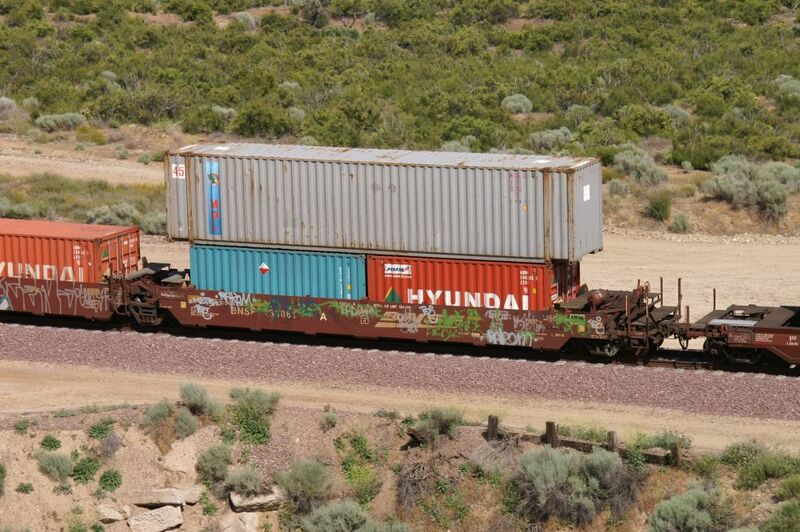 cars instead of a double stack train. 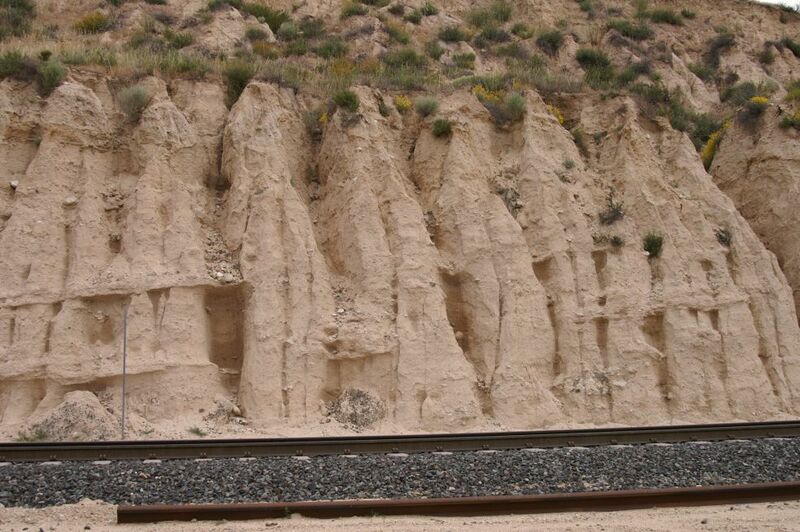 So, I was trying to take photos of all the diff. 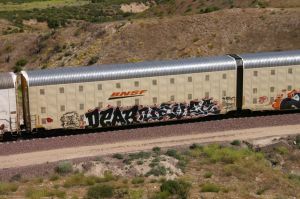 cars and on top, many are having graffiti. 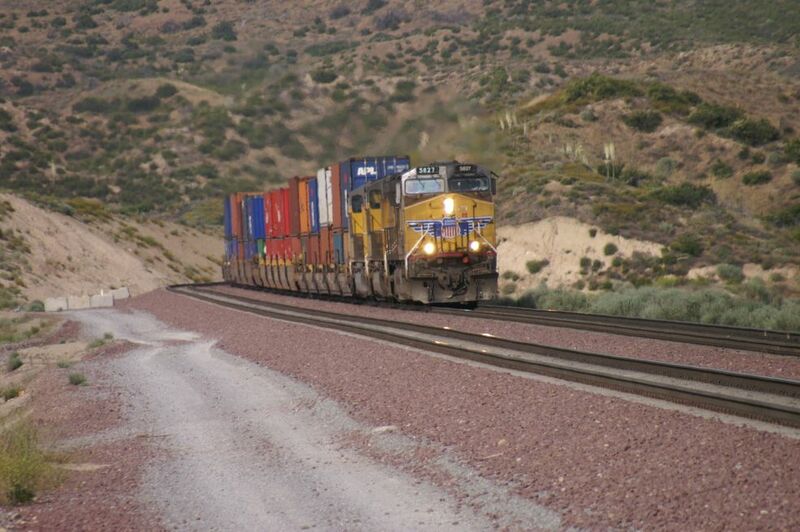 Do not forget: Cars make a train, not just the engines! 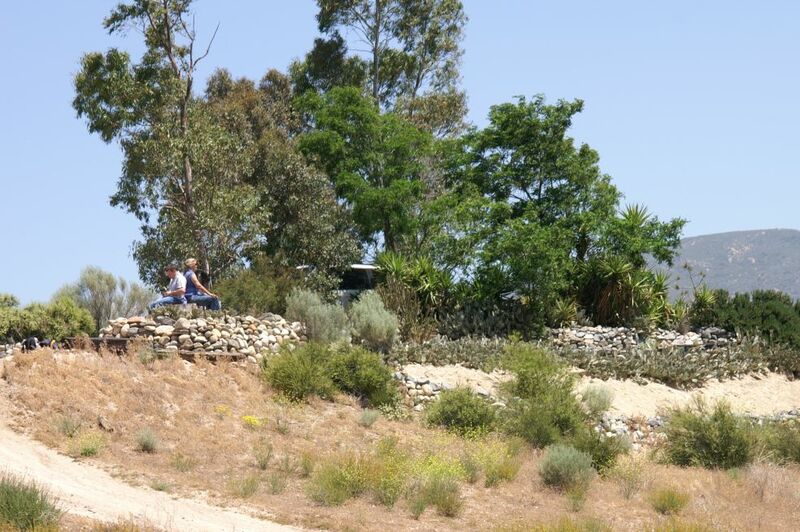 The time has come to do some exploring around Hill 582. 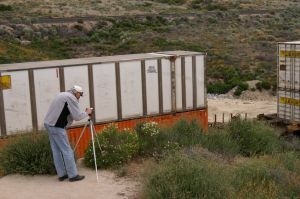 After the 2nd train passed, we started to do some hiking towards the former tunnel area. Photo 3135 shows Hill 582 from the West side (some people incl. 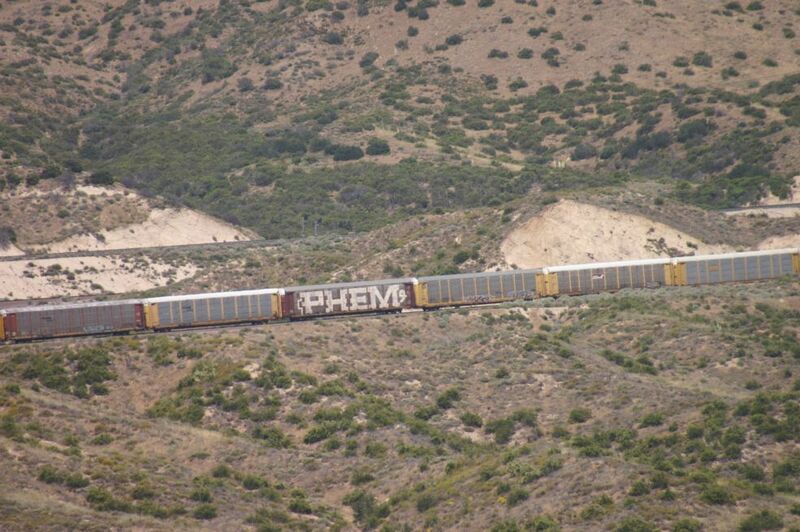 MM preferred to stay on the Hill). 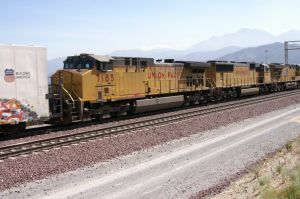 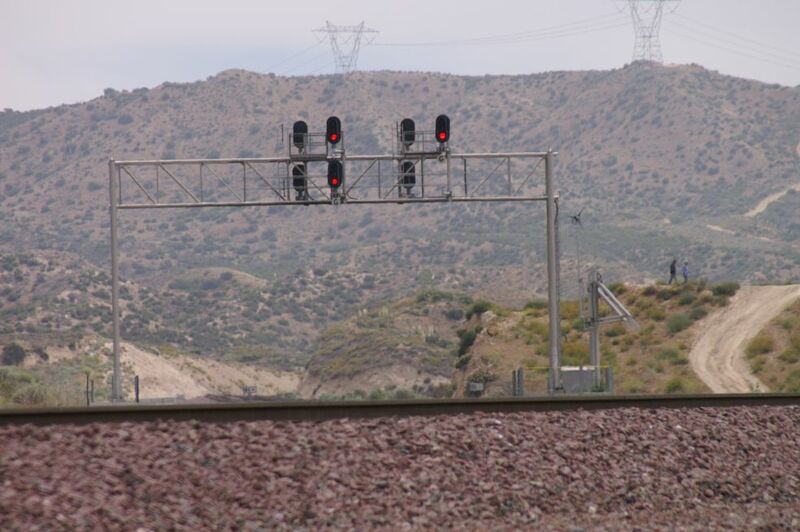 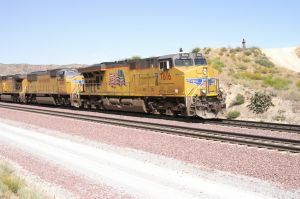 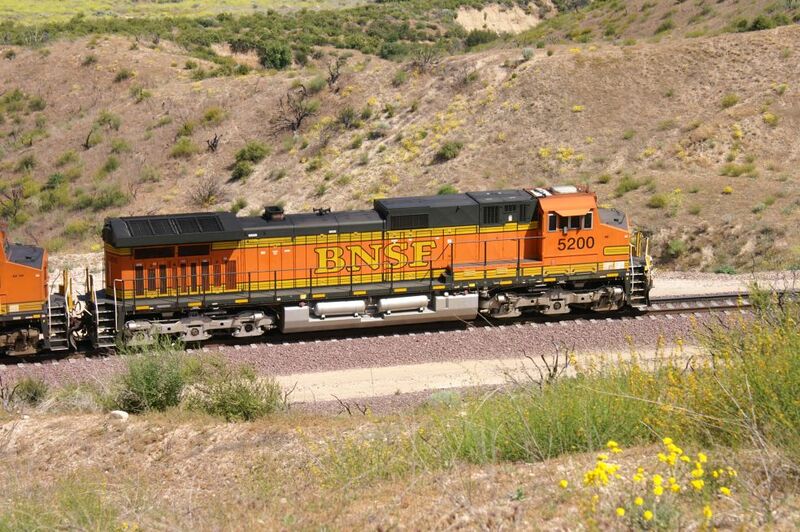 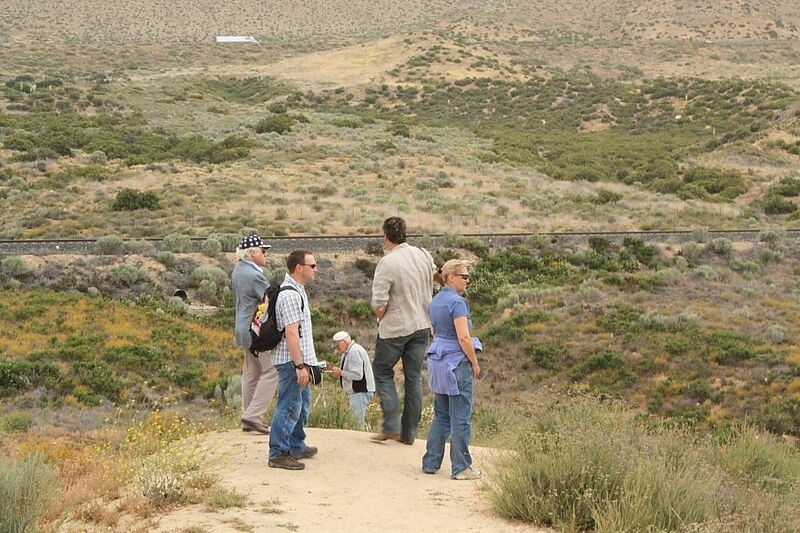 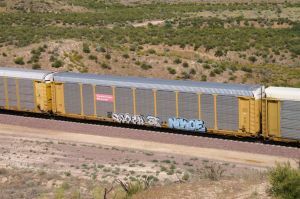 On photo 3136 we can see a BNSF WB in the distance. 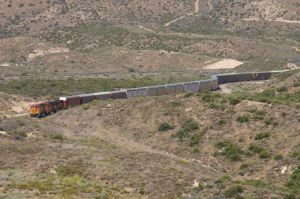 I am standing just at the curve going to the tunnel area. 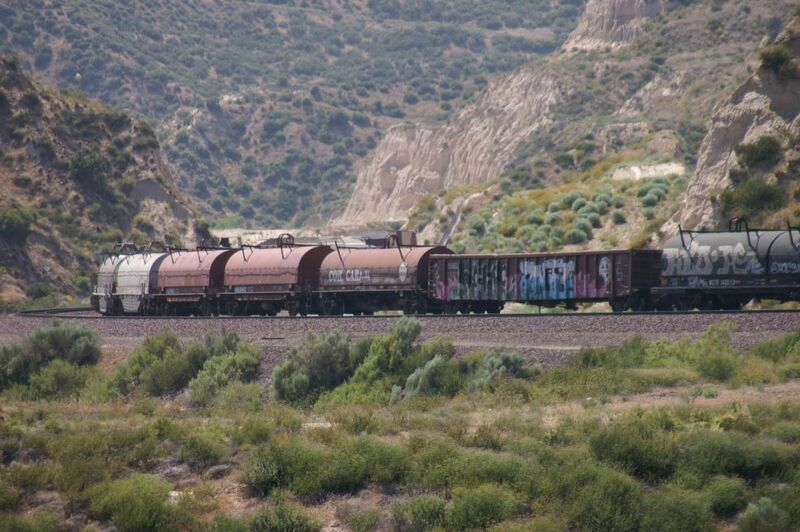 As there was a break (no trains around), I used the time to continue my exploring towards former tunnel 1. 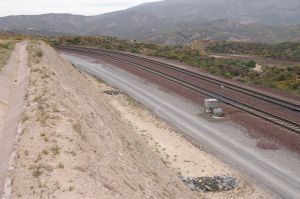 It is quite interesting because I can follow the 3rd Main Track towards Tunnel 1. 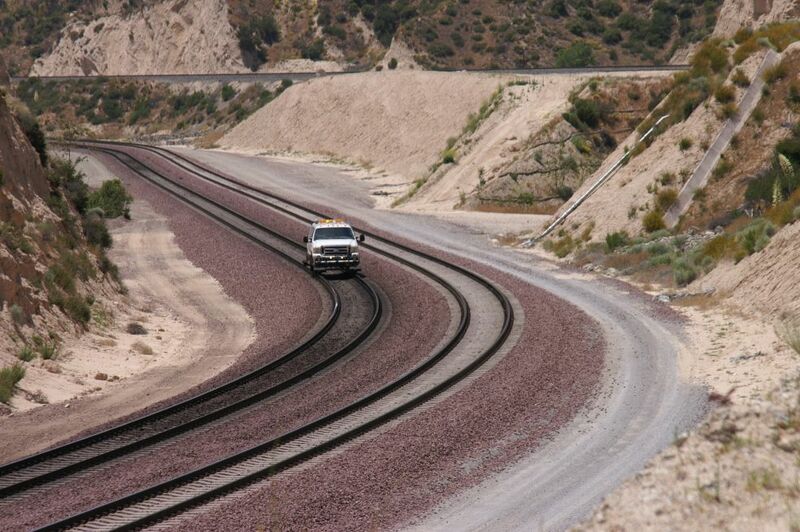 Before the 3MT construction, there was just a single track (North track) and now we have double track, MT-1 and MT-2. 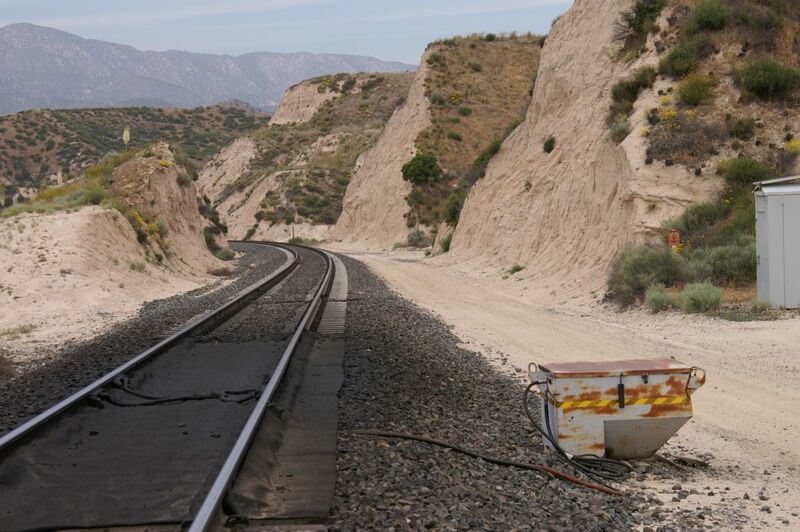 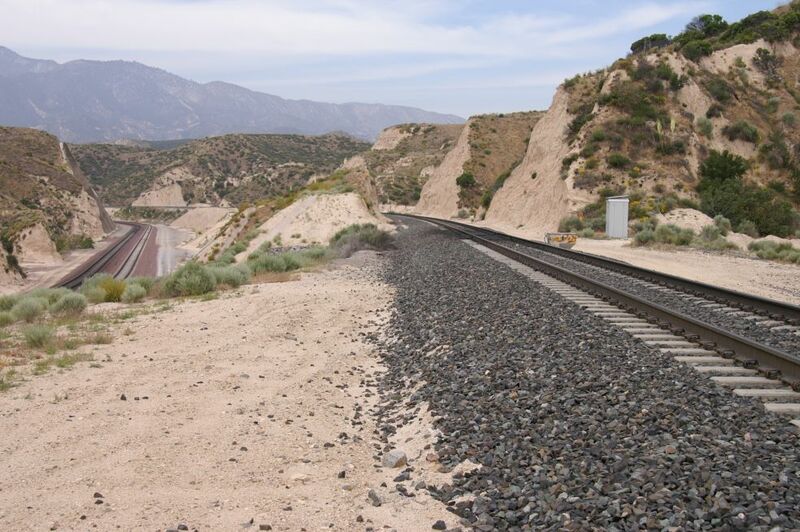 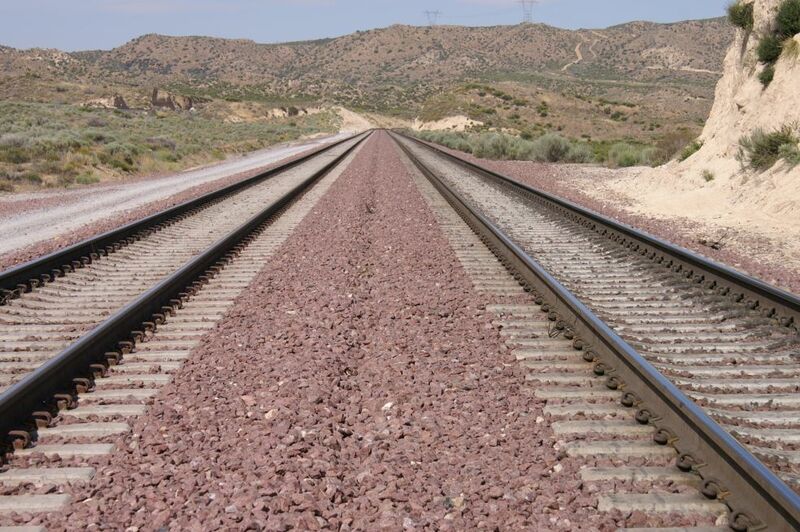 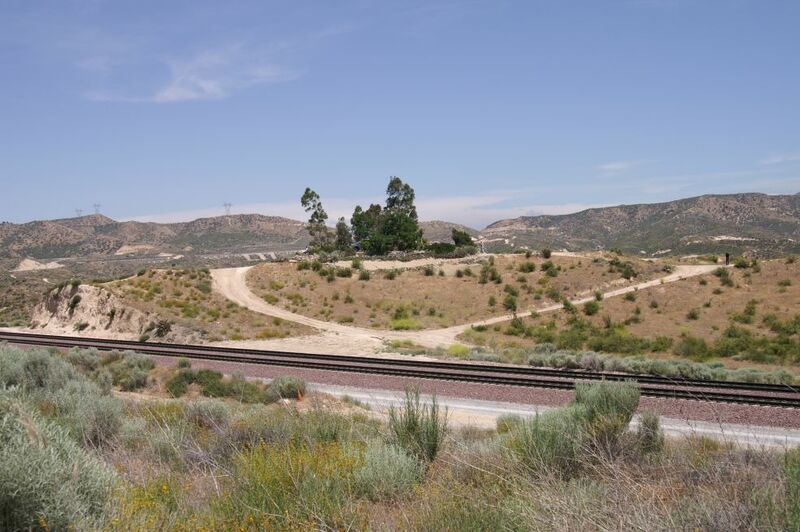 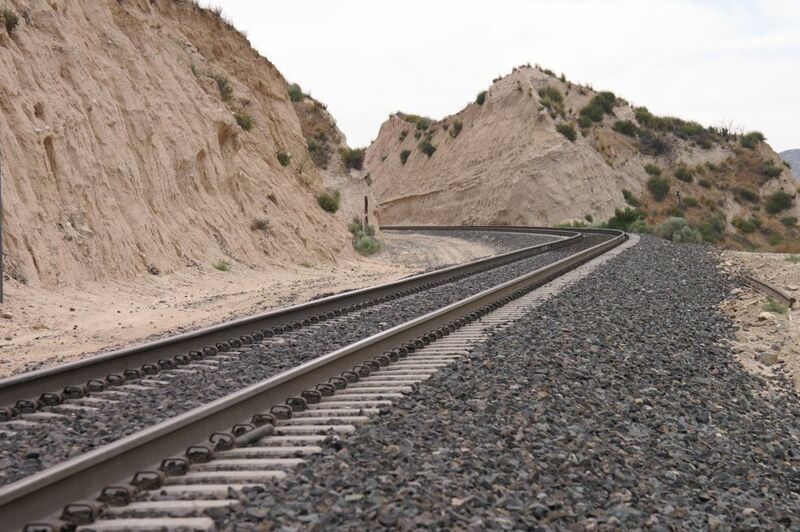 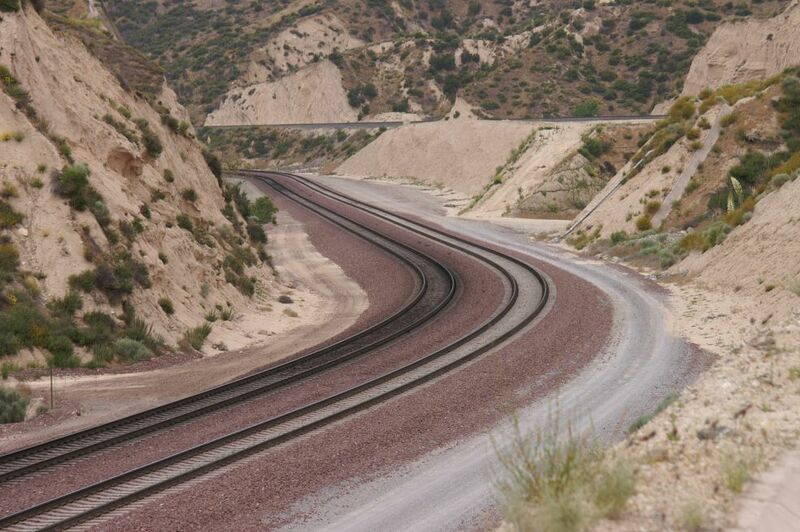 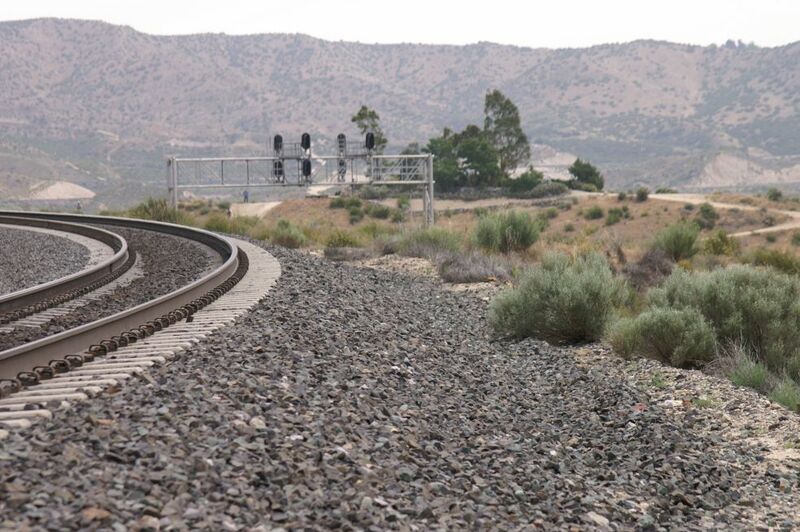 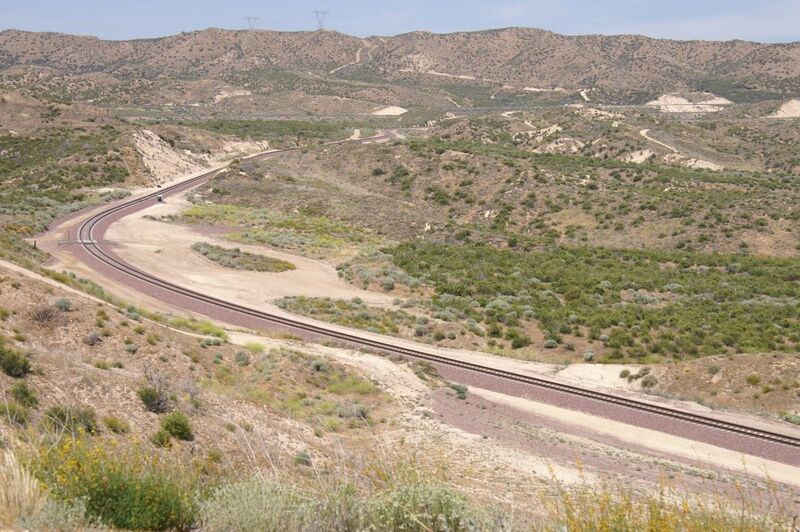 North of the BNSF double track we can see the UP (former SP) Colton-Palmdale Cutoff. 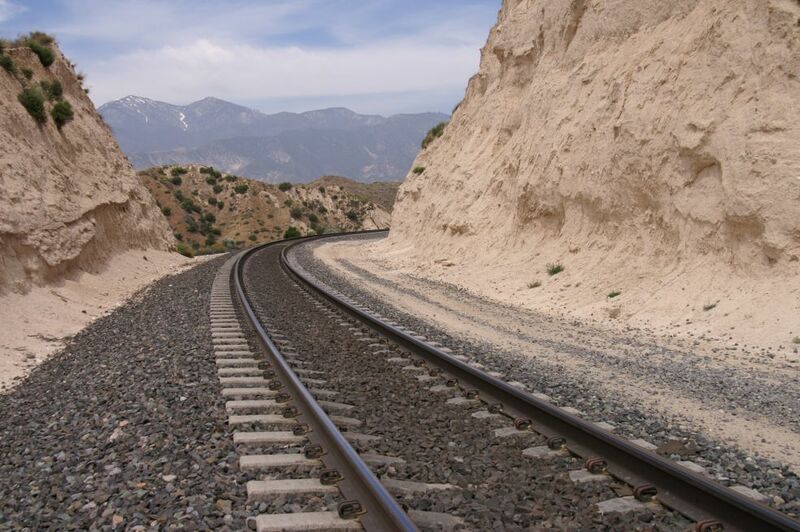 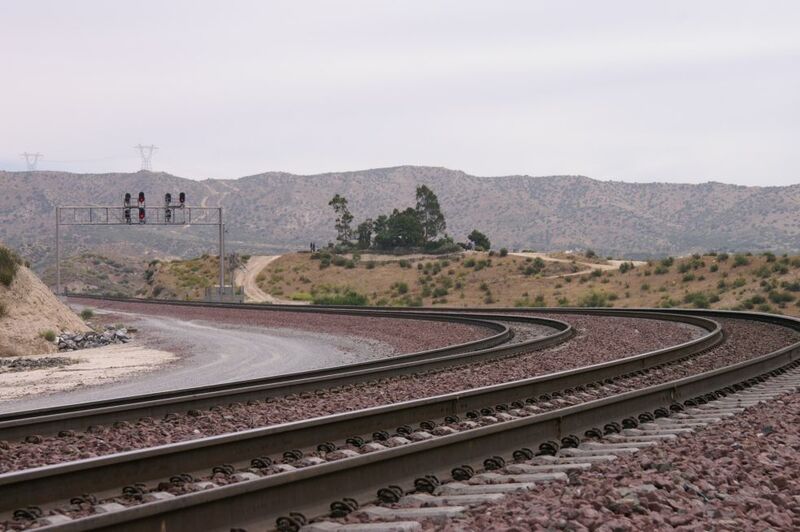 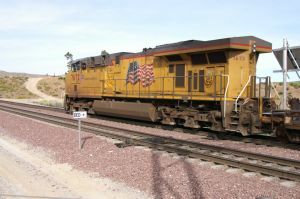 The UP track was built in 1967 by Southern Pacific. 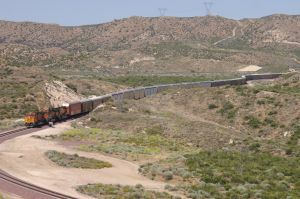 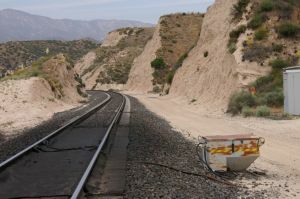 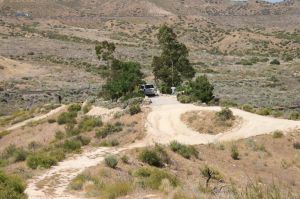 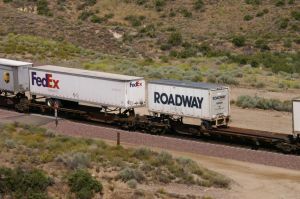 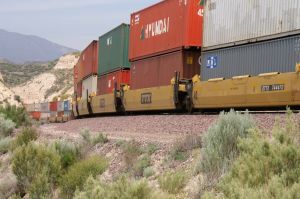 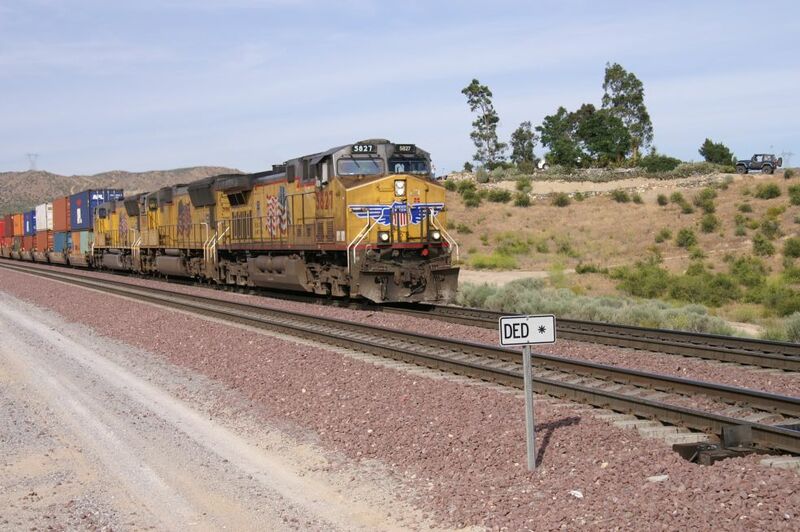 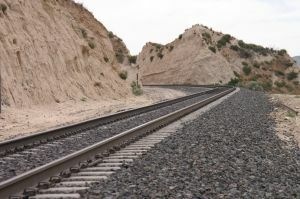 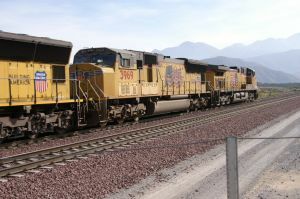 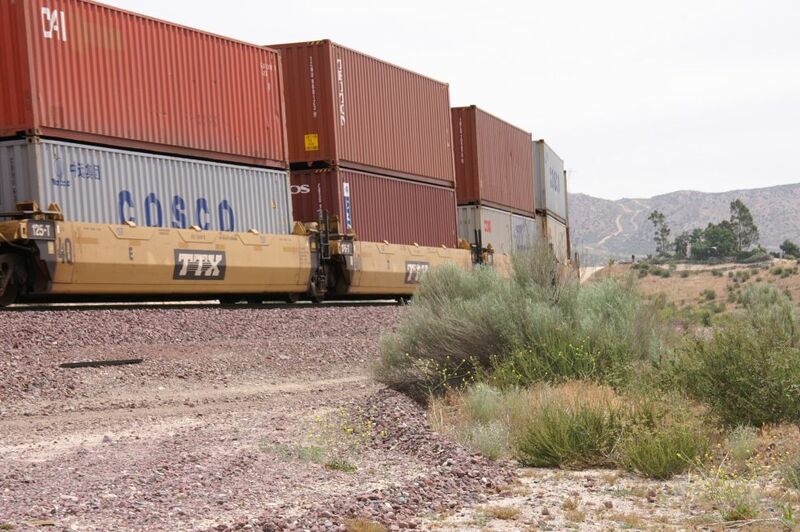 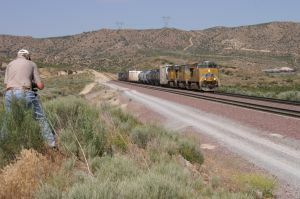 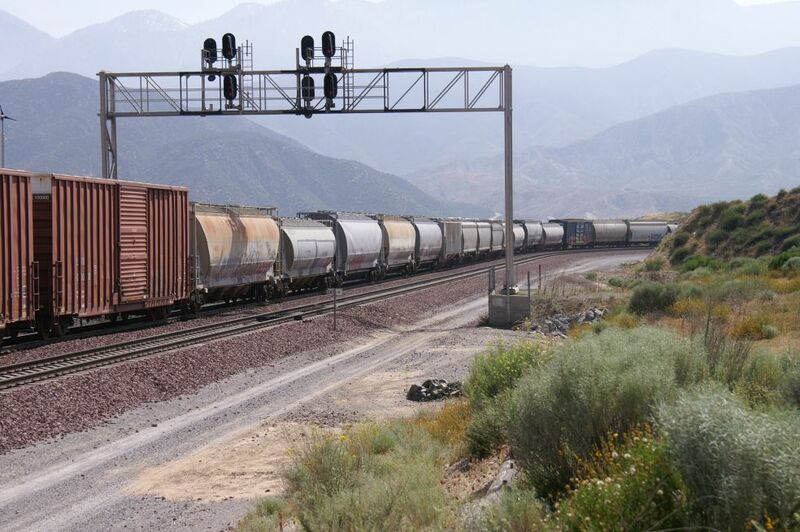 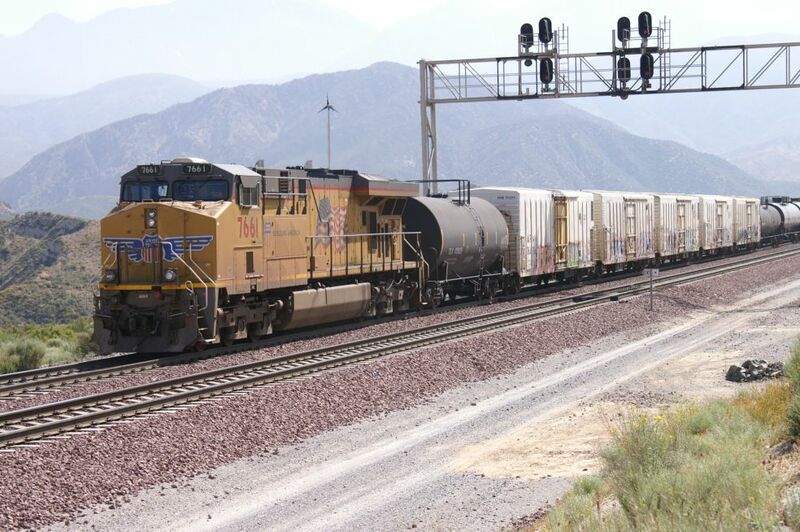 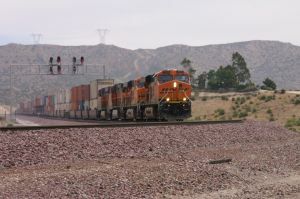 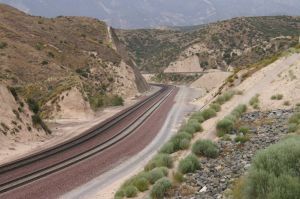 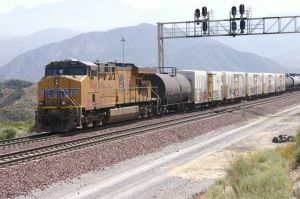 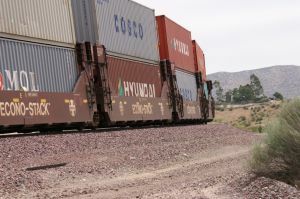 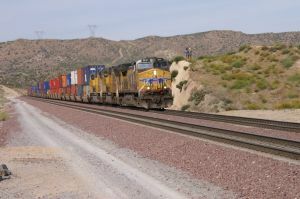 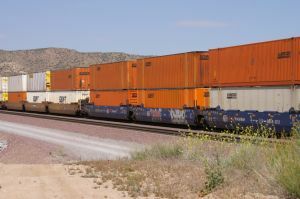 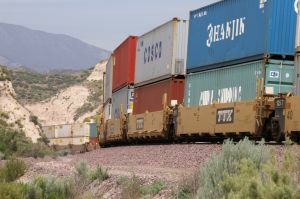 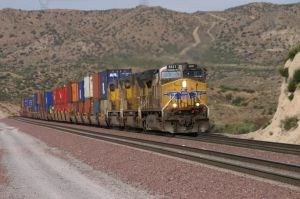 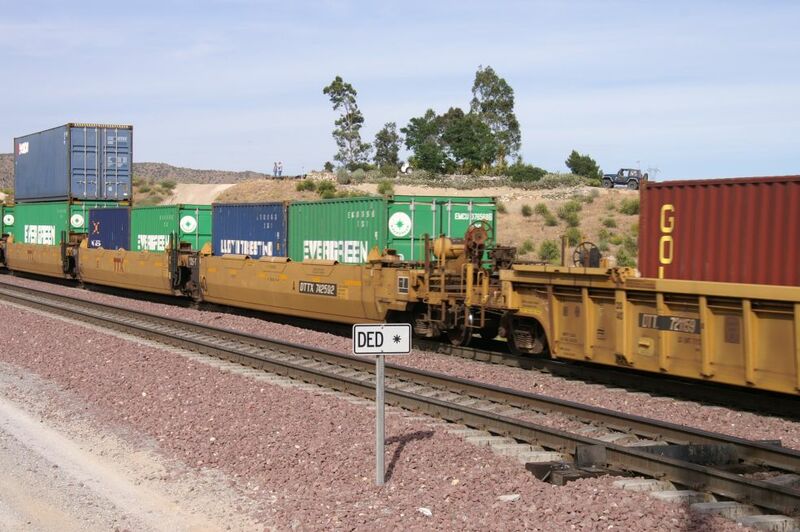 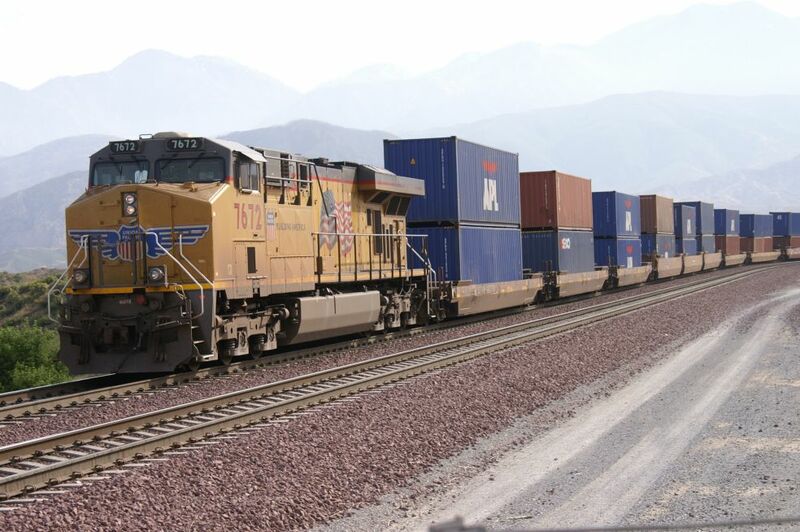 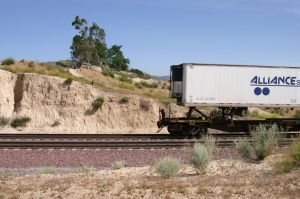 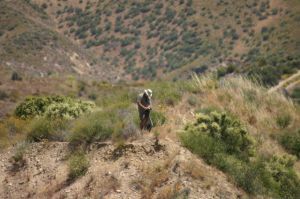 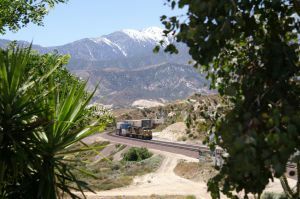 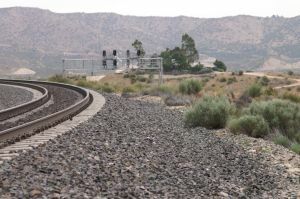 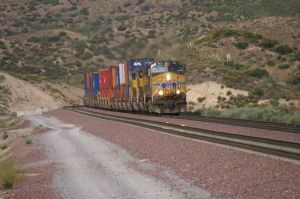 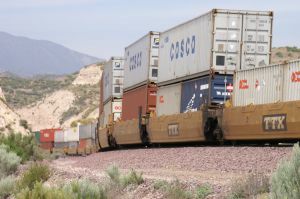 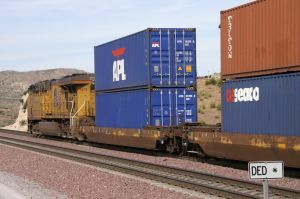 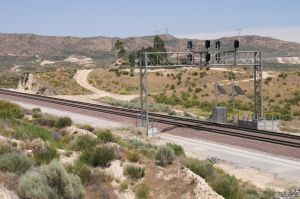 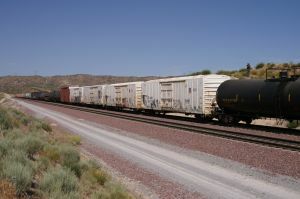 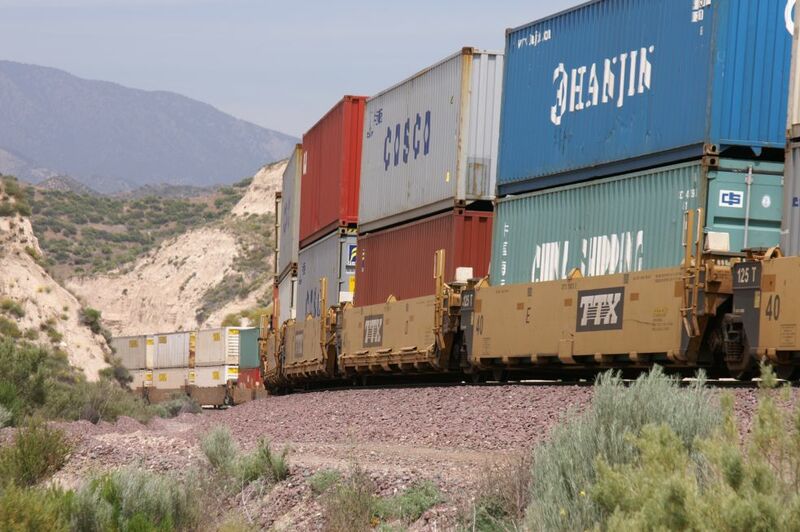 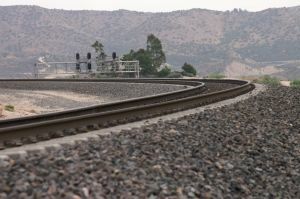 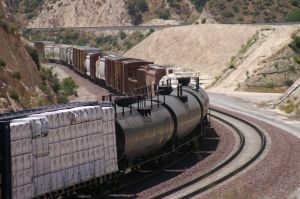 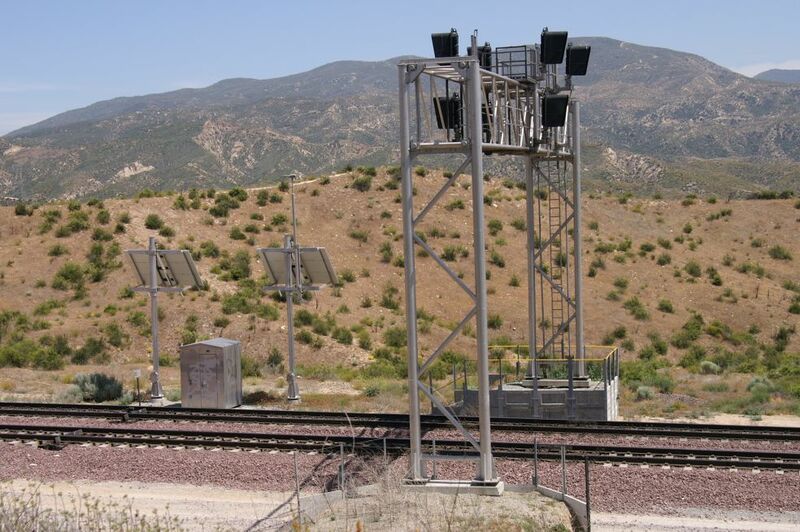 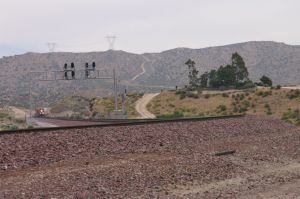 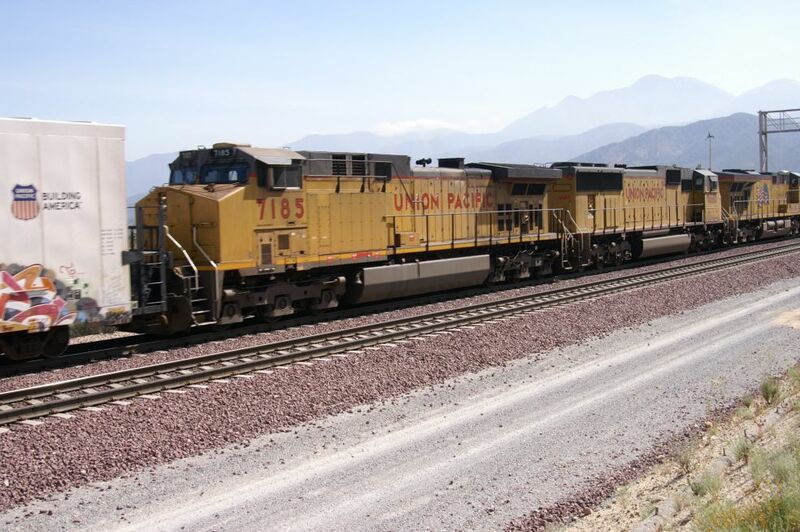 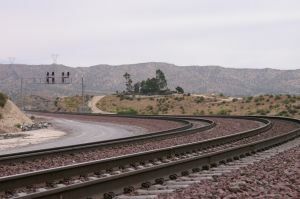 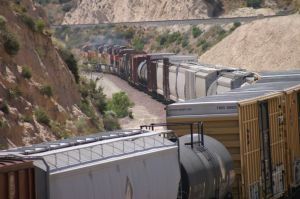 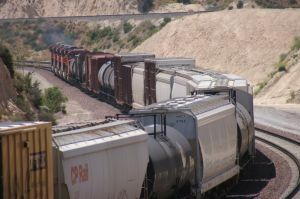 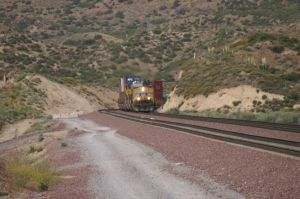 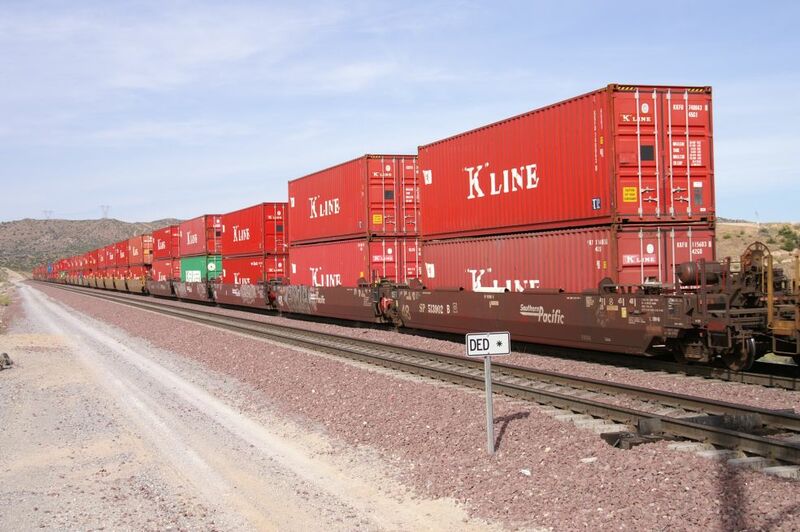 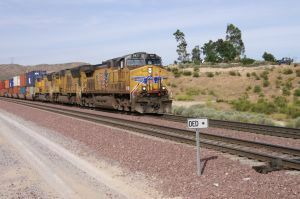 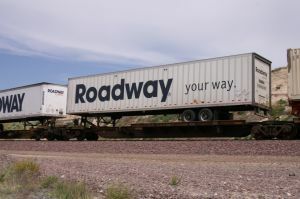 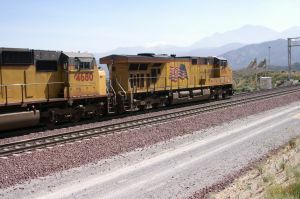 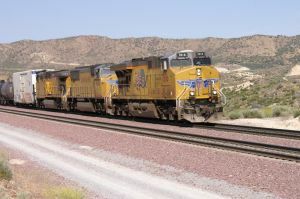 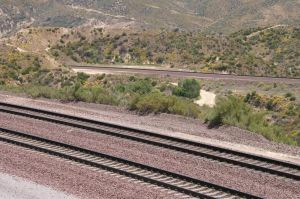 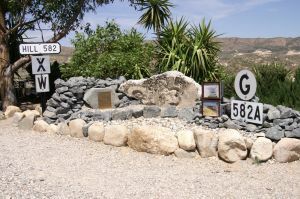 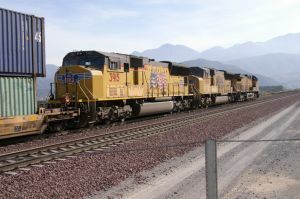 It is a connection between Colton Yard and Palmdale. 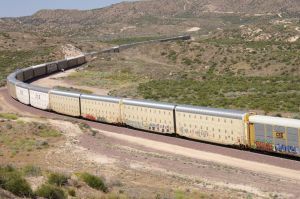 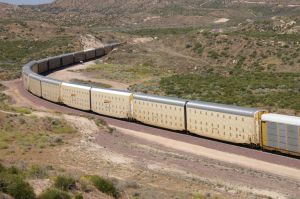 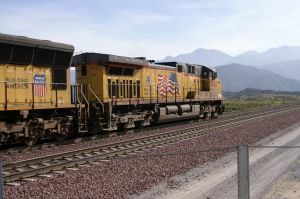 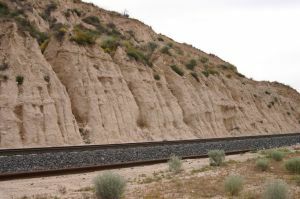 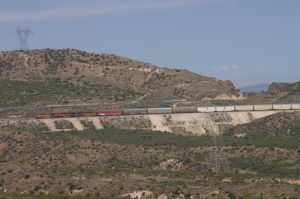 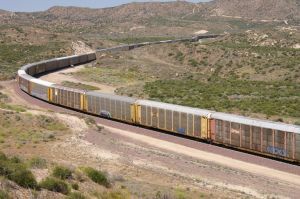 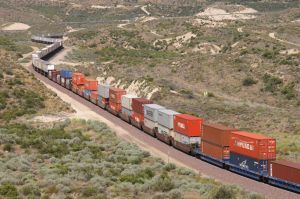 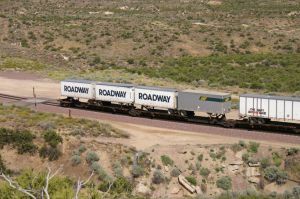 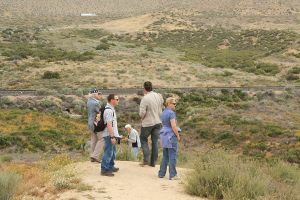 It was built along the Santa Fe North track thru famous locations like Sullivan's Curve, Mormon Rocks and above the Santa Fe Tunnels. 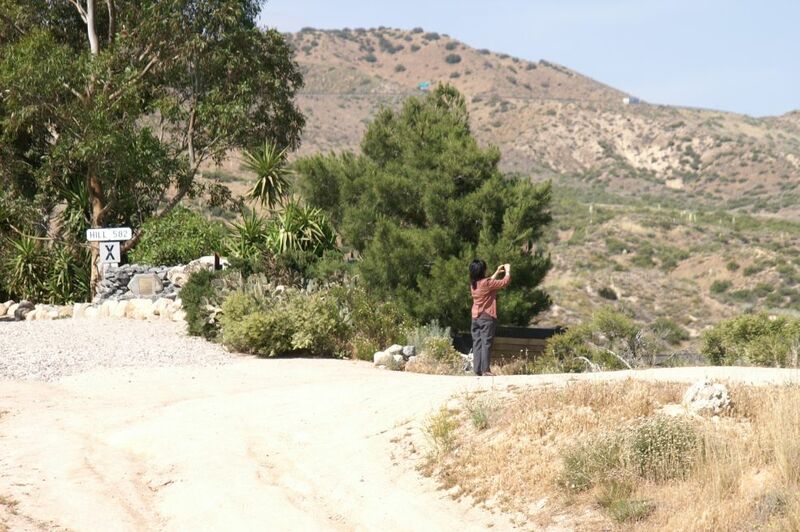 That's the place we are currently taking pictures from. 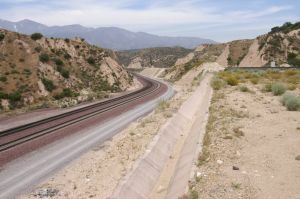 SP avoided to make tunnels and therefore, made lots of cuts. 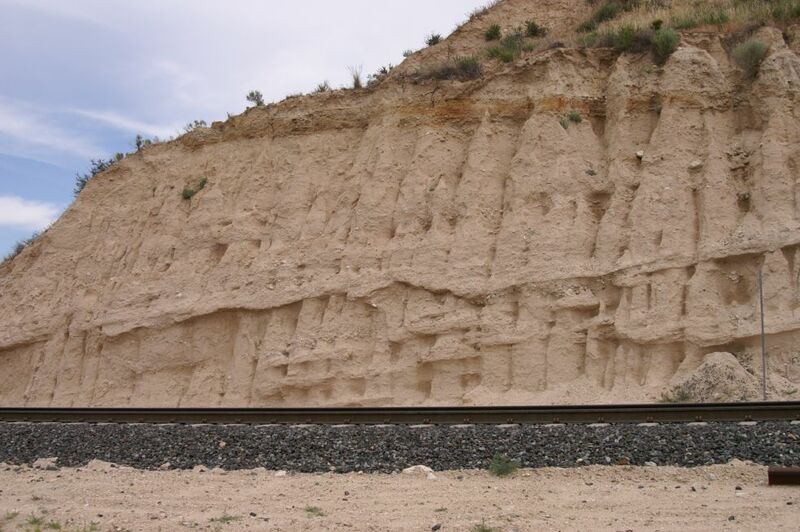 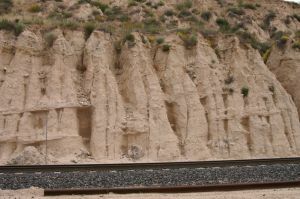 The result of erosion can be seen on these 3 photos below. BTW: The UP service road along the UPT is also an official Forest Service road. 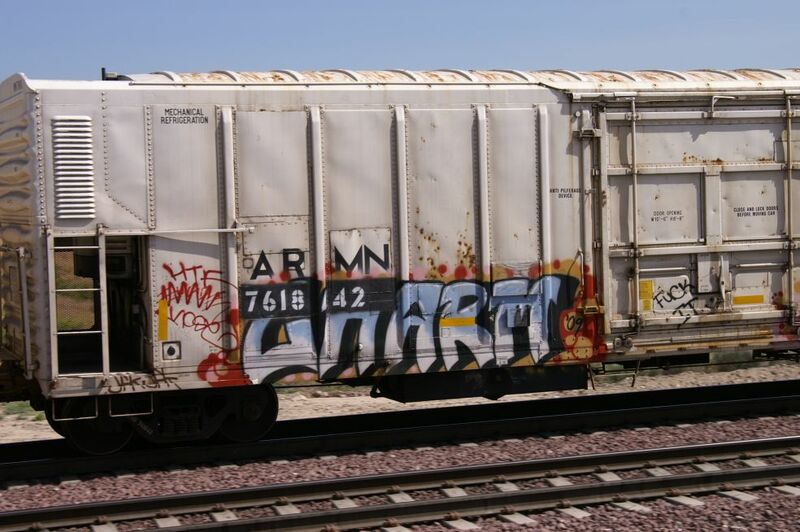 After the train no. 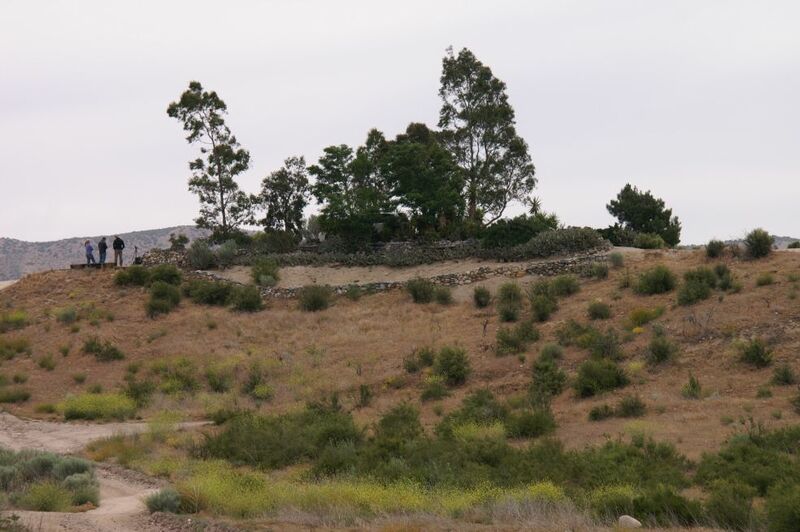 4 above was gone, I started to walk back toward Hill 582 along the UP track. 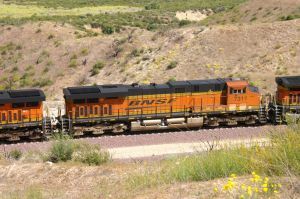 Just after passing the last cut (photo 3170) we can see the signal bridge over the BNSF tracks and in the background Hill 582. 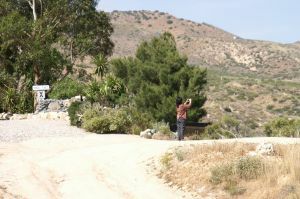 We are looking to the East and see the West side of the Hill. 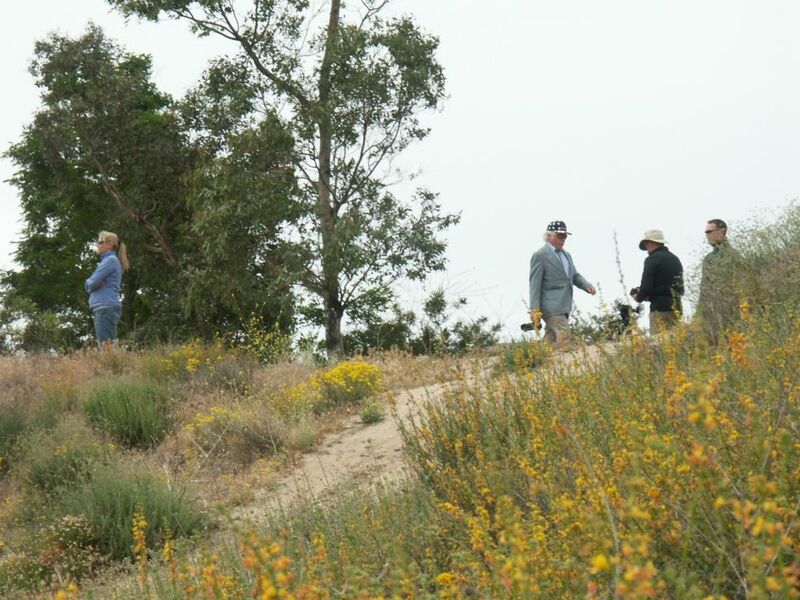 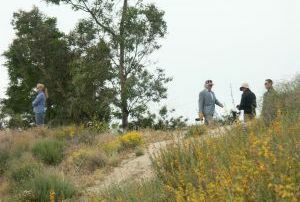 Back on the Hill, quickly talking to our friends and finally walking towards the South end of the Hill. 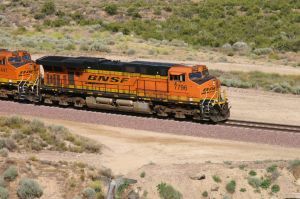 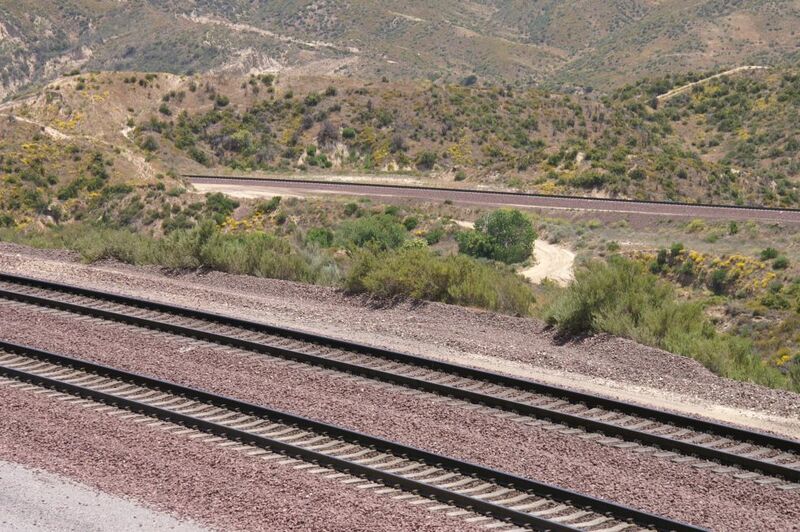 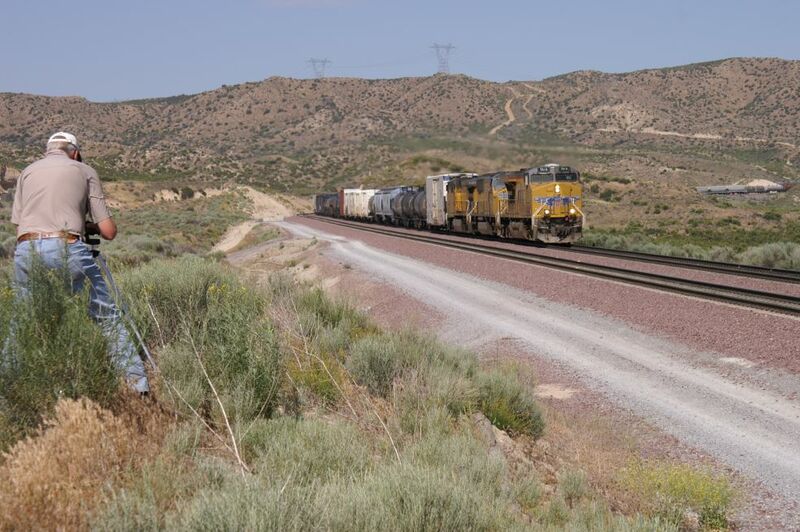 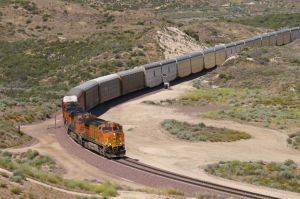 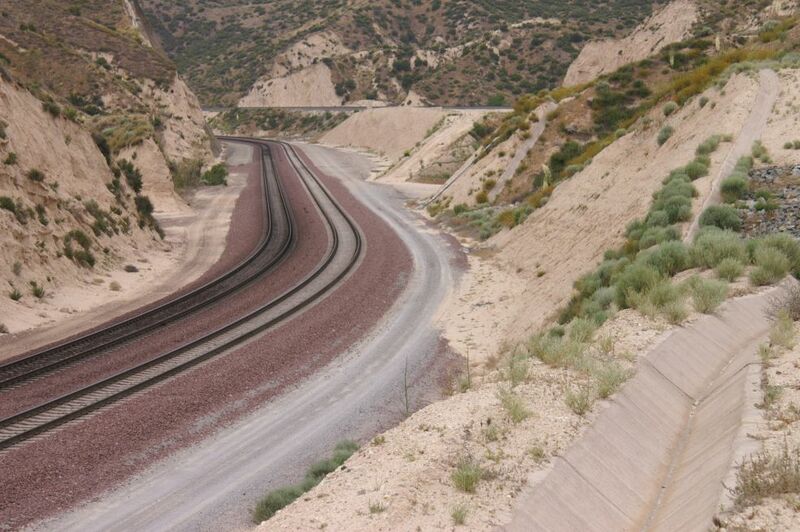 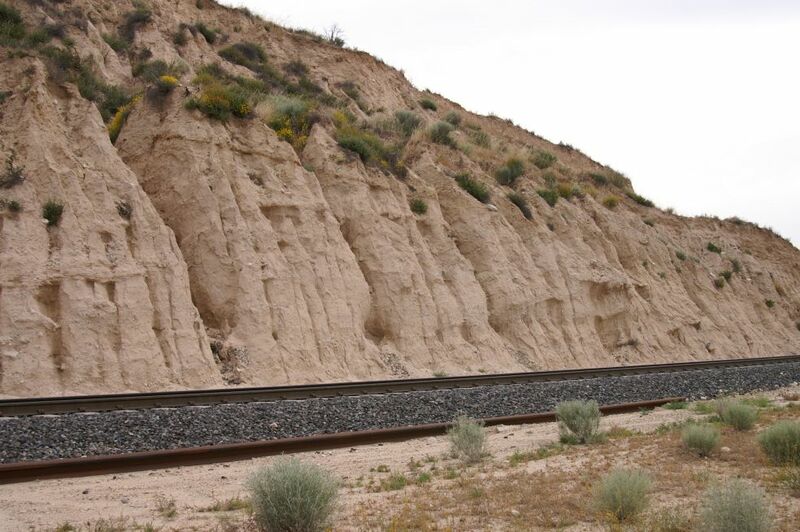 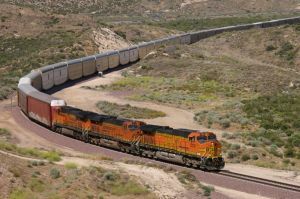 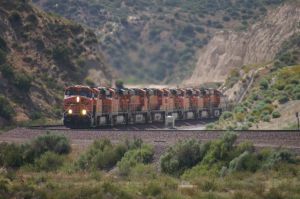 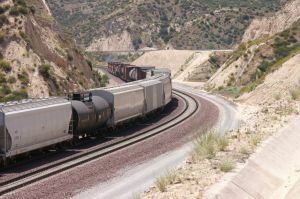 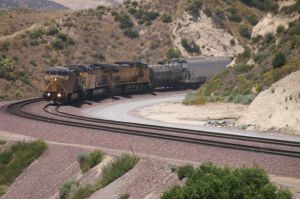 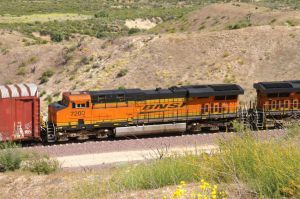 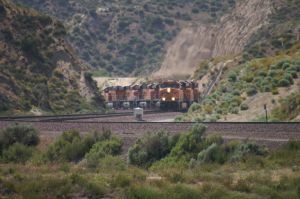 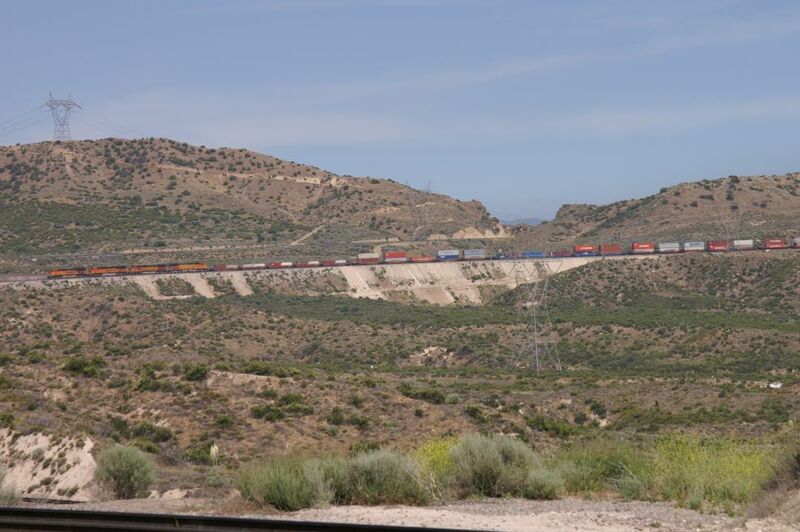 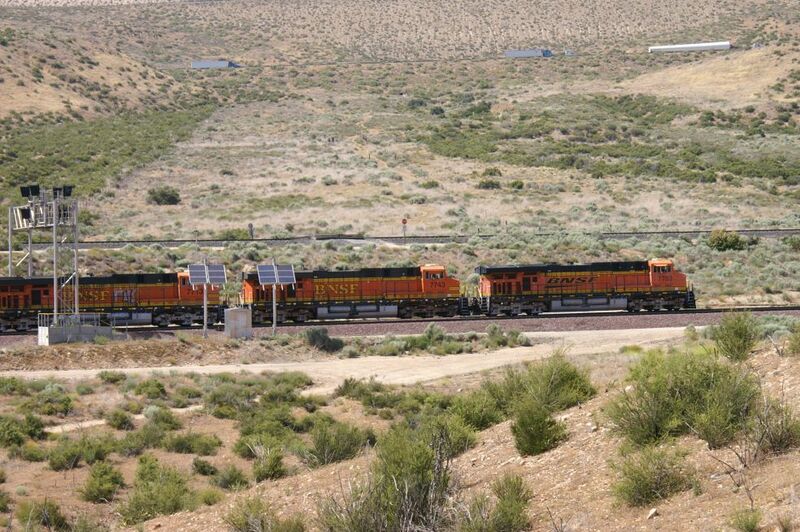 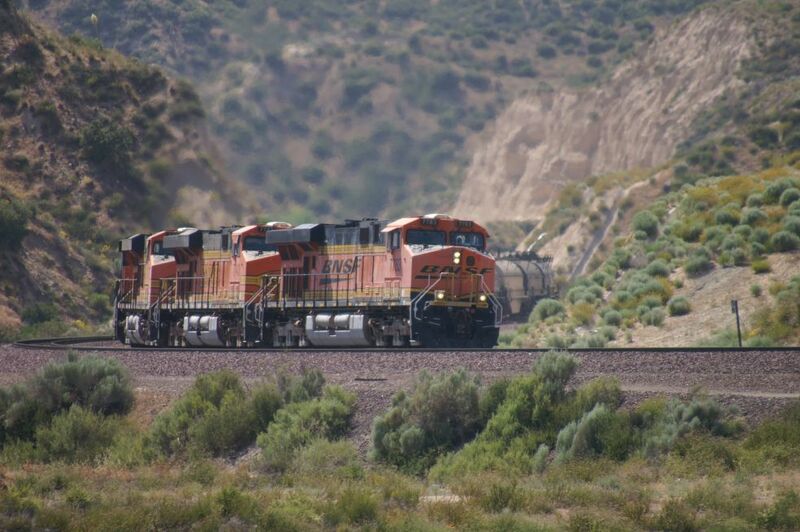 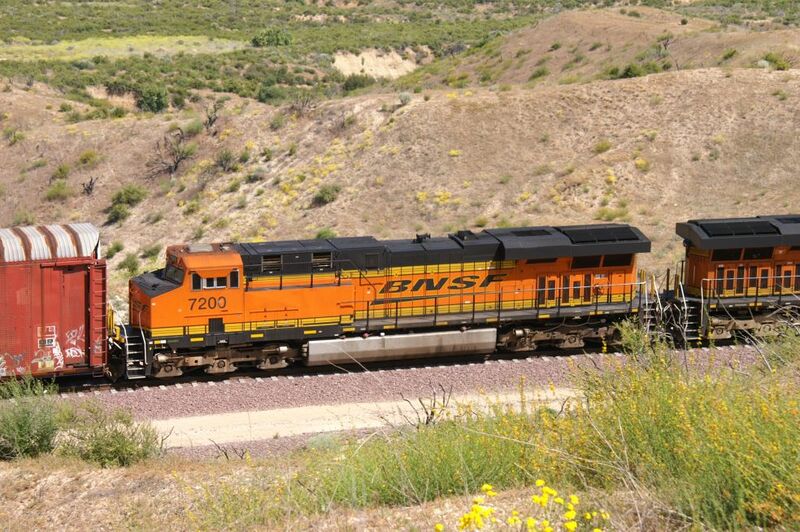 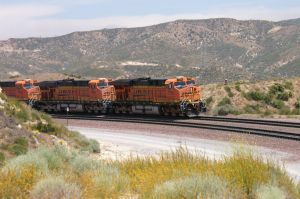 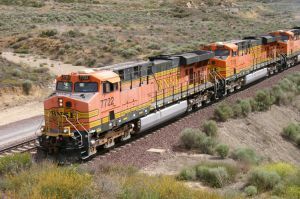 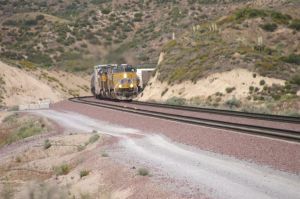 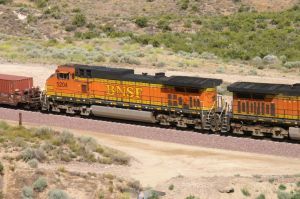 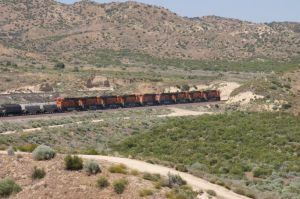 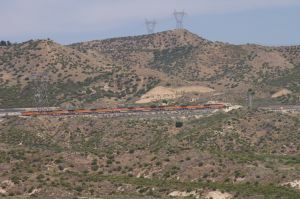 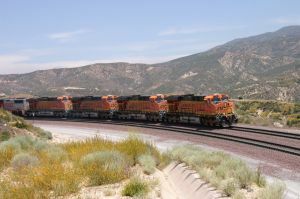 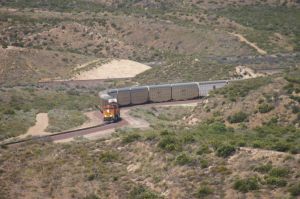 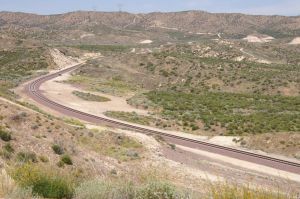 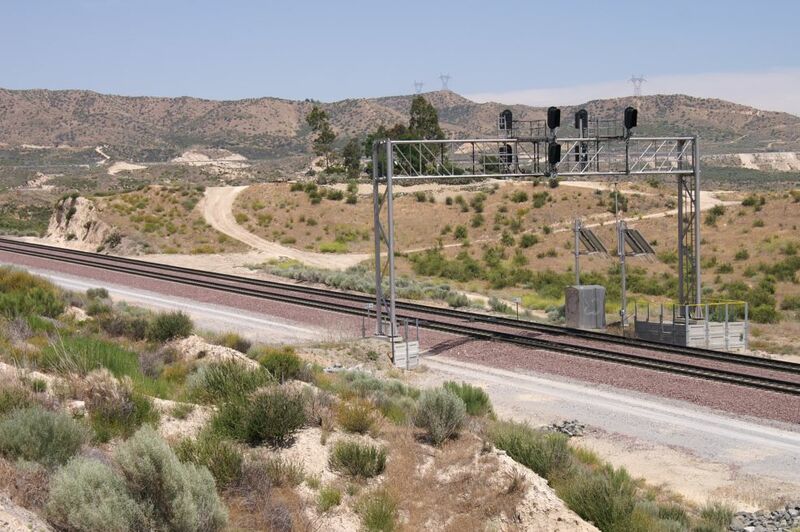 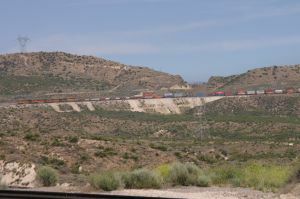 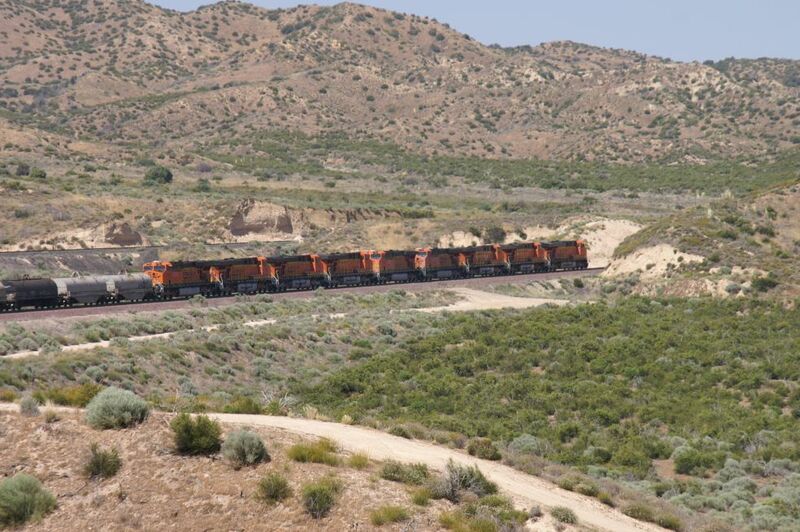 We can see the curve (BNSF MT-1 and MT-2) towards the former tunnels on the left side and the BNSF MT-3 on the right side. 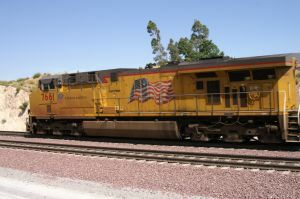 Photos 3543 (just for reference - this train can be seen on part 3) and 3219 were taken from the position/location as seen on photo 3218. 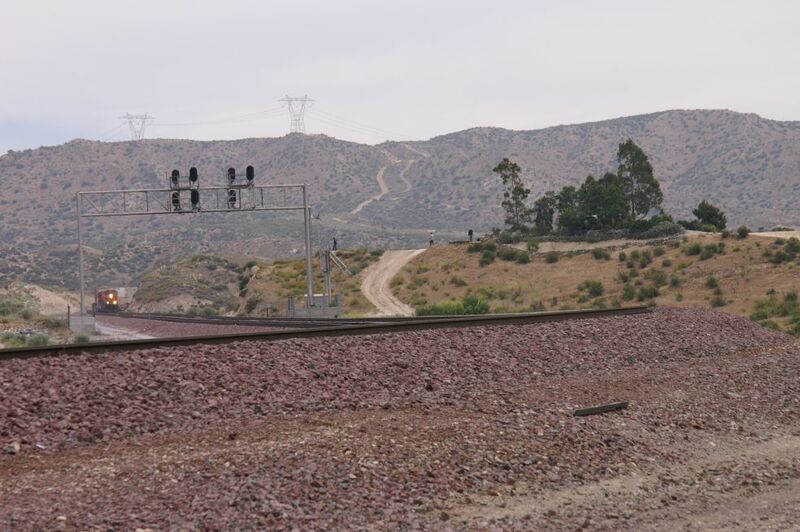 So, I was walking further back towards the South and MT-3. 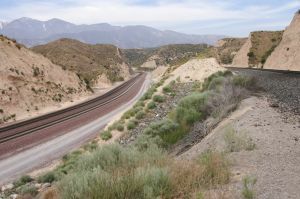 From this point, I have a chance to see behind the curve (tunnel area) starting with photo 3221. 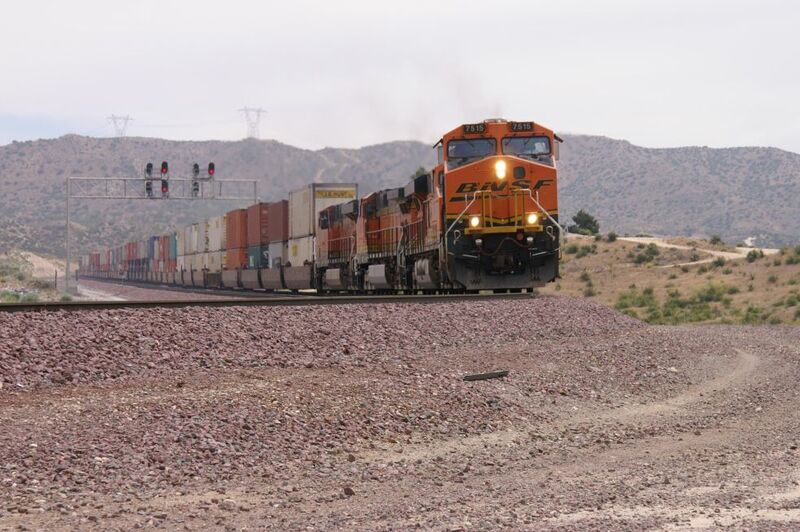 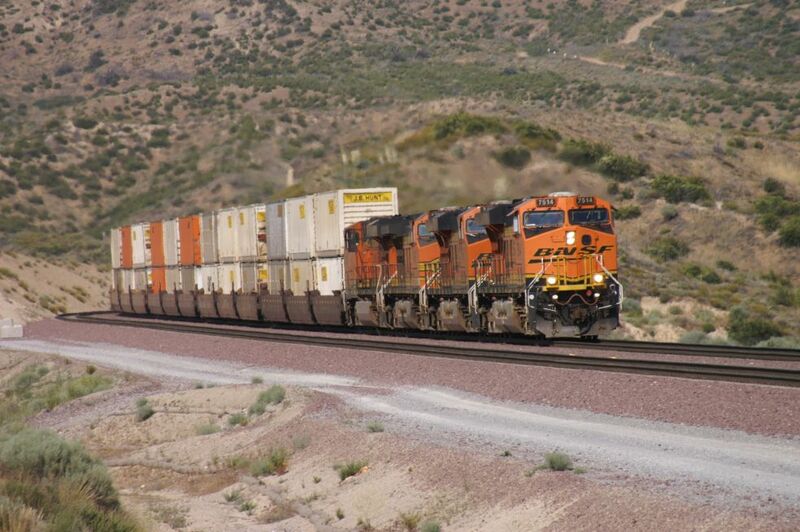 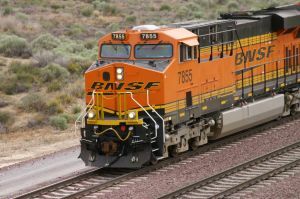 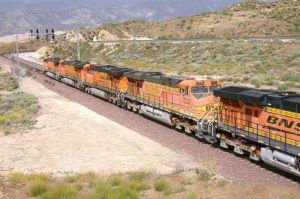 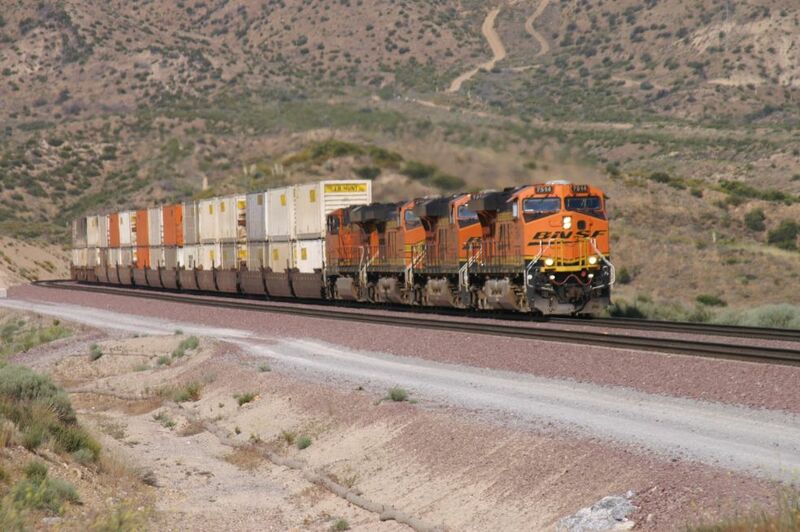 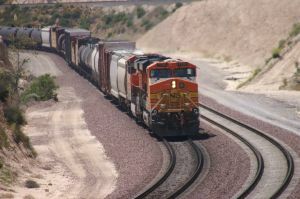 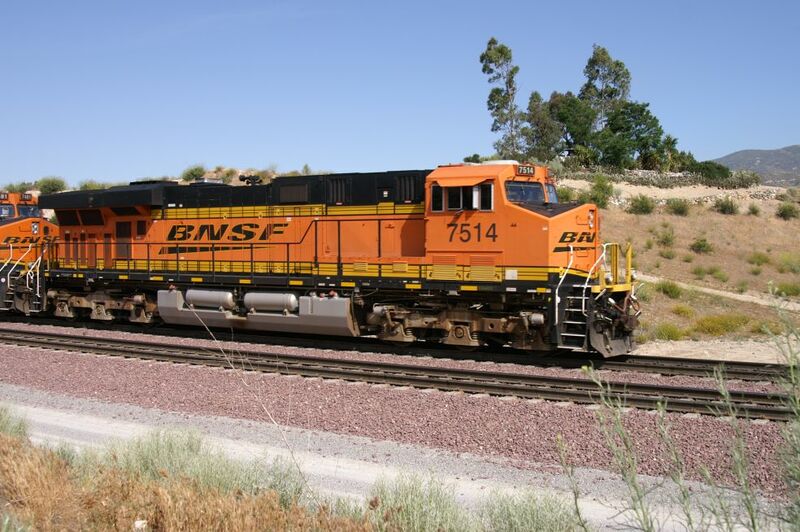 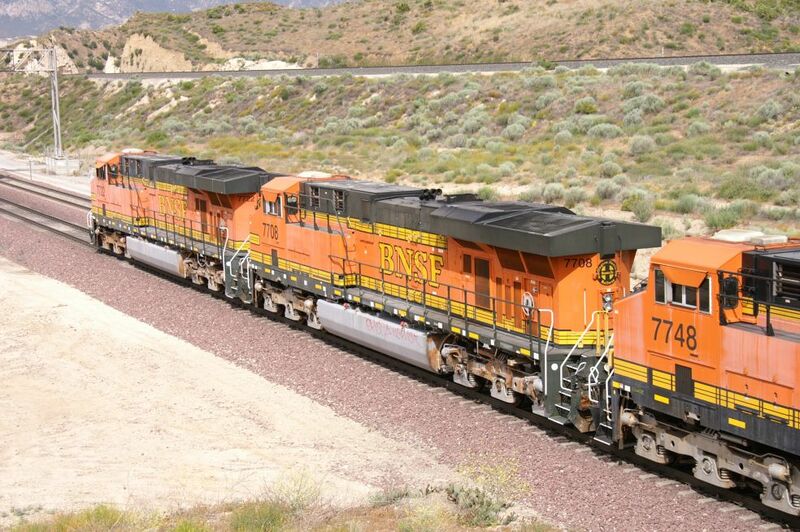 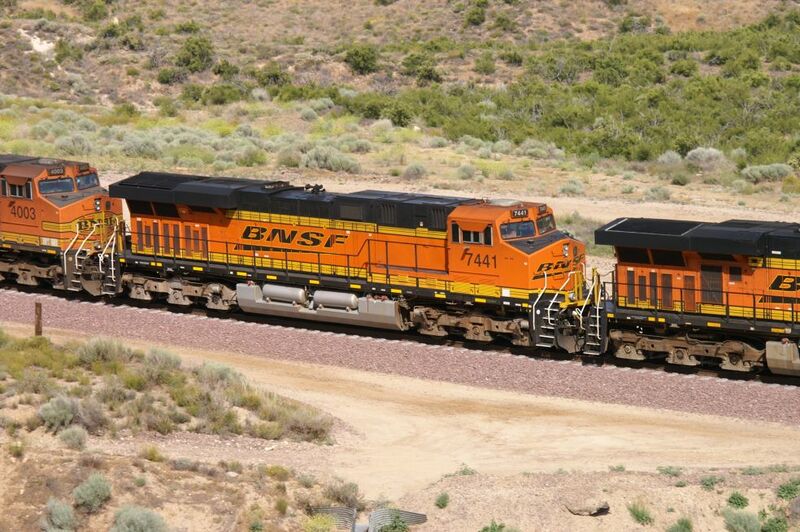 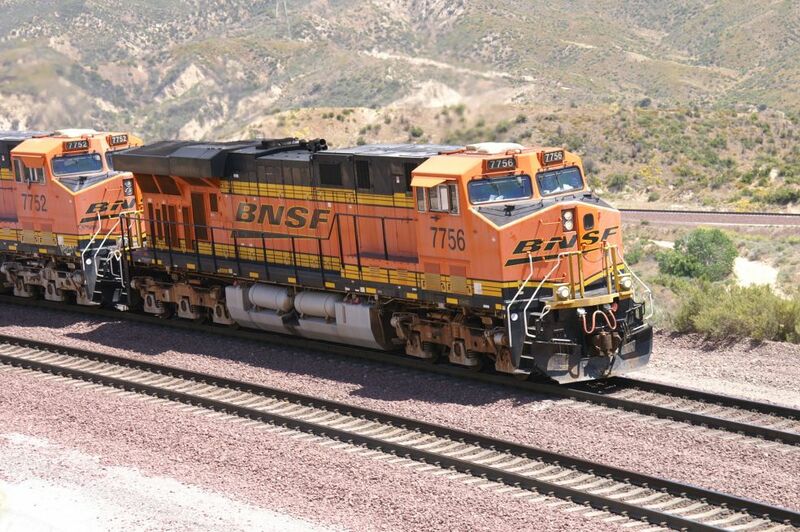 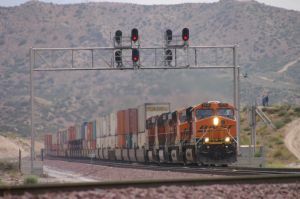 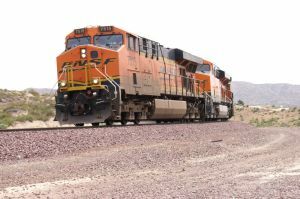 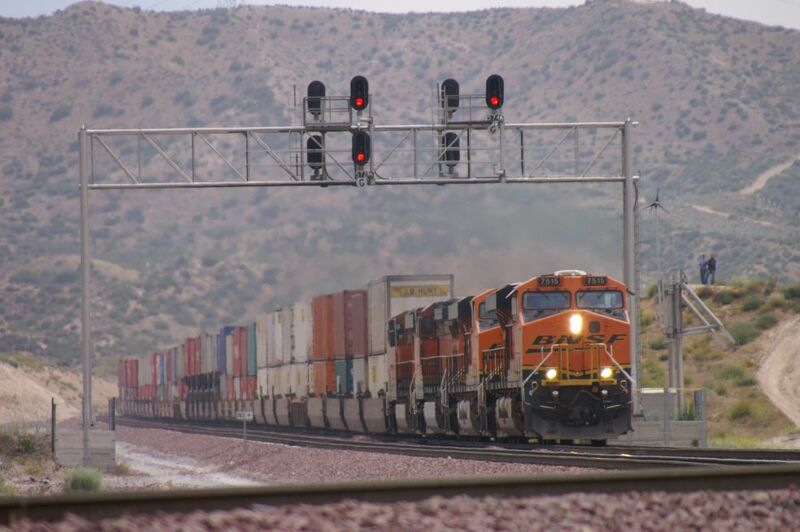 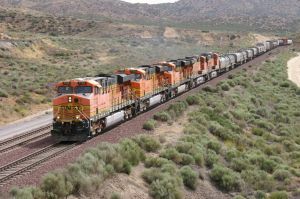 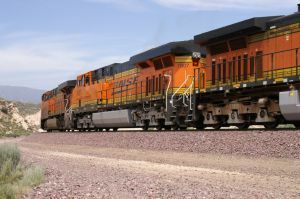 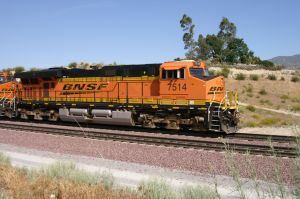 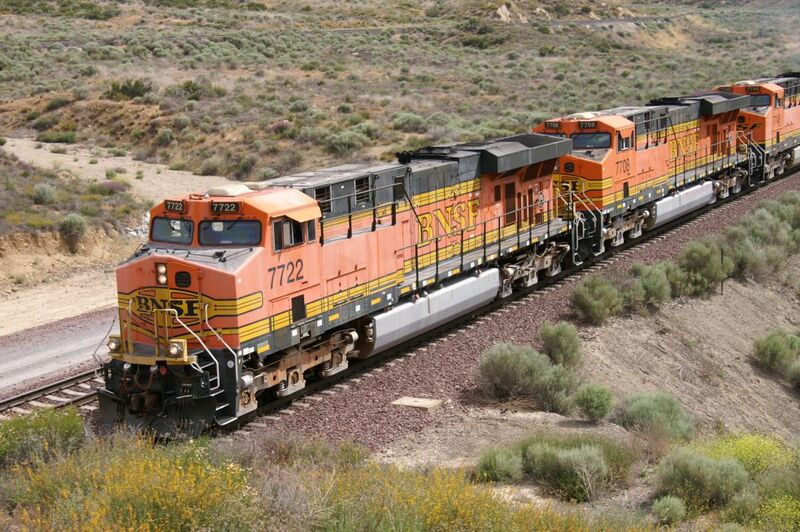 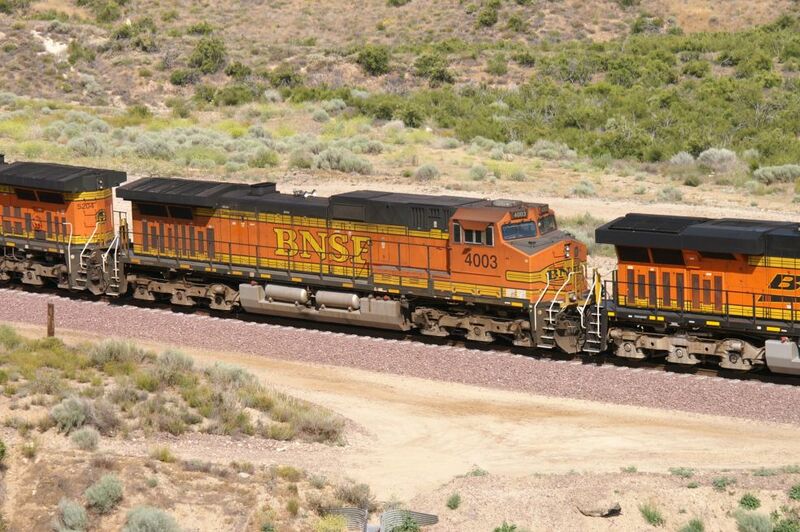 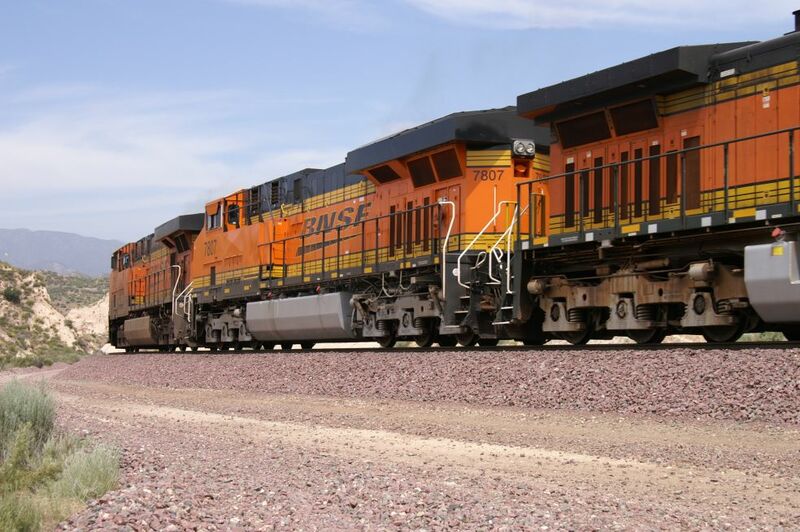 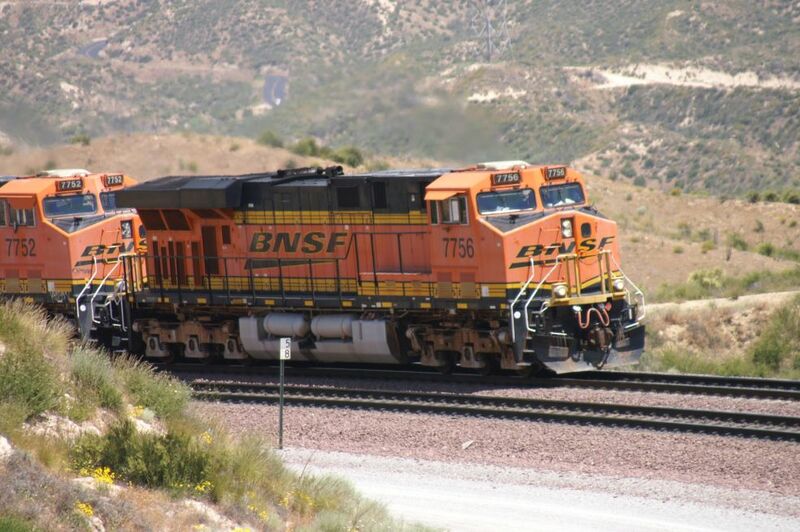 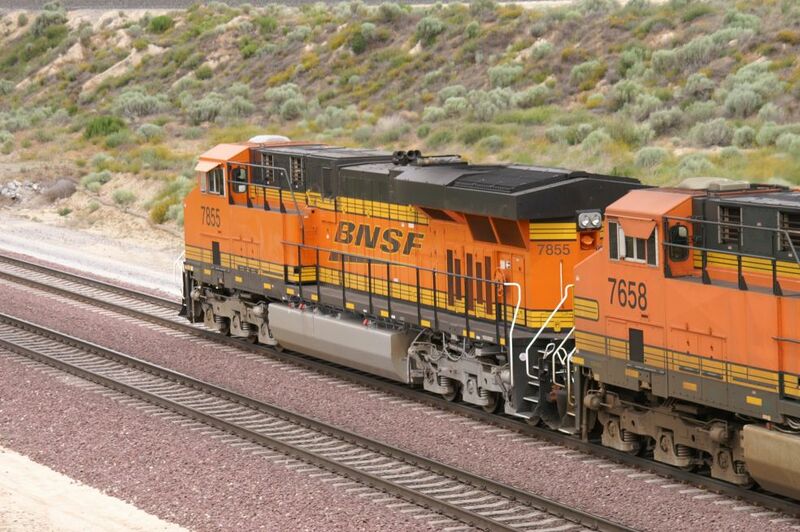 I just made it on time to catch a BNSF EB mixed freight with 9 locos. 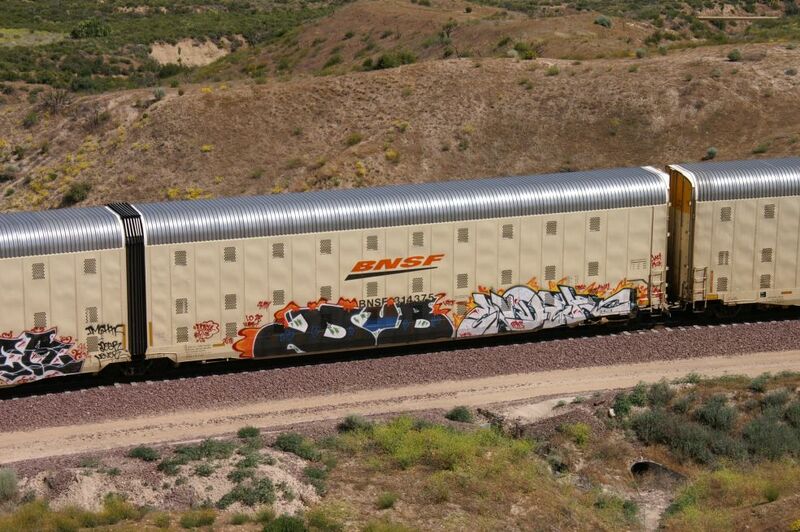 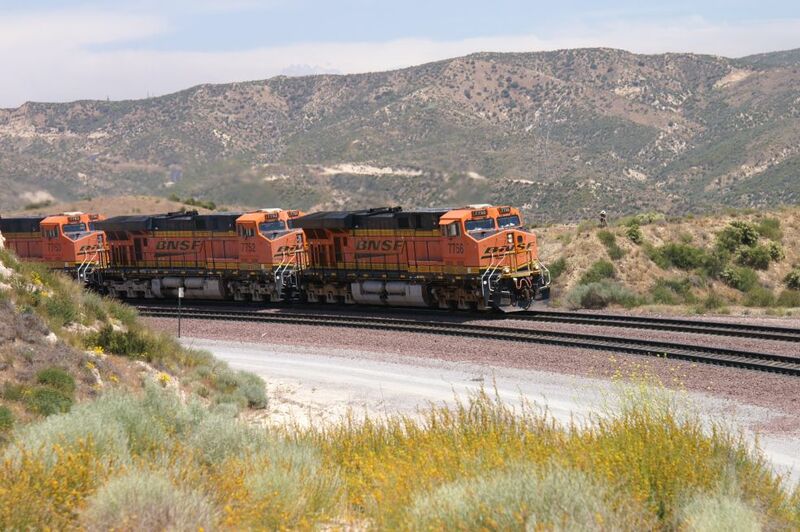 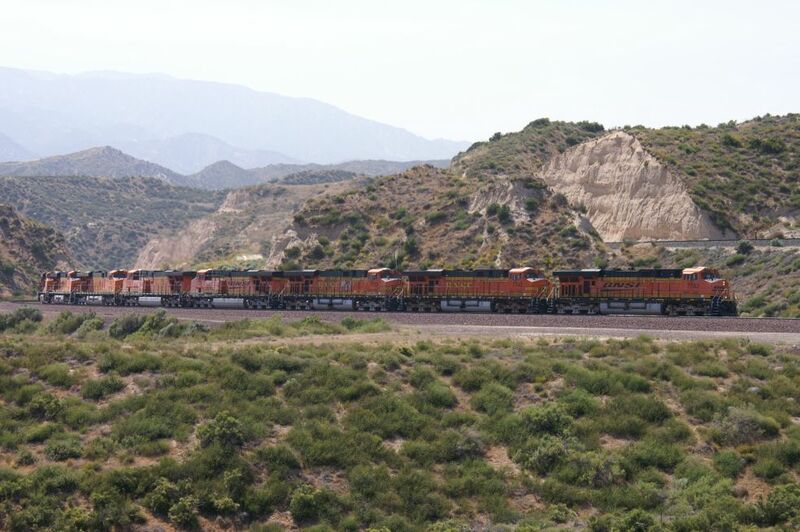 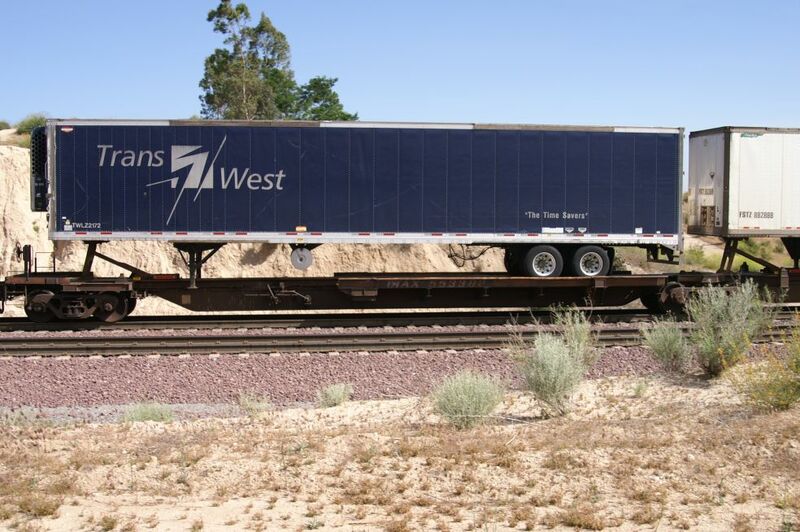 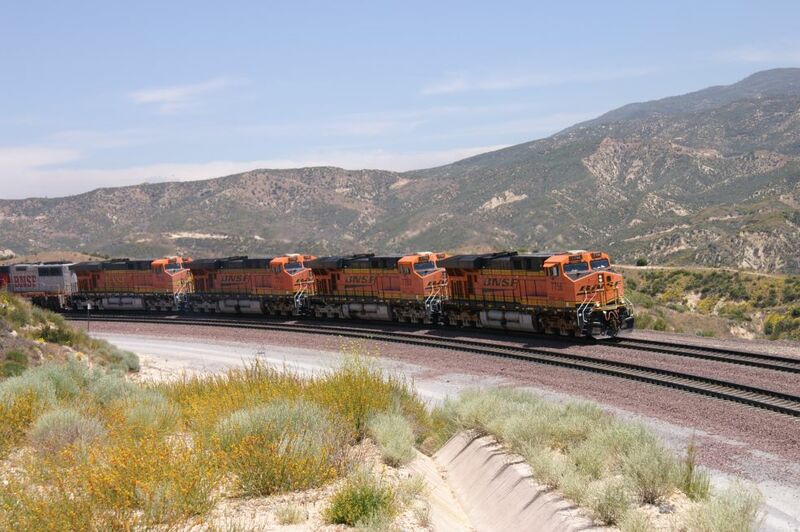 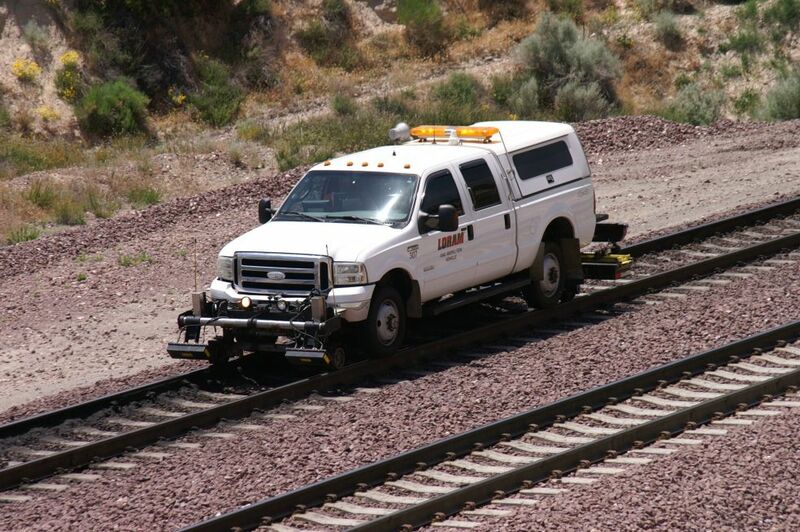 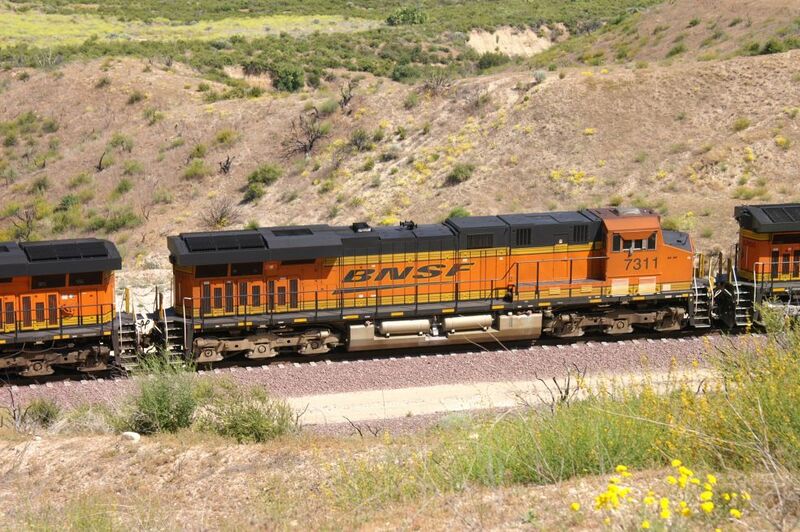 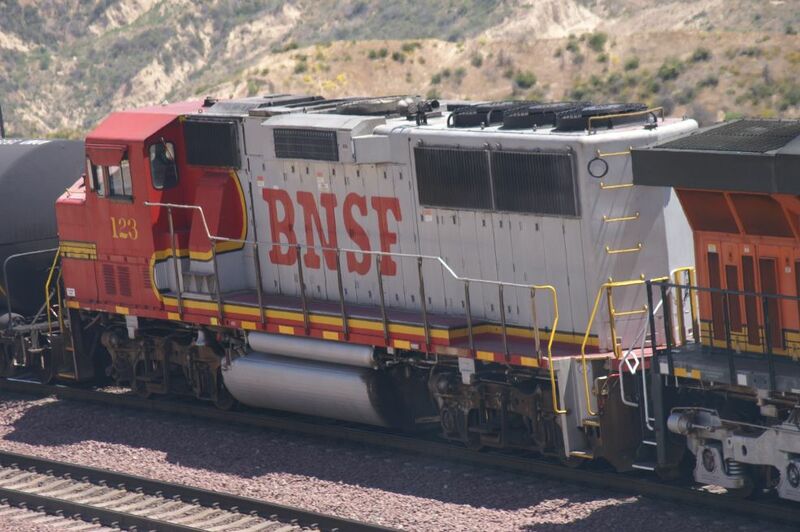 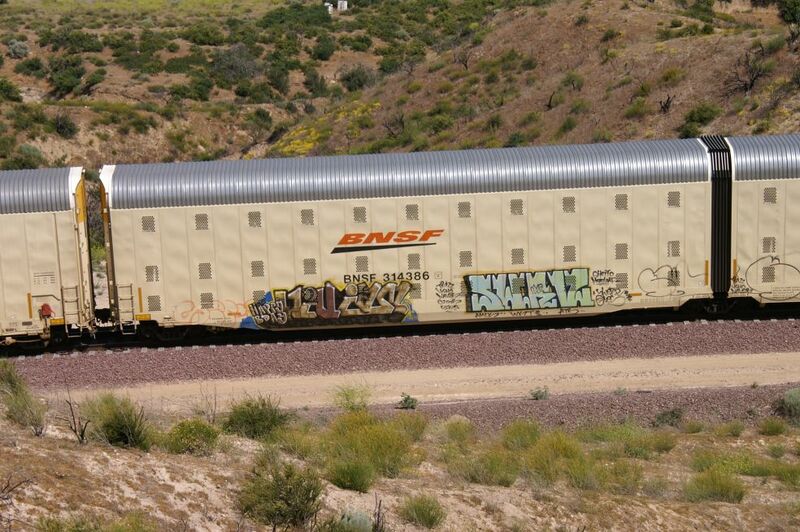 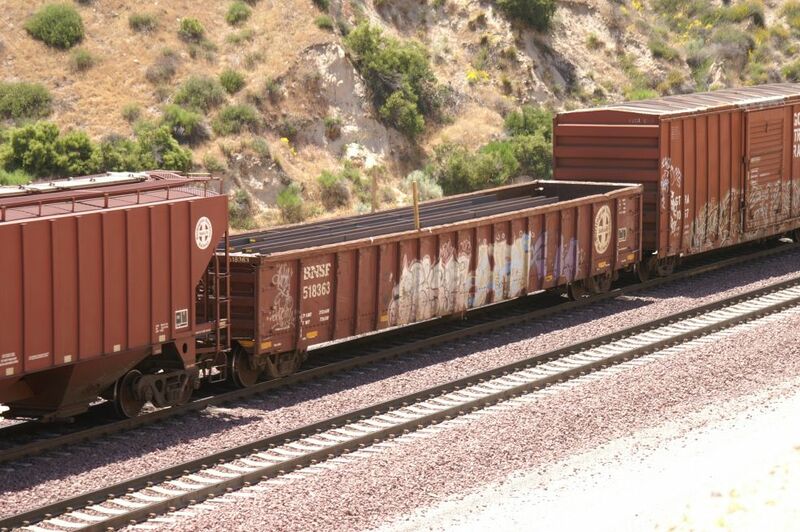 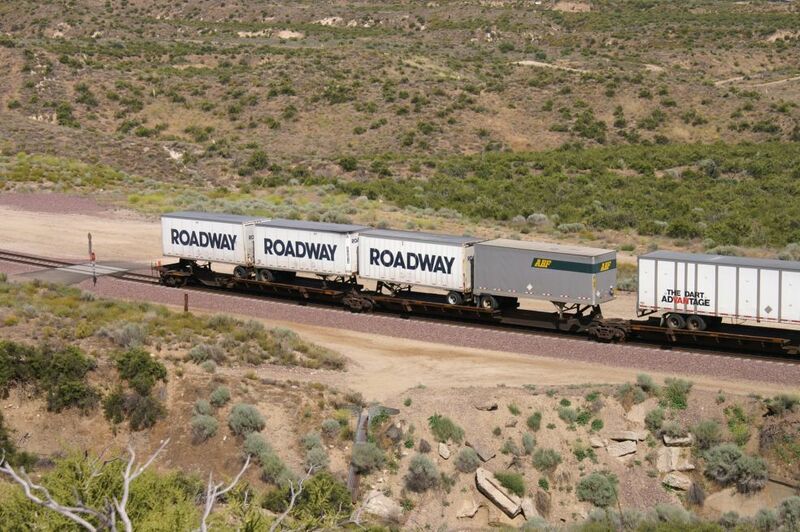 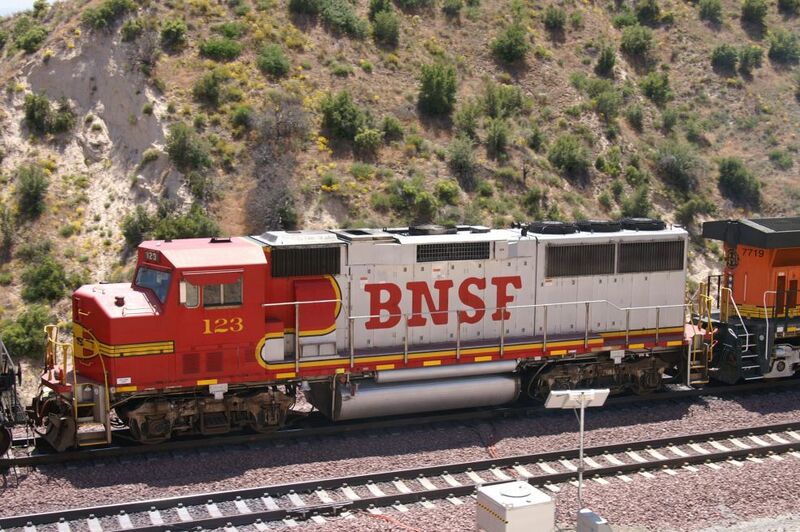 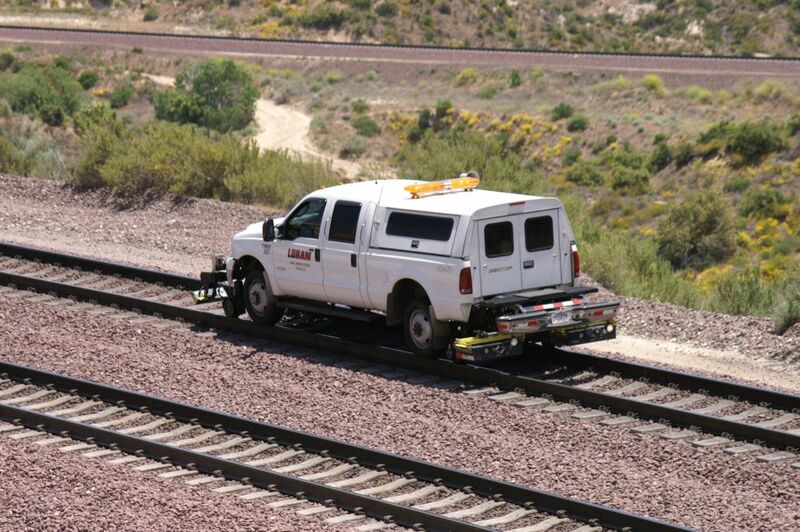 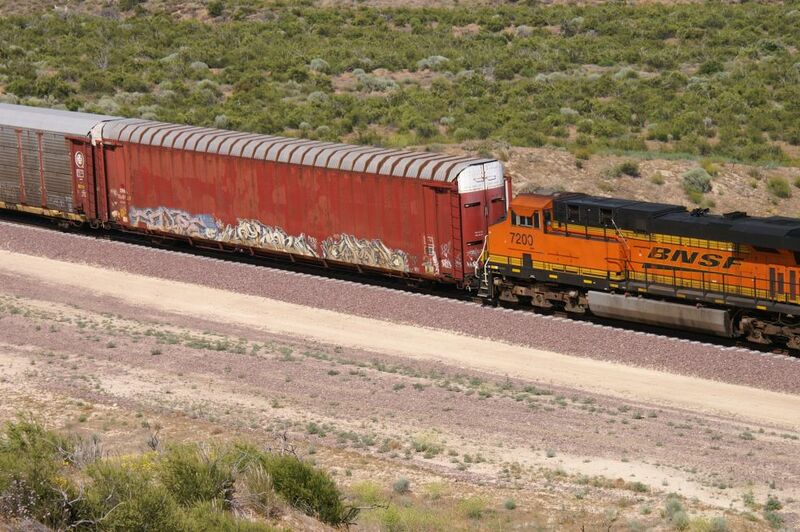 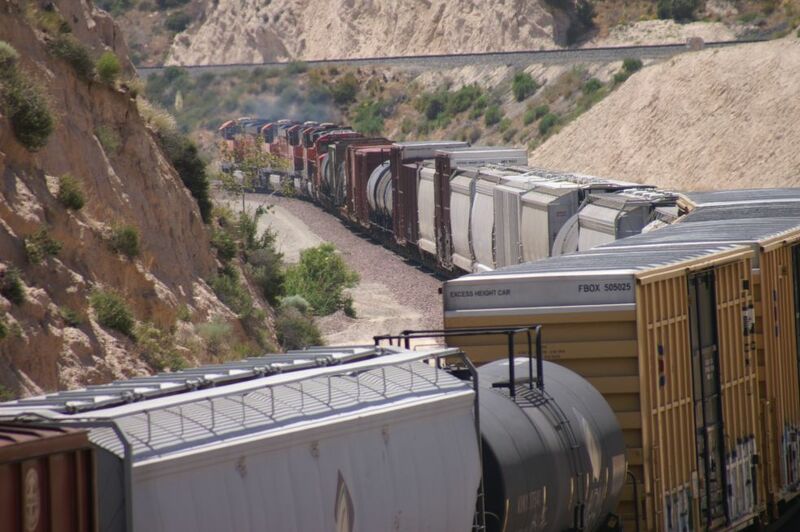 We are lucky to see an all Auto Carrier BNSF WB train coming down on MT-3. 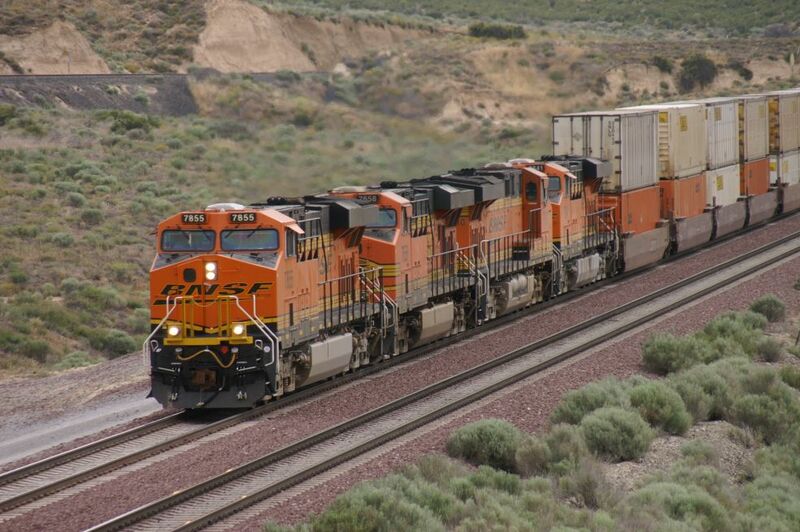 There are 3 engines up front and 2 DPU's (rear end helpers). 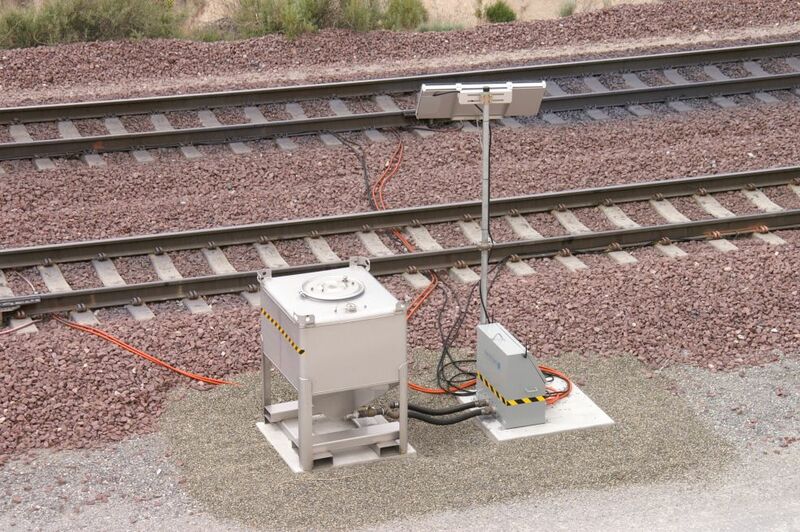 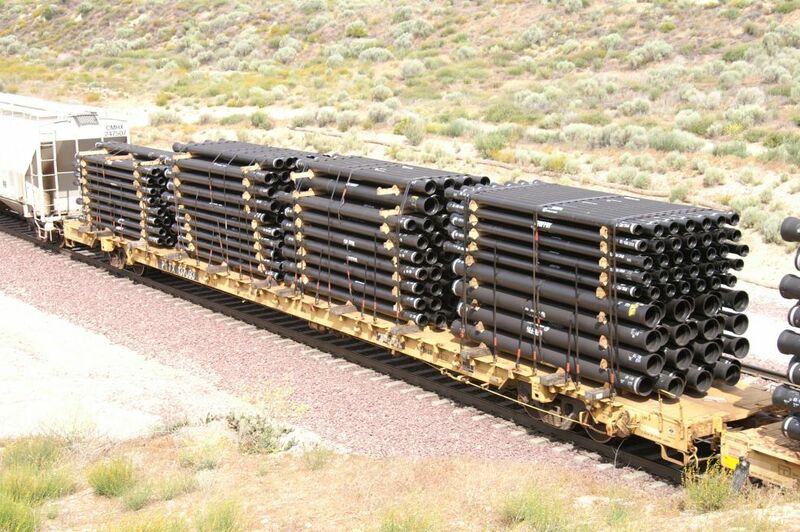 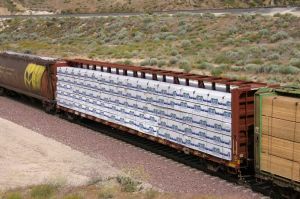 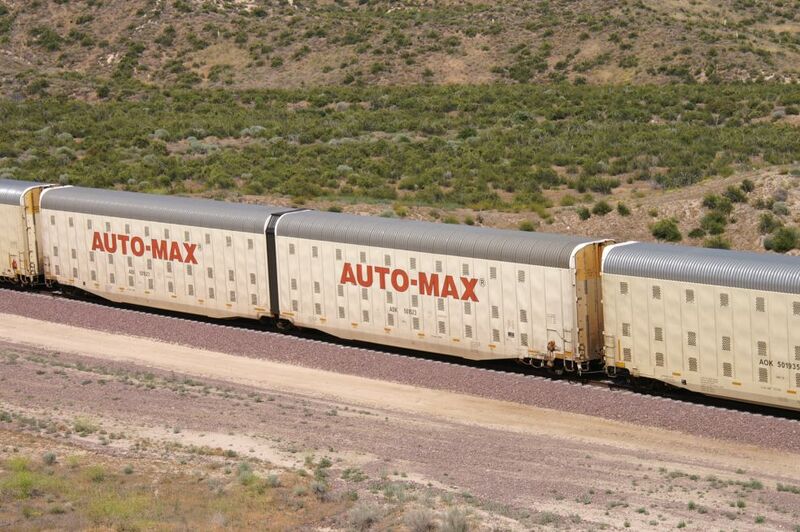 It is an endless train with a big variety of standard Auto Rack and Auto-Max cars. 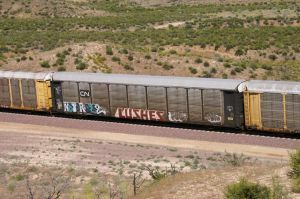 Many cars are having graffiti. Another advantage of taking photos of almost all cars is because of the speed limit of the train going downhill. 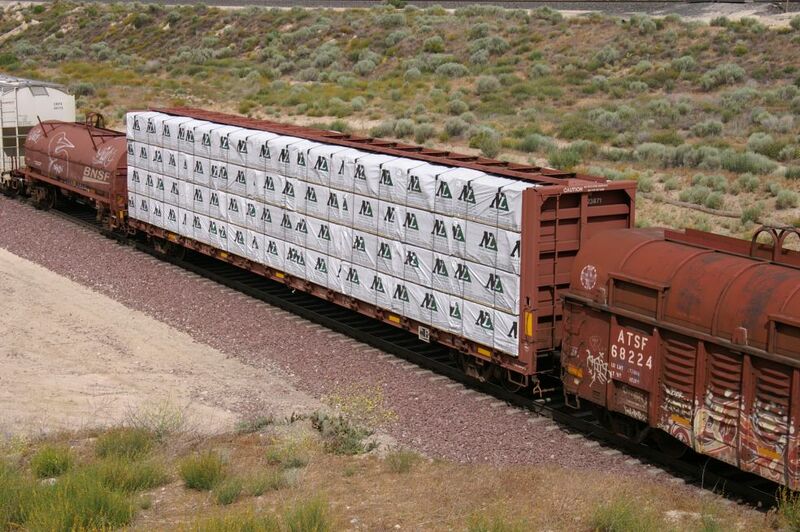 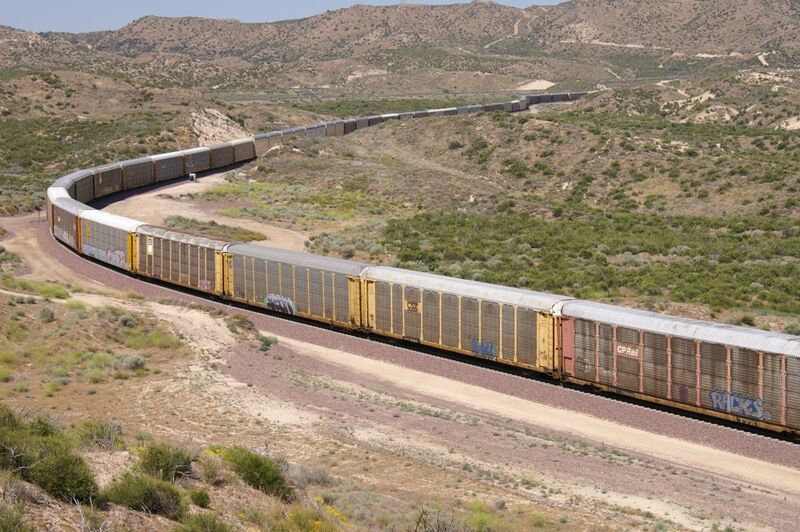 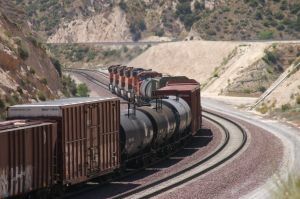 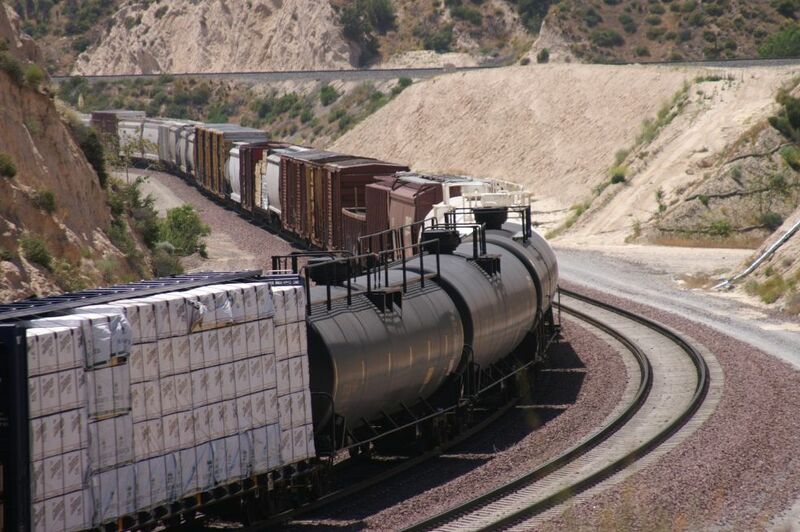 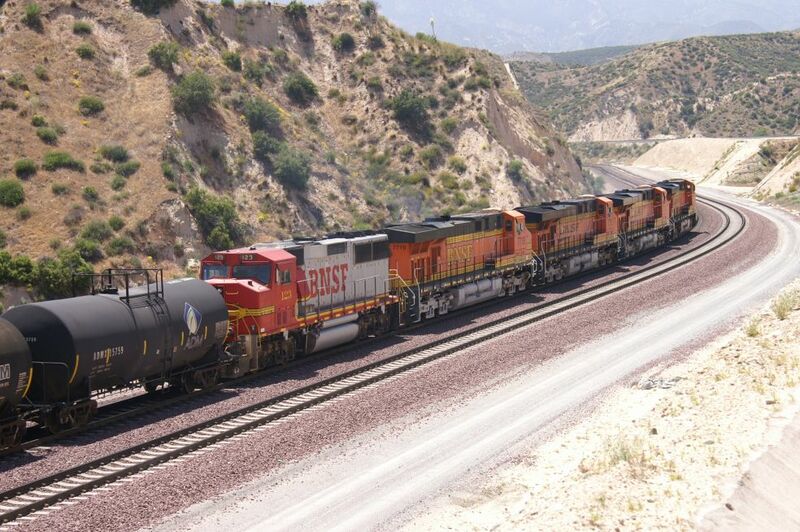 So, do not be surprised to see a total of 43 photos of a single train ! ! 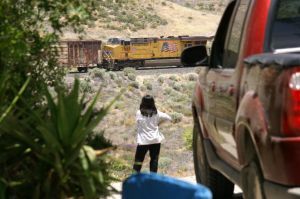 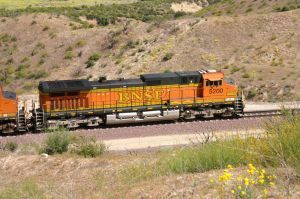 As we saw a UP train coming down on BNSF MT-2 in the distance, we decided to go across the Hill on the North side to be on the sunny side. 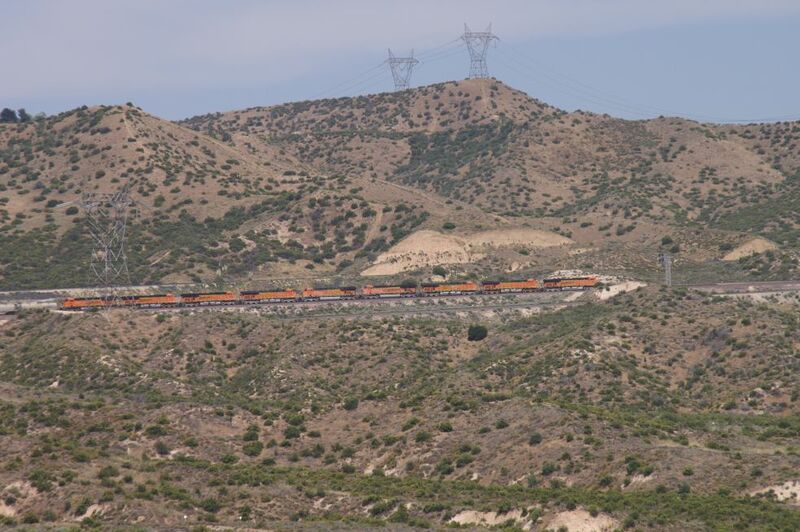 After a short discussion, some of the photographers (railfans) will be leaving Hill 582 (photo 1143) to go on the other side, which is between the BNSF tracks and the UPT. 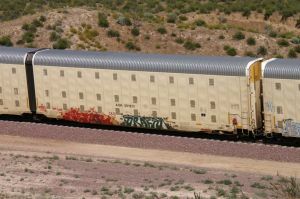 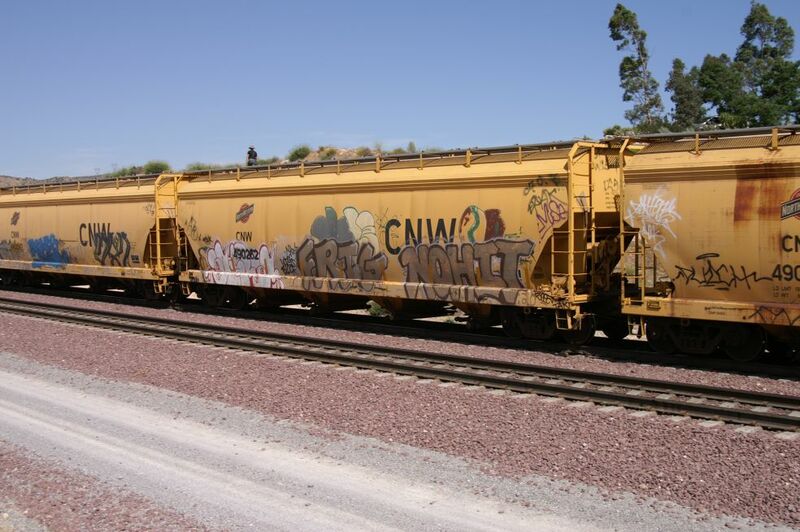 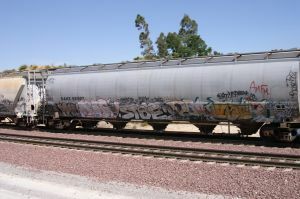 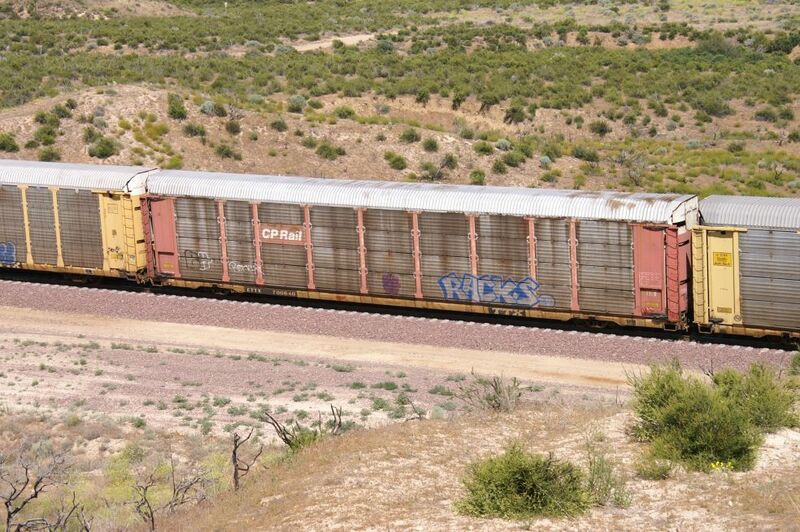 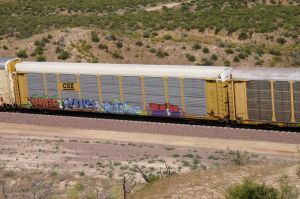 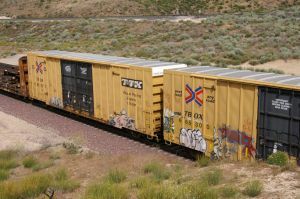 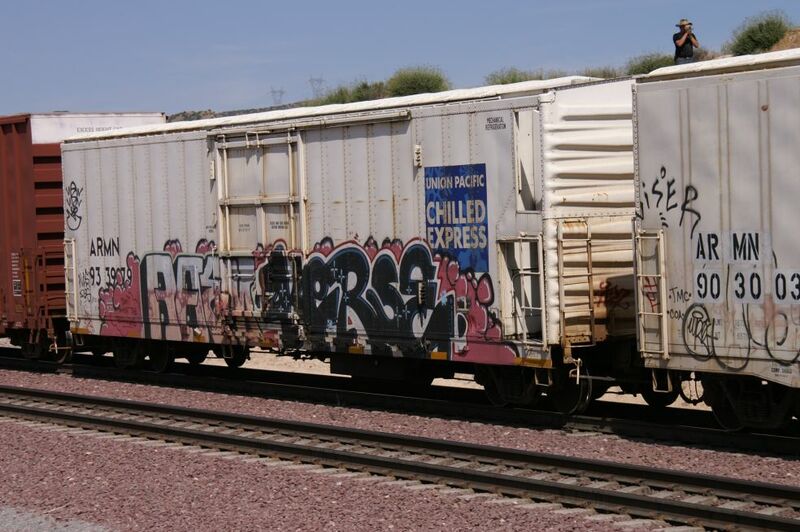 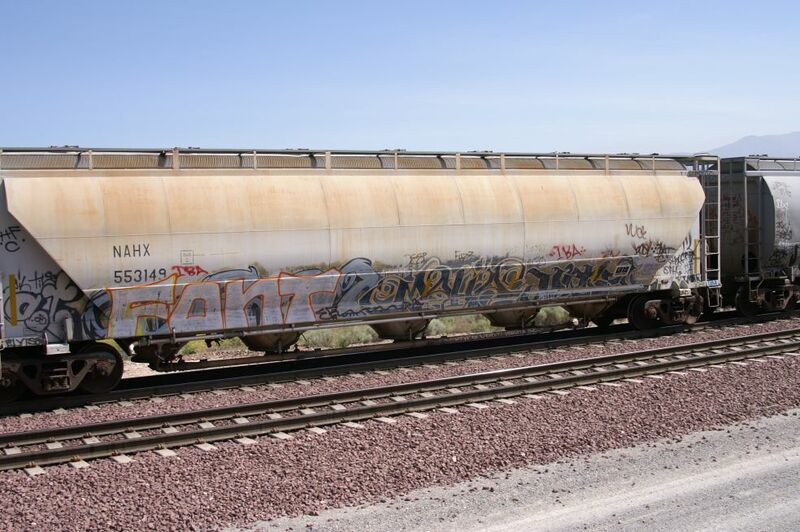 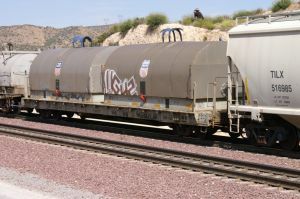 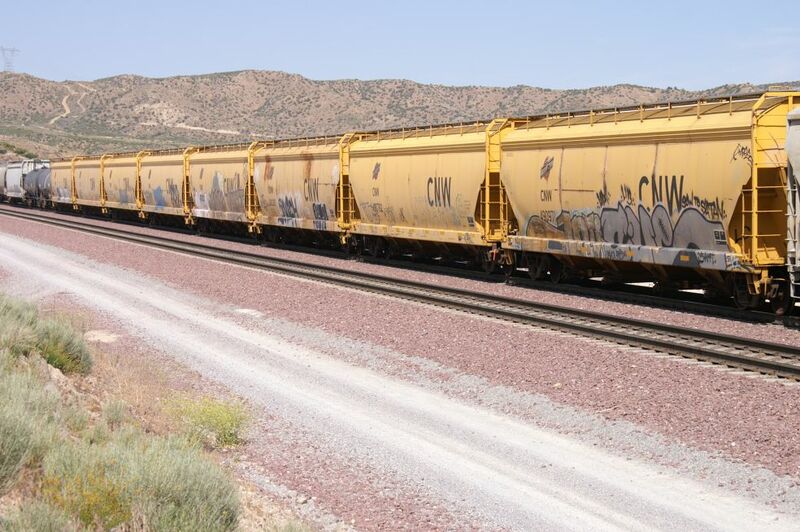 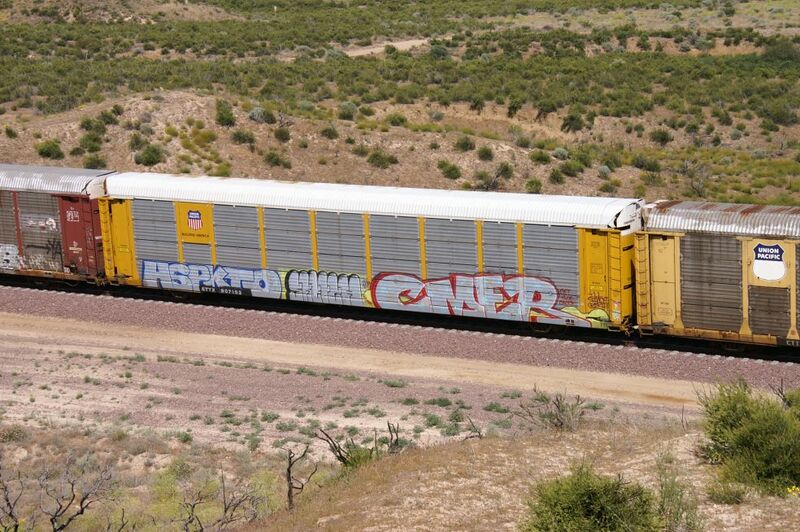 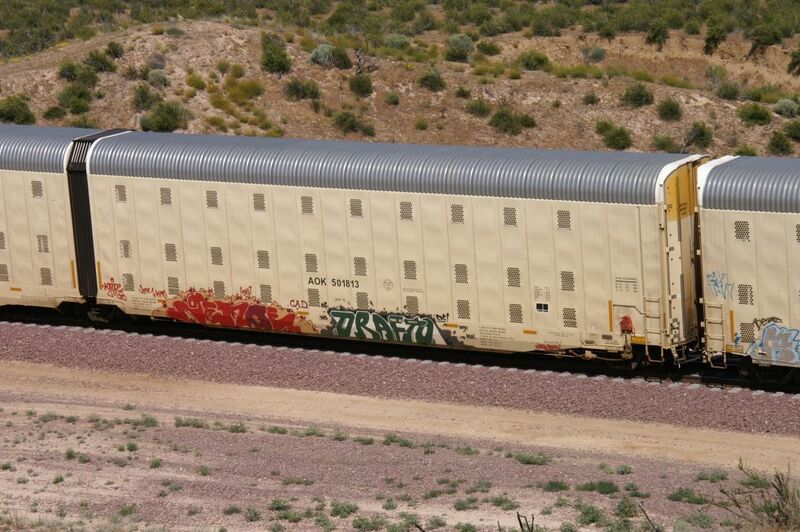 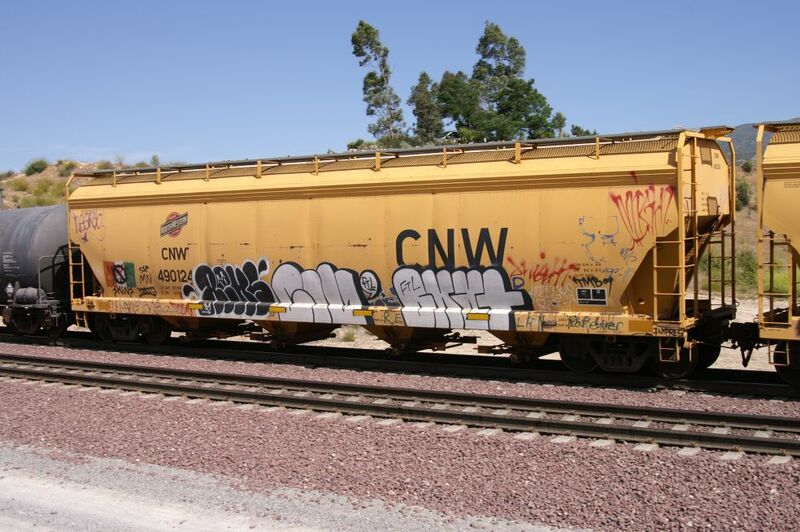 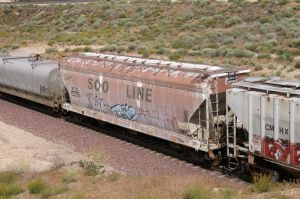 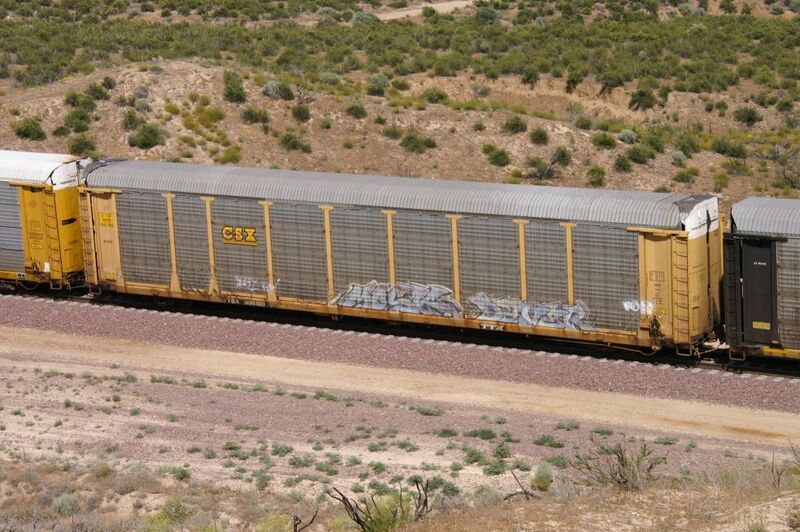 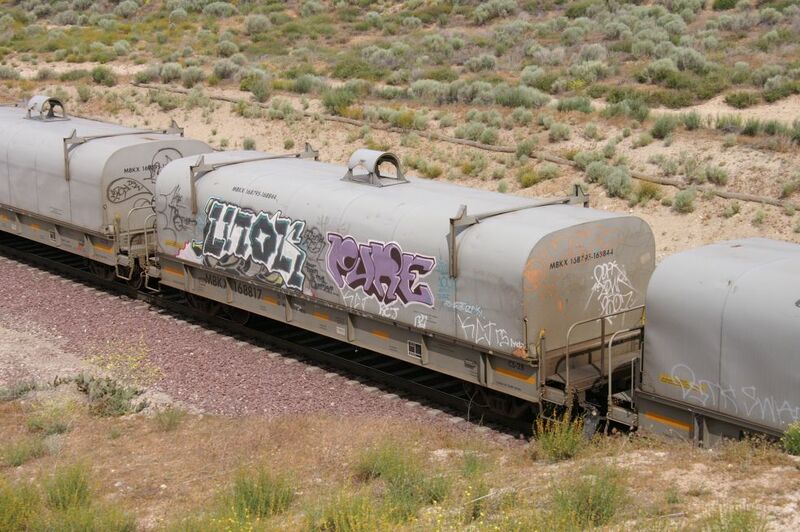 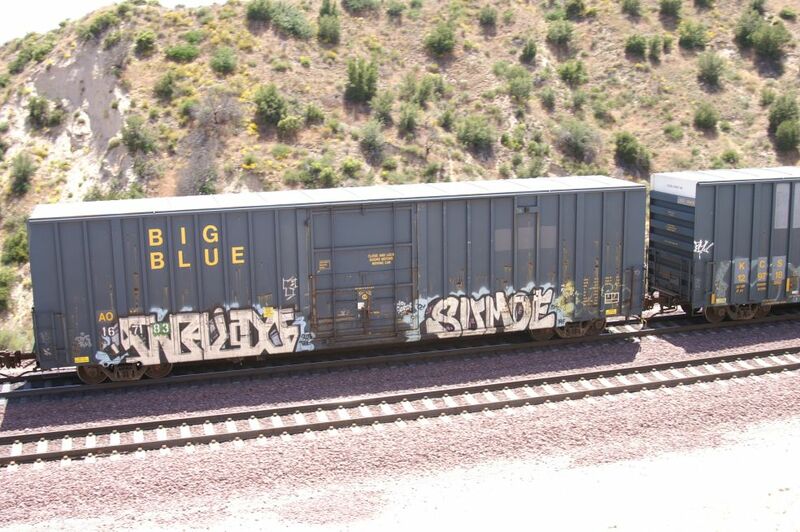 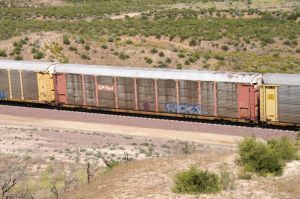 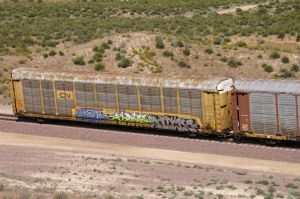 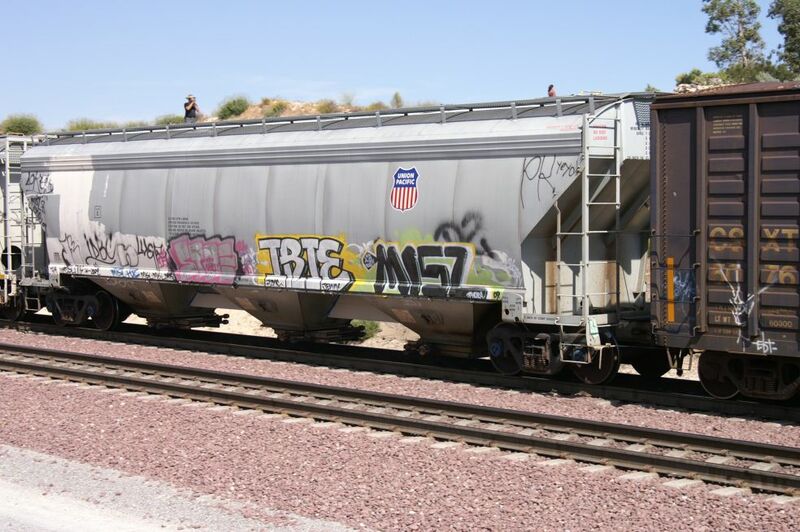 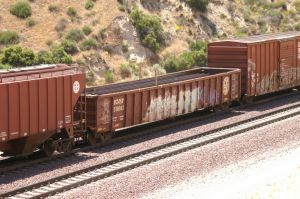 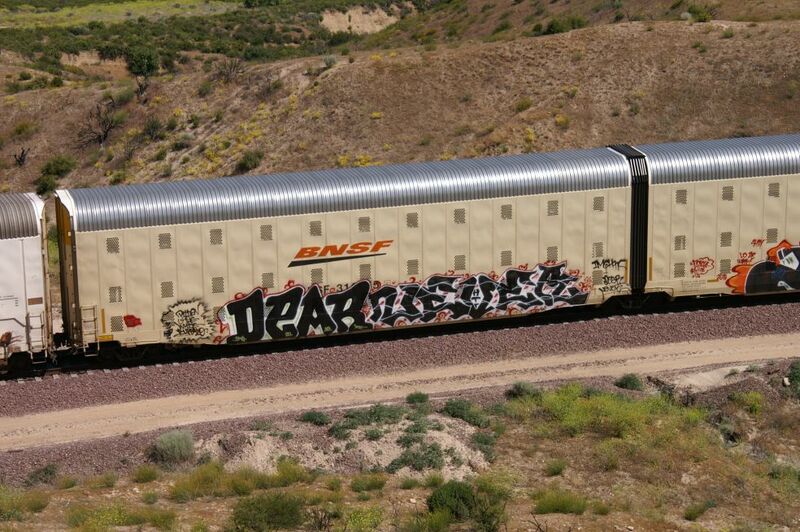 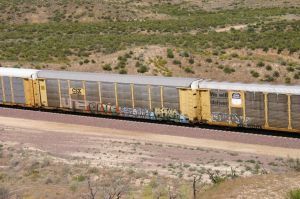 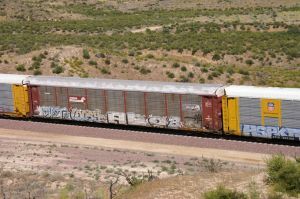 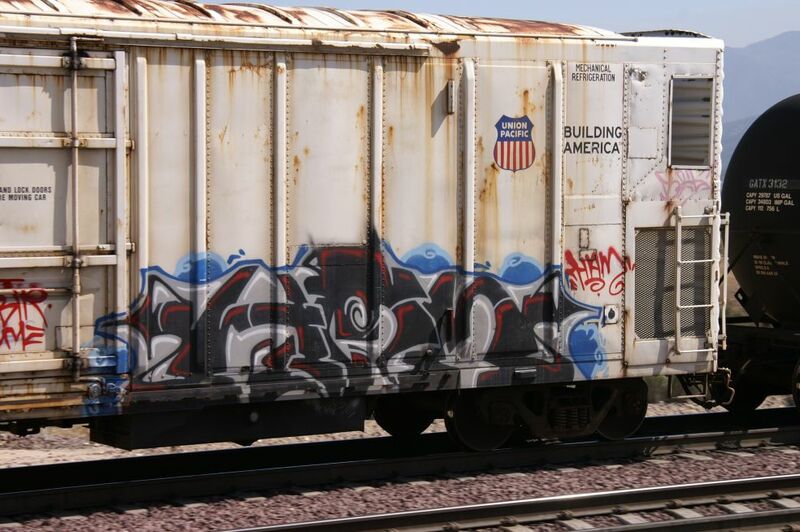 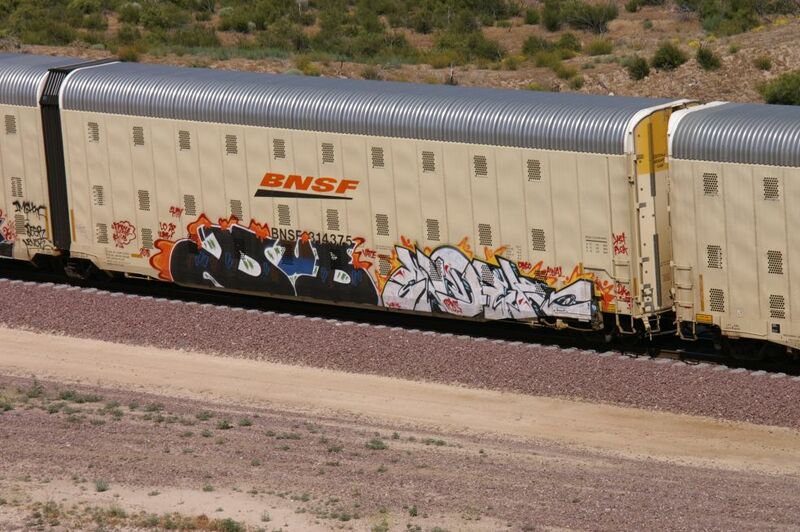 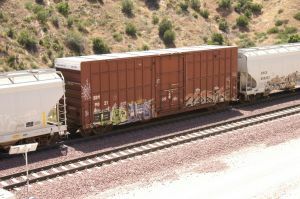 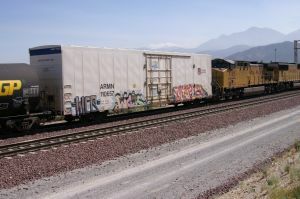 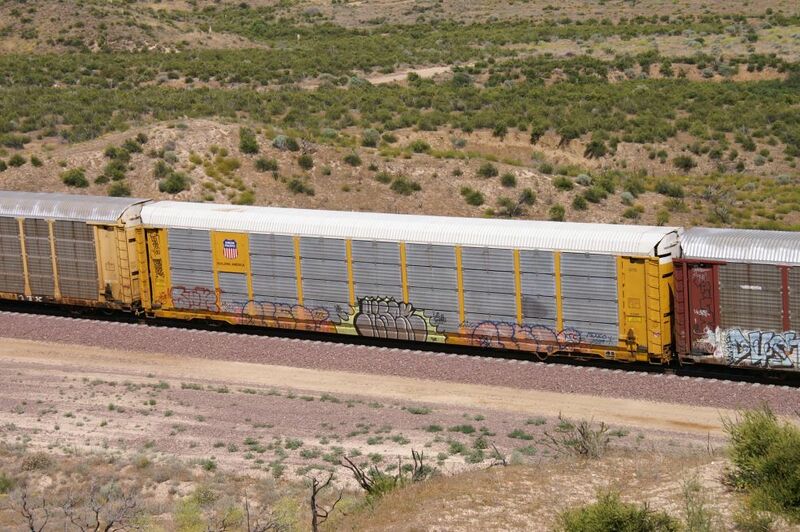 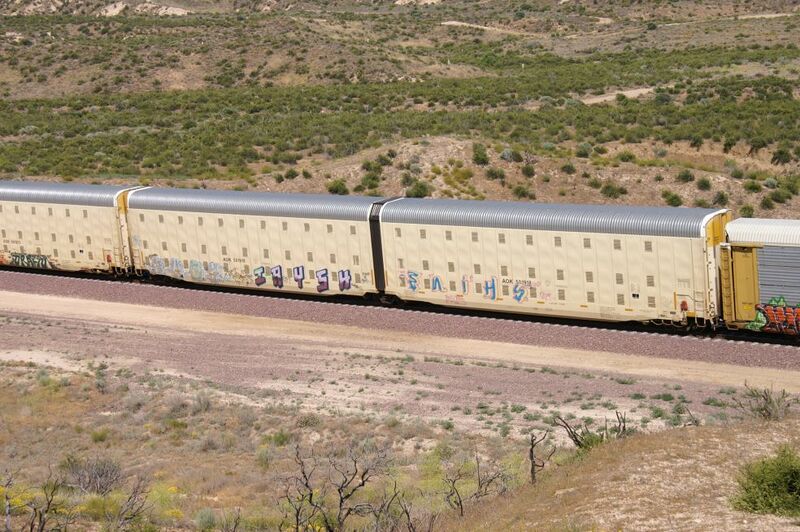 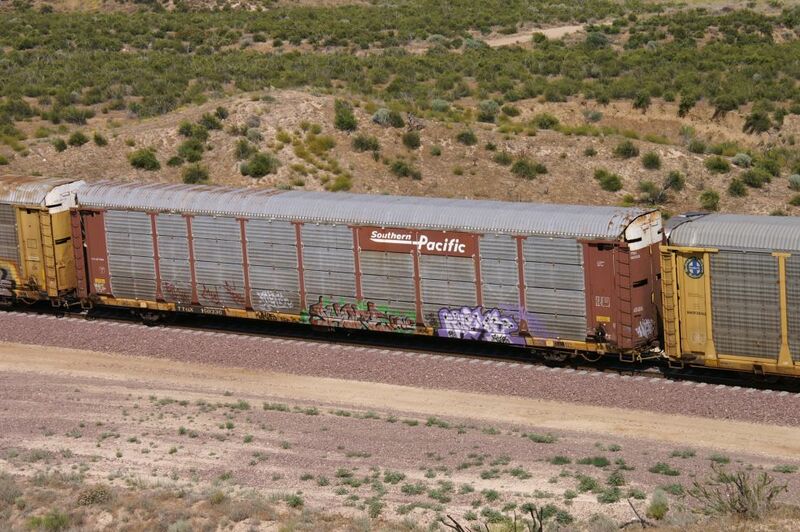 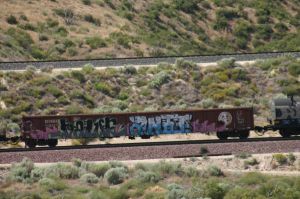 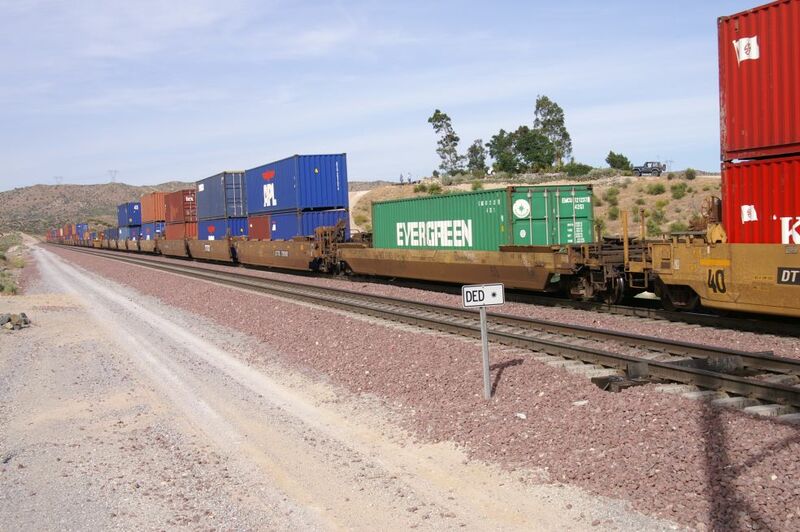 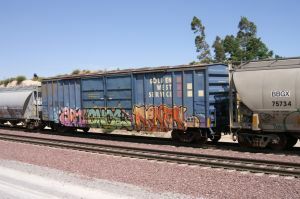 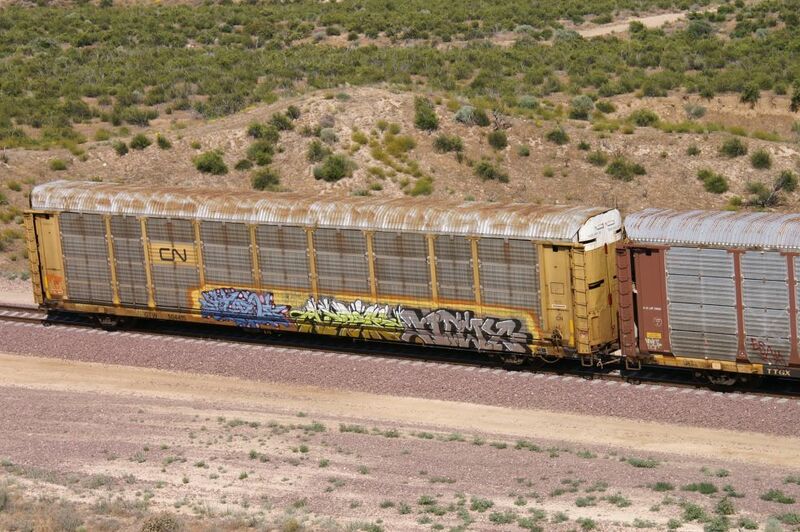 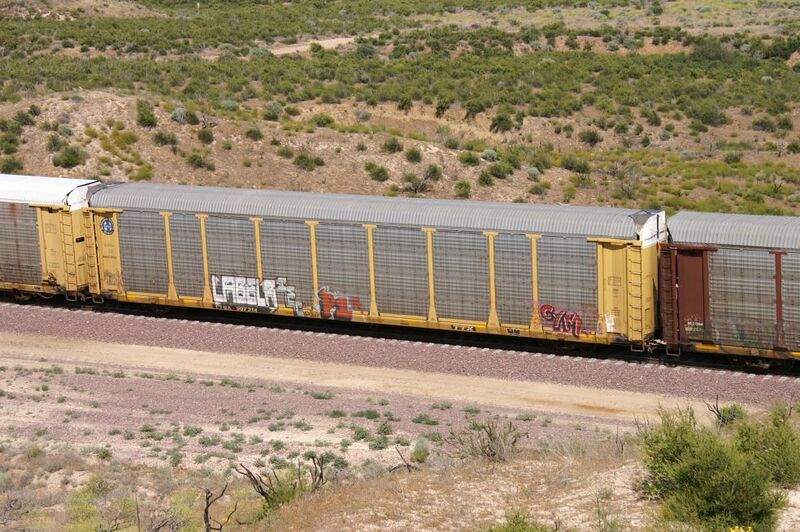 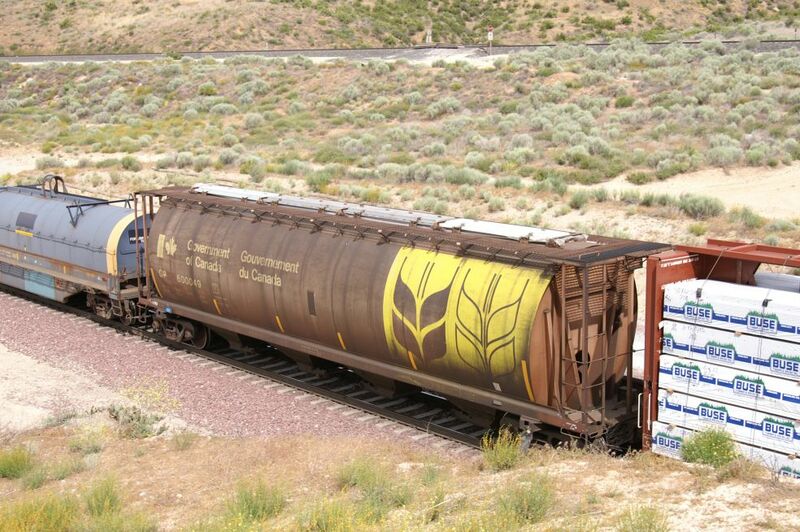 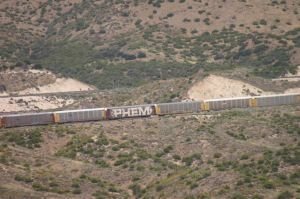 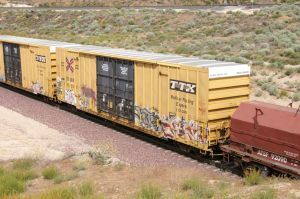 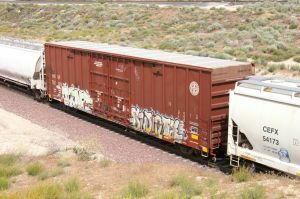 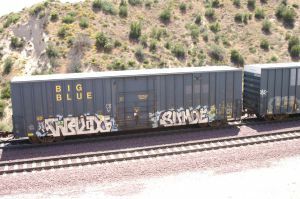 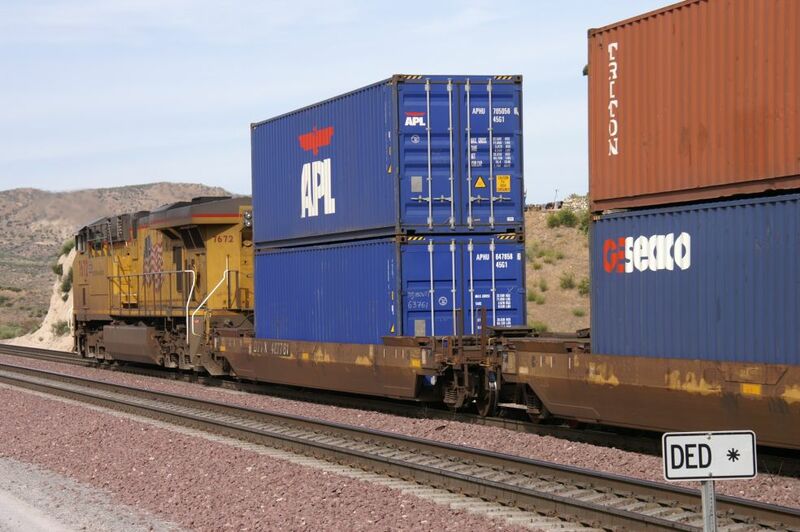 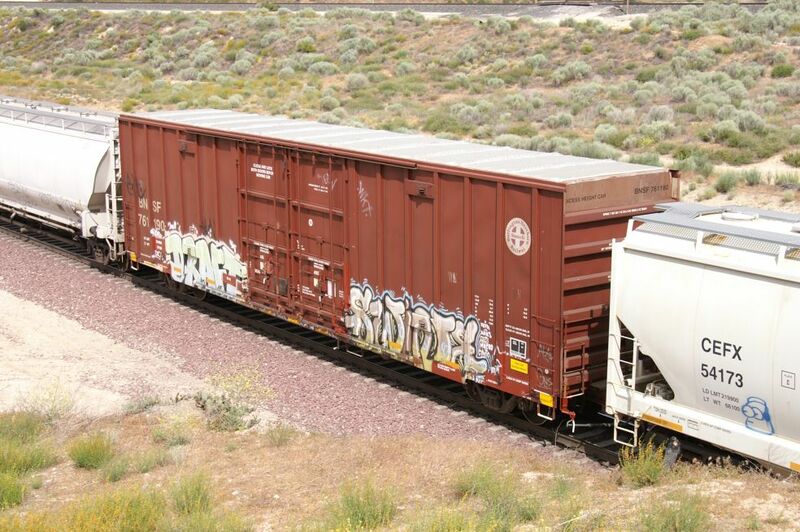 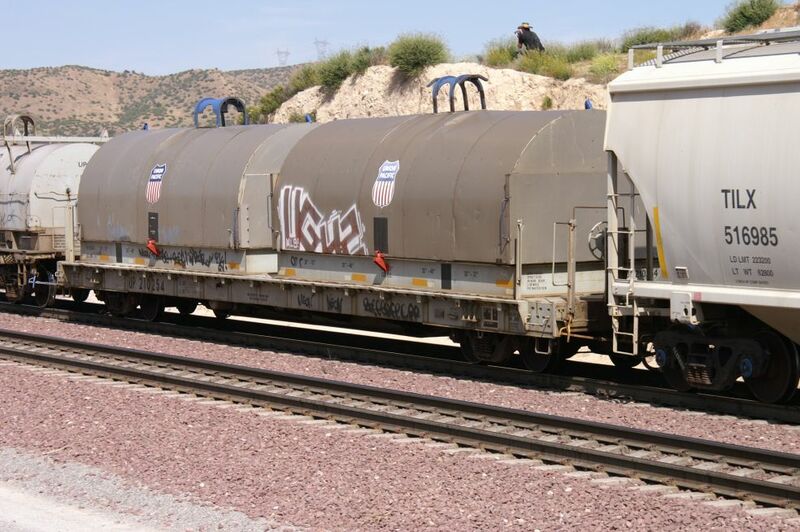 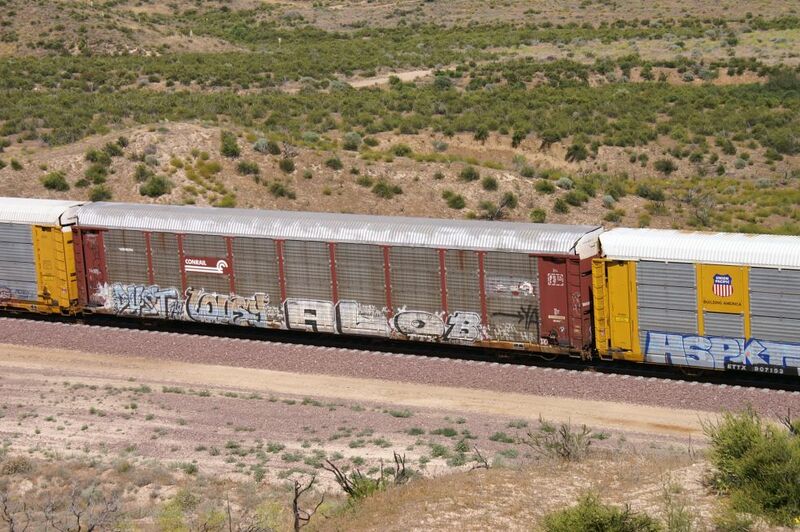 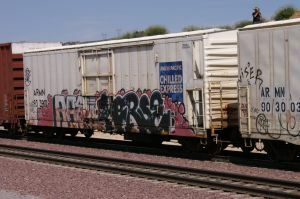 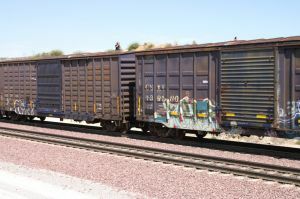 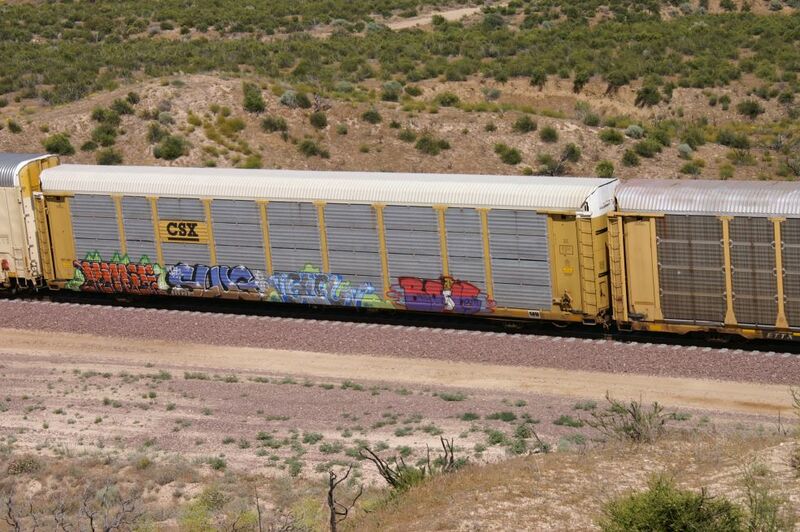 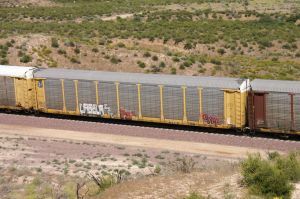 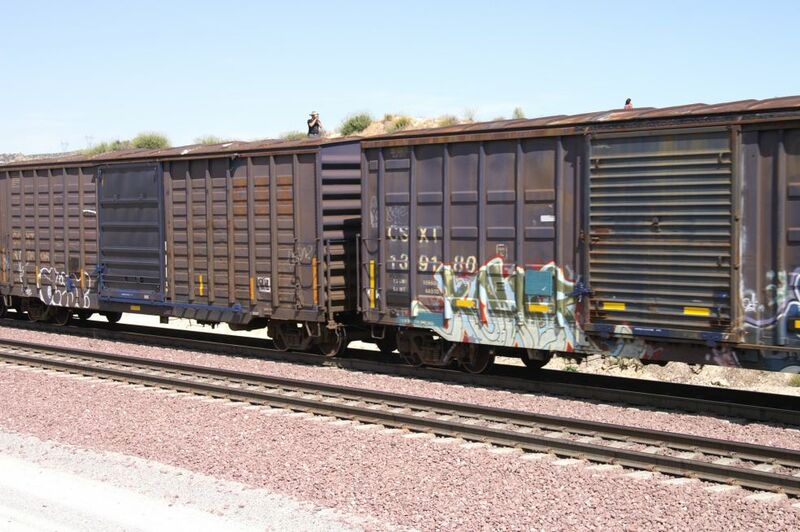 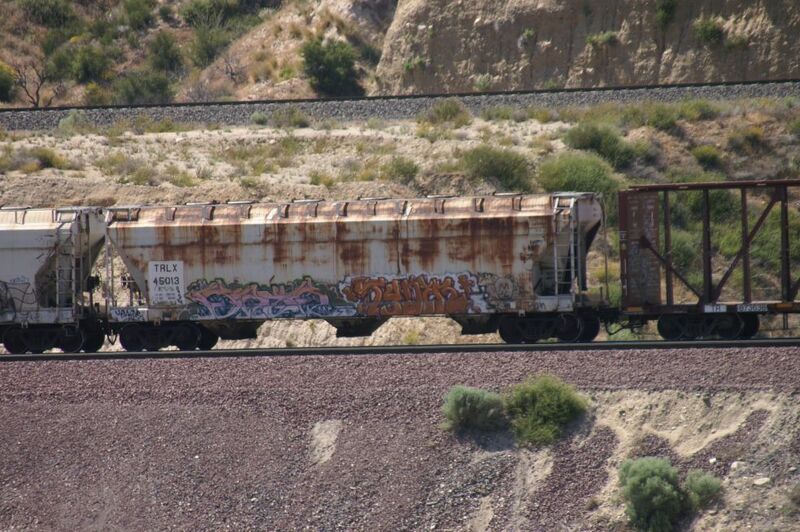 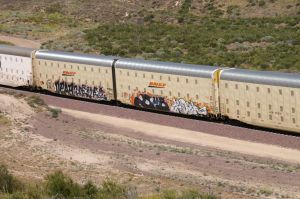 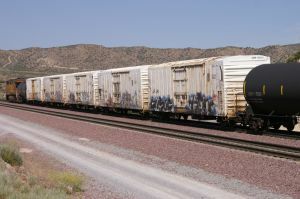 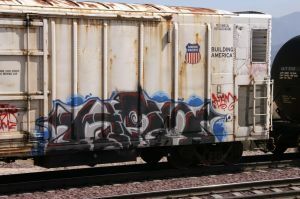 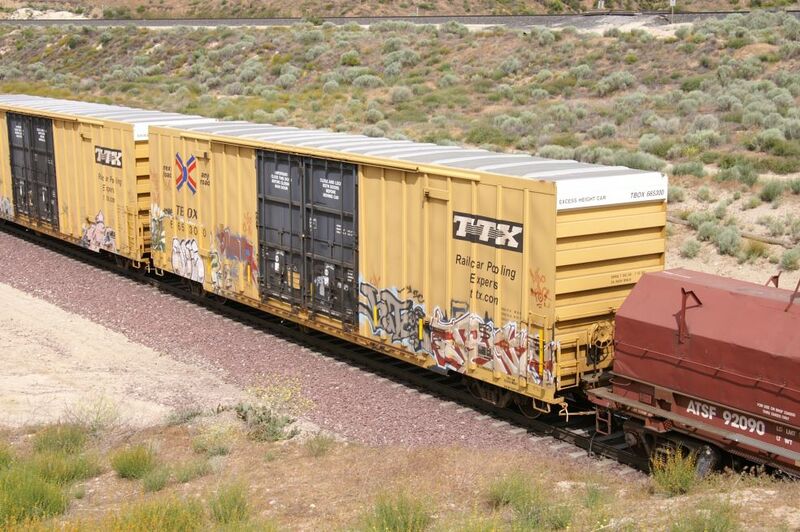 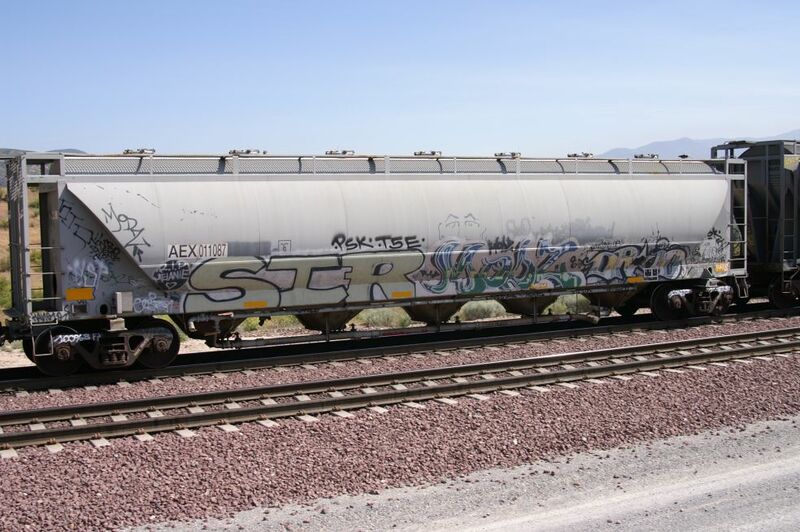 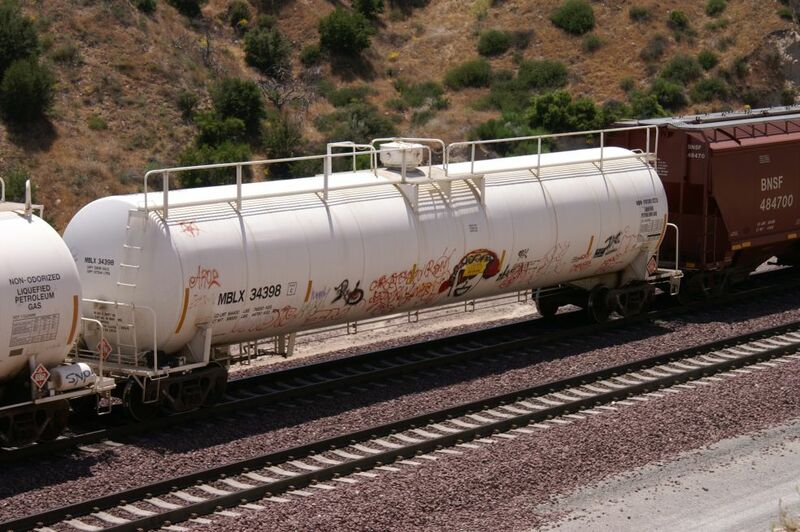 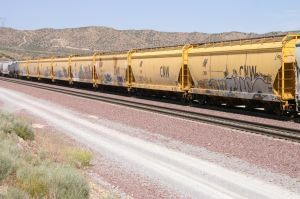 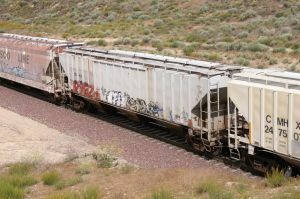 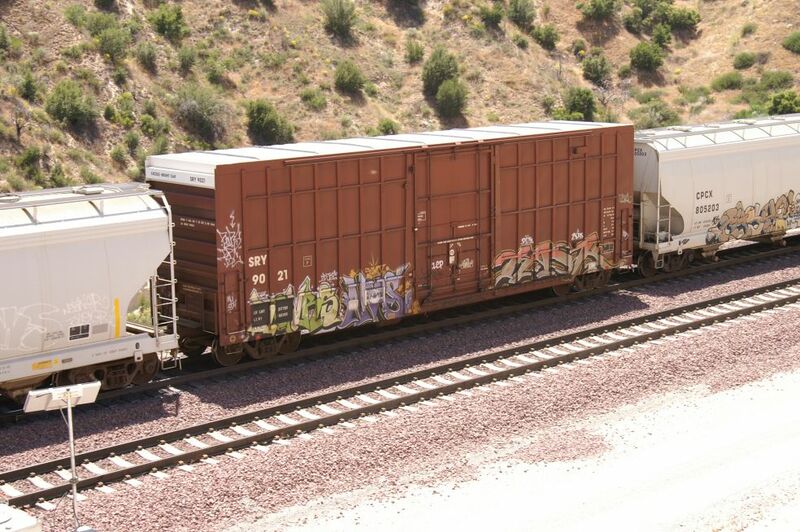 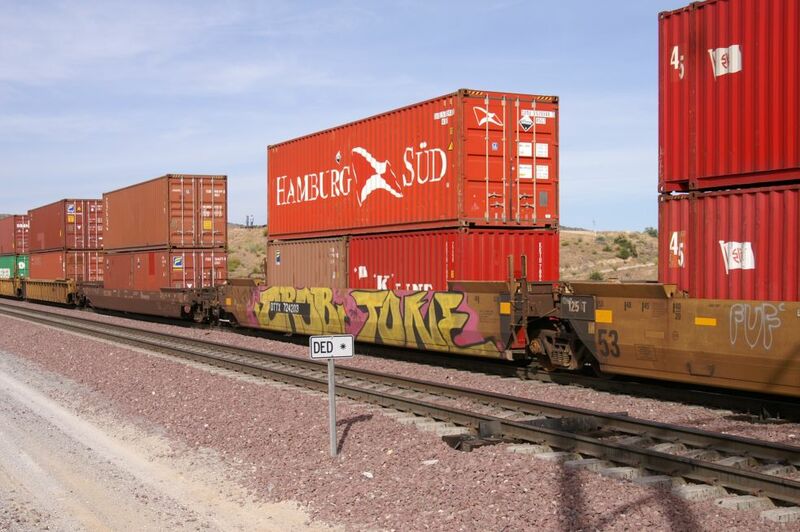 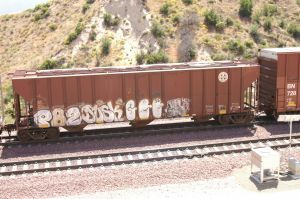 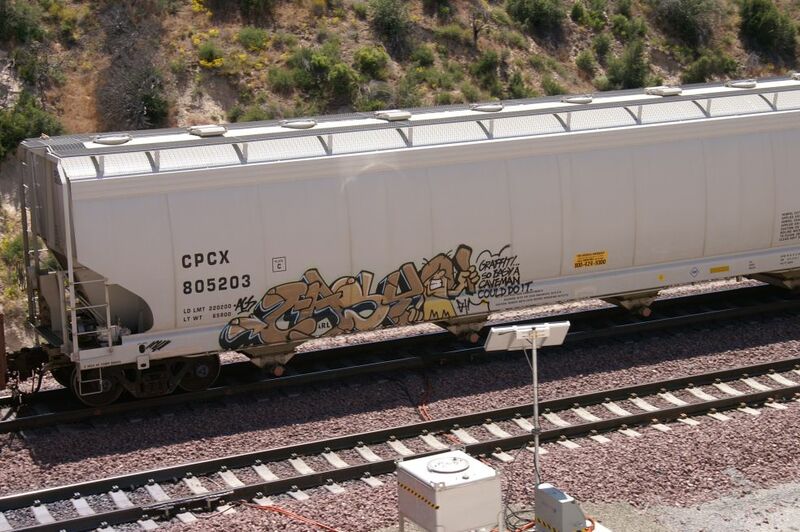 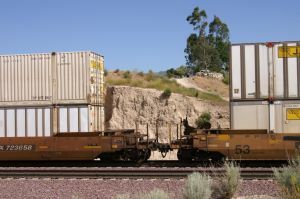 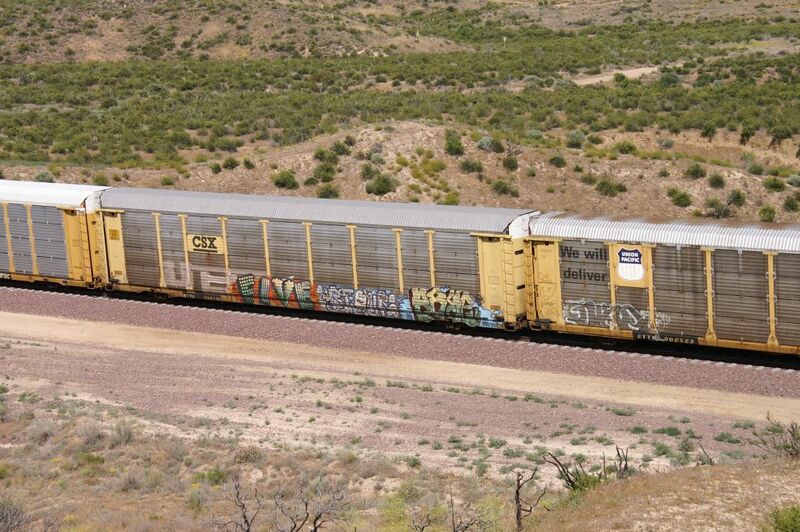 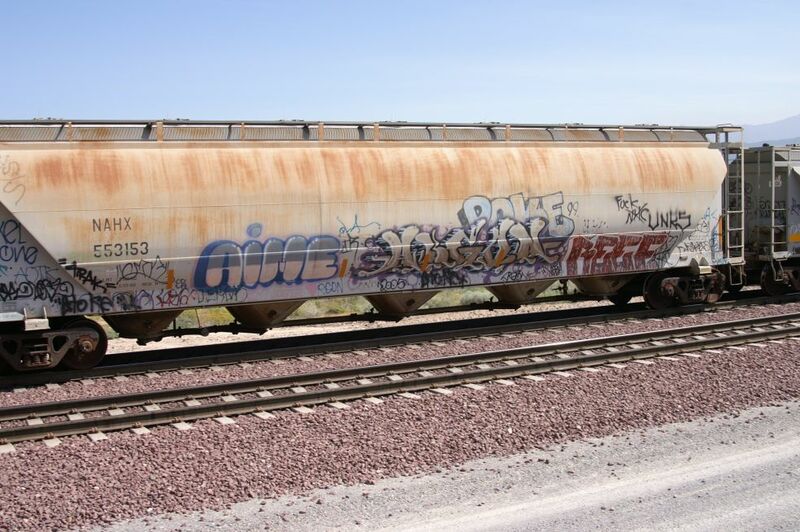 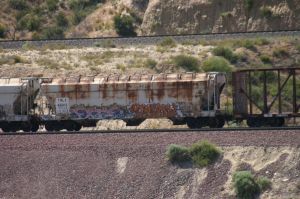 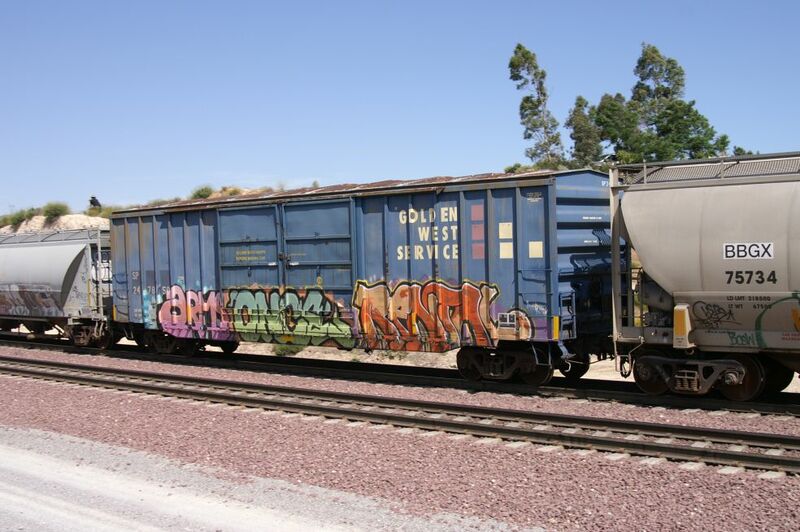 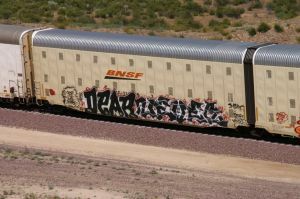 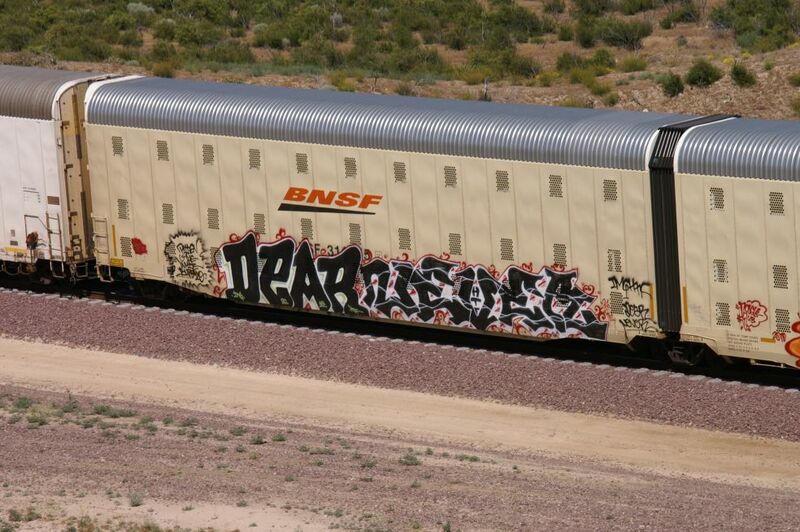 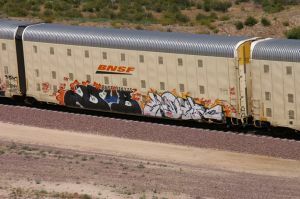 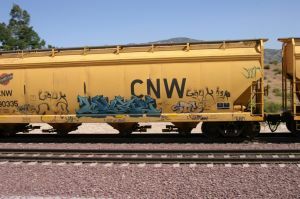 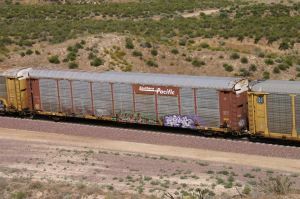 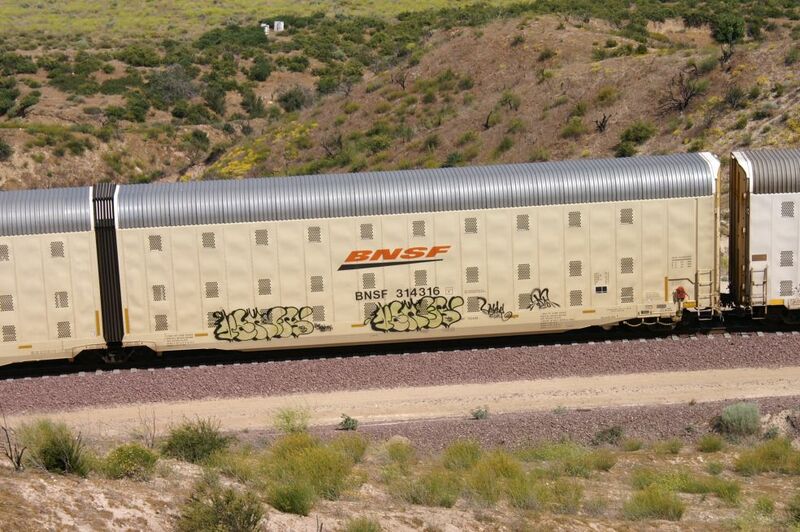 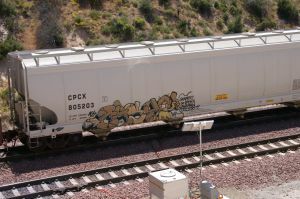 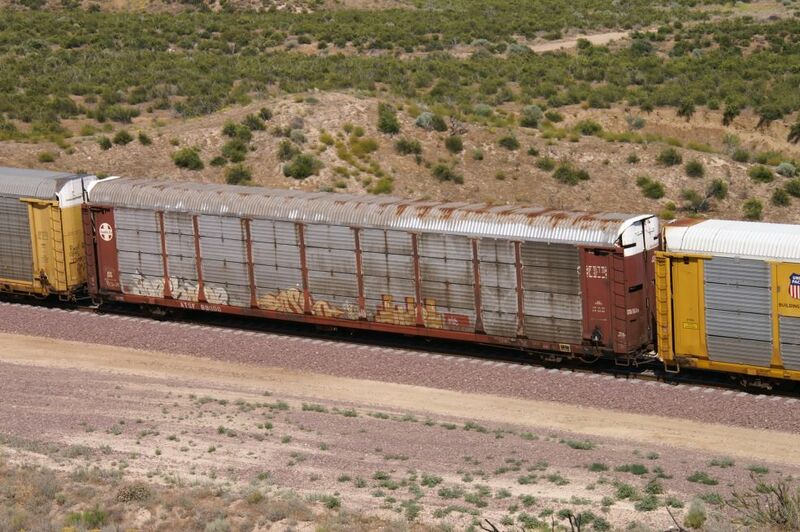 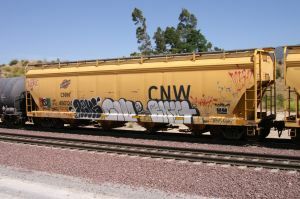 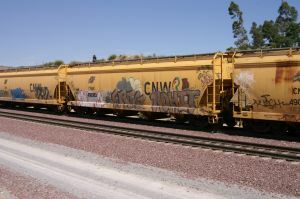 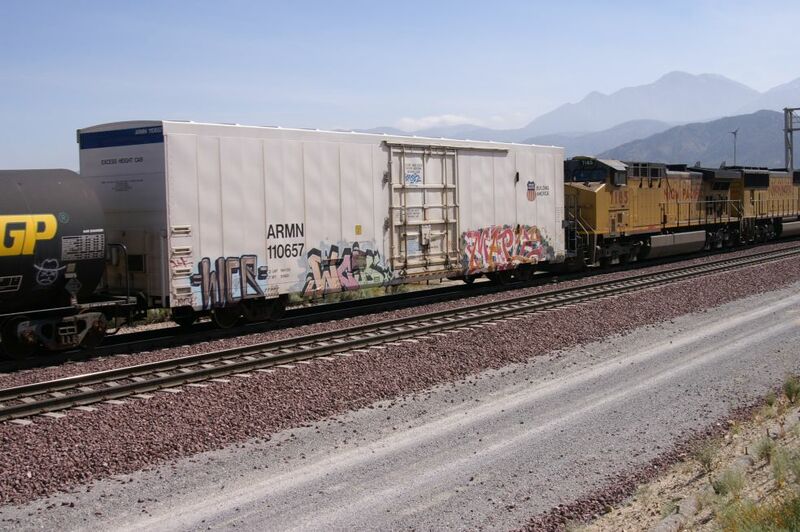 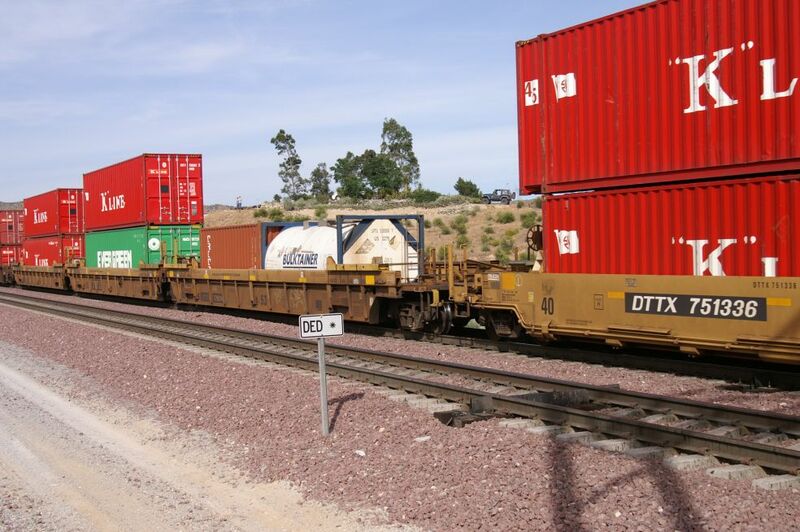 Once again, we got a mixed freight and many cars are full of graffiti. 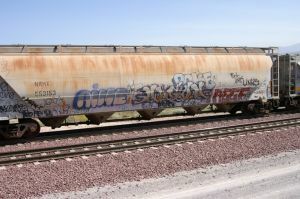 So, we took lots of pictures to show the different cars with graffiti. 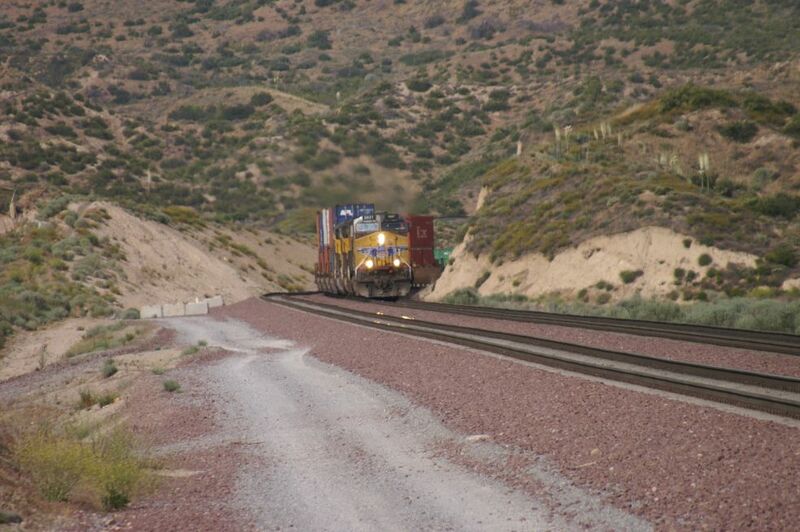 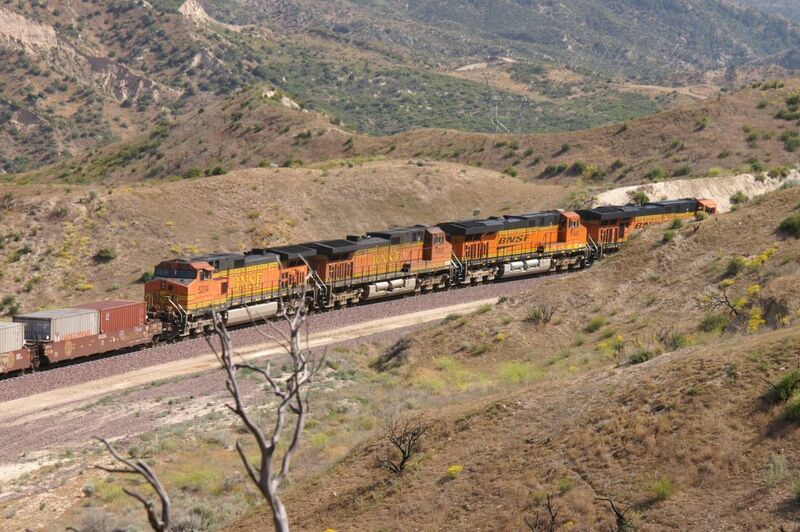 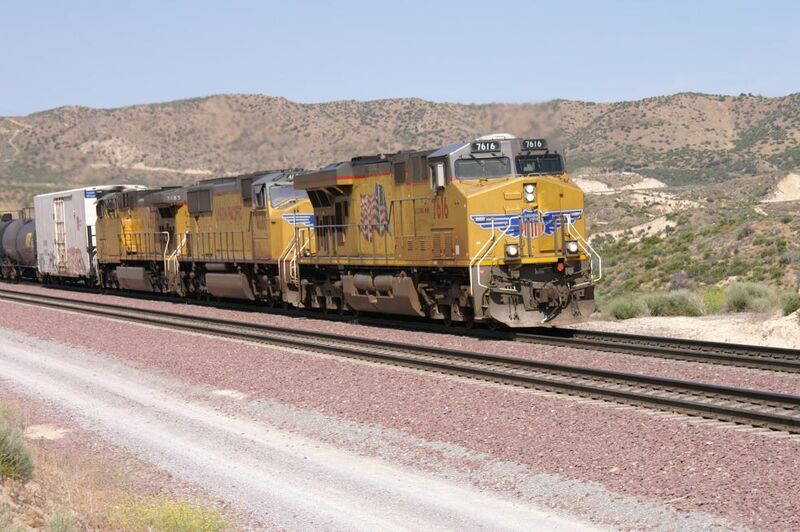 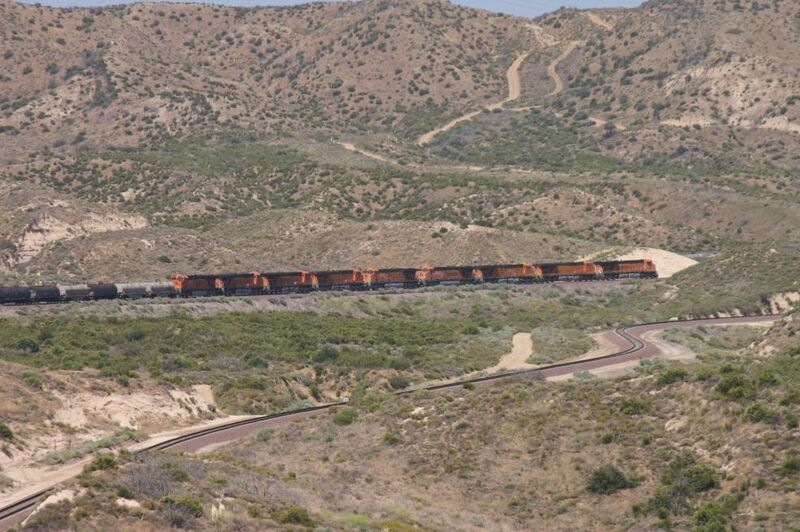 Our next train is coming downhill passing Silverwood (photo 3308). 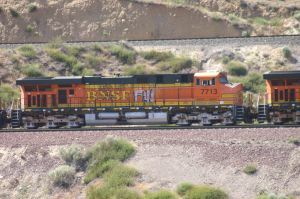 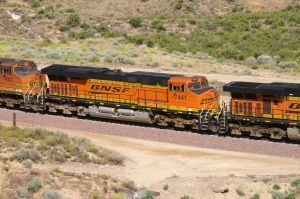 I am still on the North side of BNSF MT-1/MT-2 (double track) and of course way too far away to take pictures of this train on MT-3. 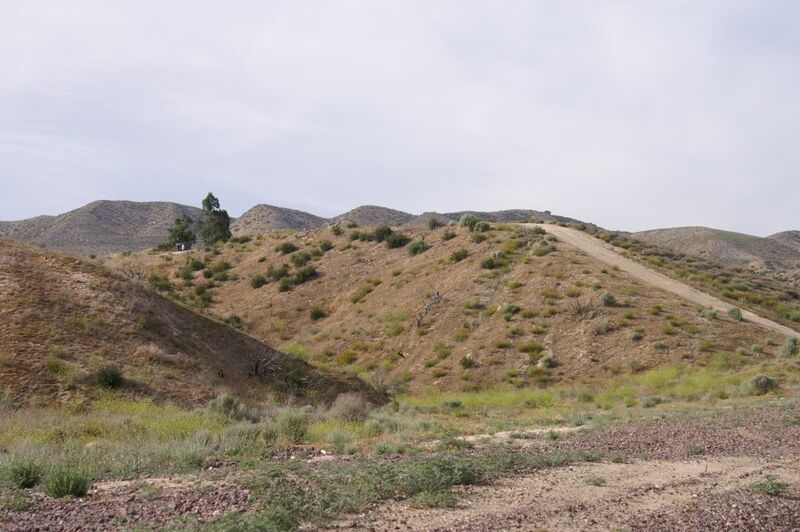 So, I have to climb Hill 582 and walk to the South side of the Hill as close as possible to get a good view of MT-3. 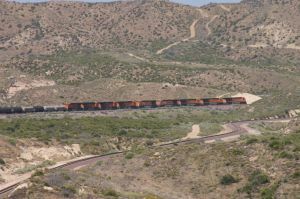 The next train is coming down on MT-2 and I have to walk back to the Hill, go down to track level and go to the sunny side. 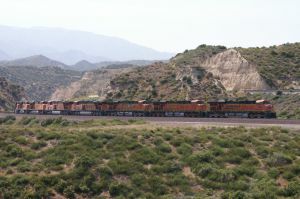 On photo 3327 we are looking East, Hill 582 is on the right side (cut), BNSF Main 1 is at left (North side) and Main 2 at right. MT-1 is actually the new 3rd Main track and MT-2 was the old North track (MT-1). 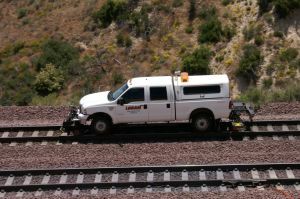 As we are already on the North side of the BNSF tracks, we are at the right place for the next train which is a UP WB double stack on MT-2. 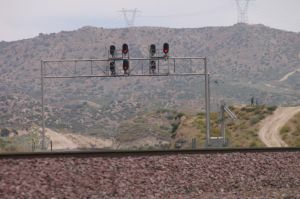 We actually moved a little bit further down and used the platform of the signal bridge to get a different view of Hill 582. 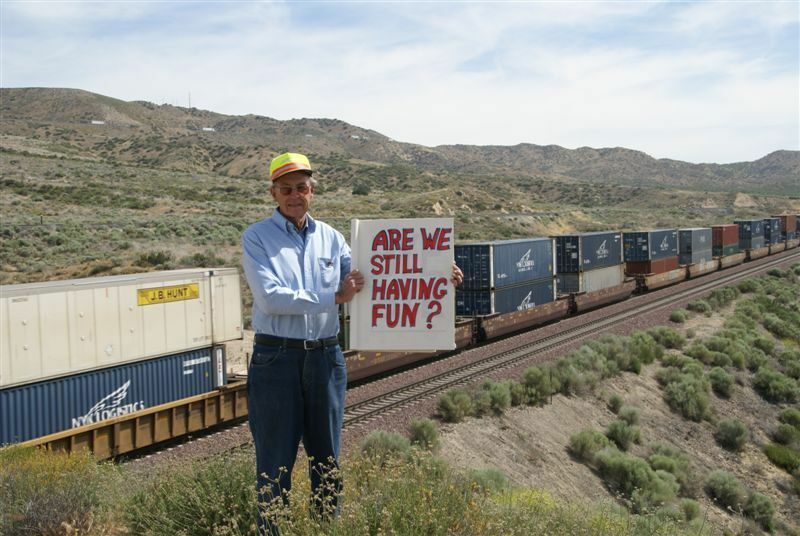 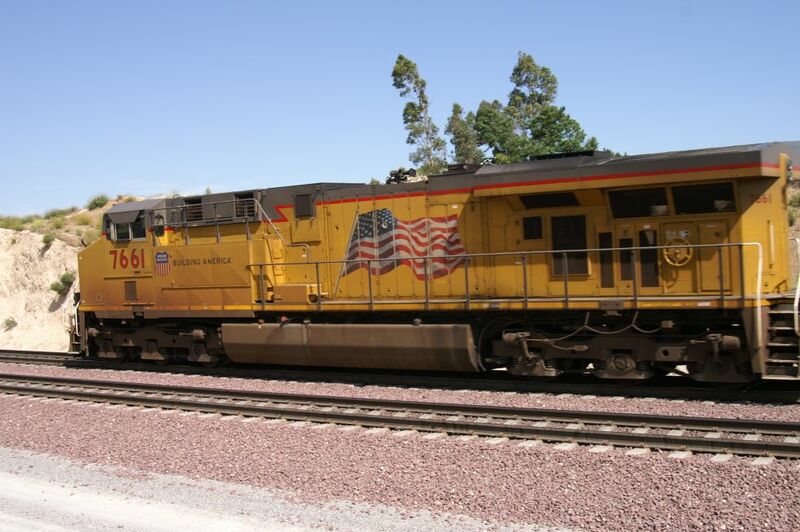 With these 2 photos we finish our super railfan's day on and around Hill 582. We (Melinda & Werner) and our 5 Swiss friends (Matthias, Nicole, Stefan, Diego and Eugen) say goodbye to the best location at Cajon Pass. 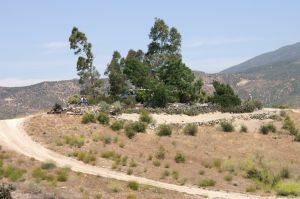 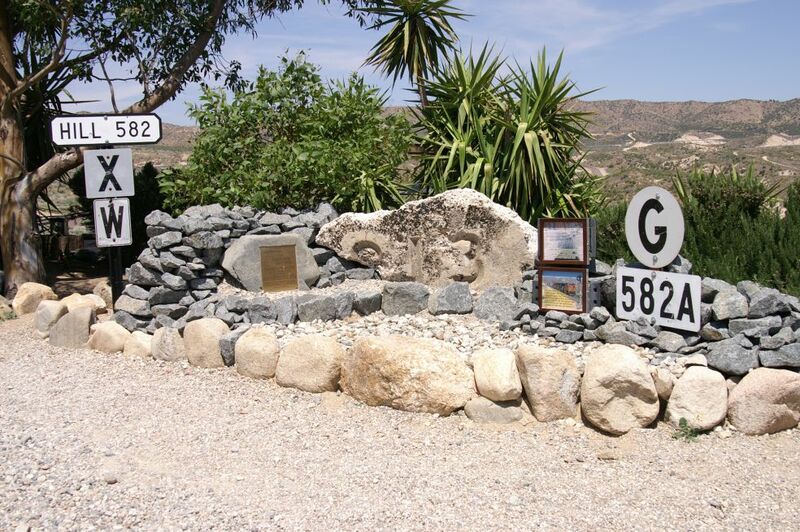 Tomorrow, we (Stefan & Werner) will be flying over Cajon Pass with a Cessna. 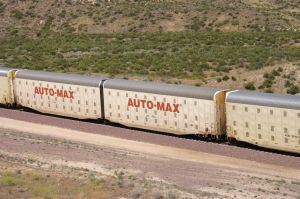 These aerial photos are already online. 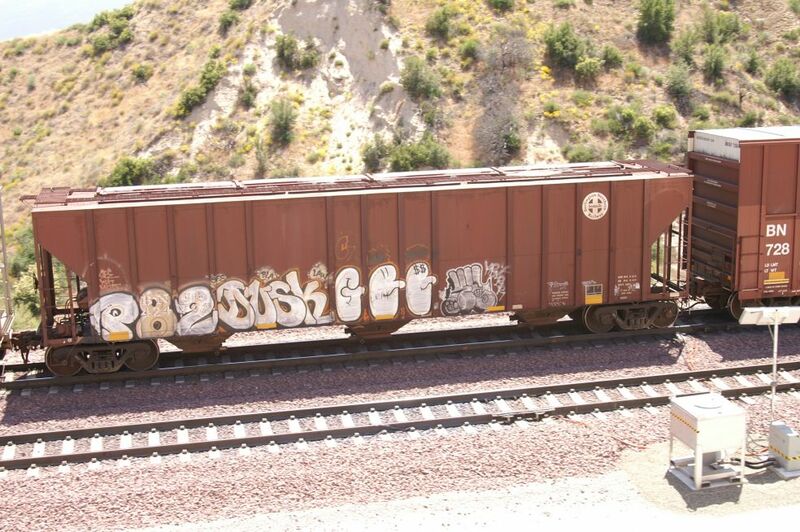 Did you see Part 3 ?